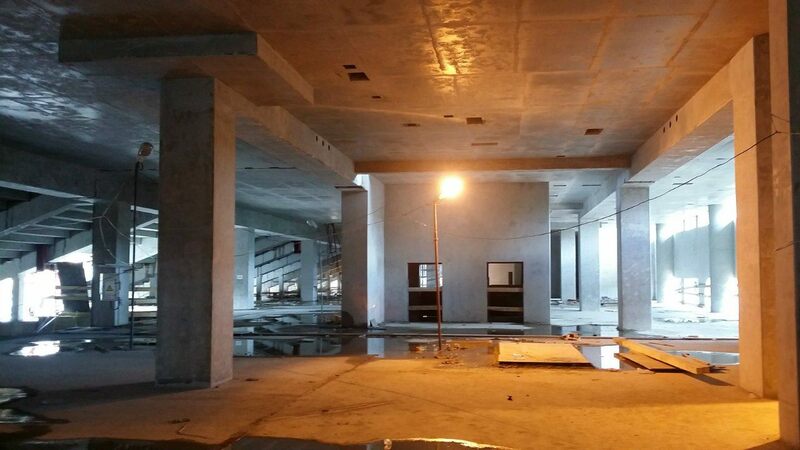 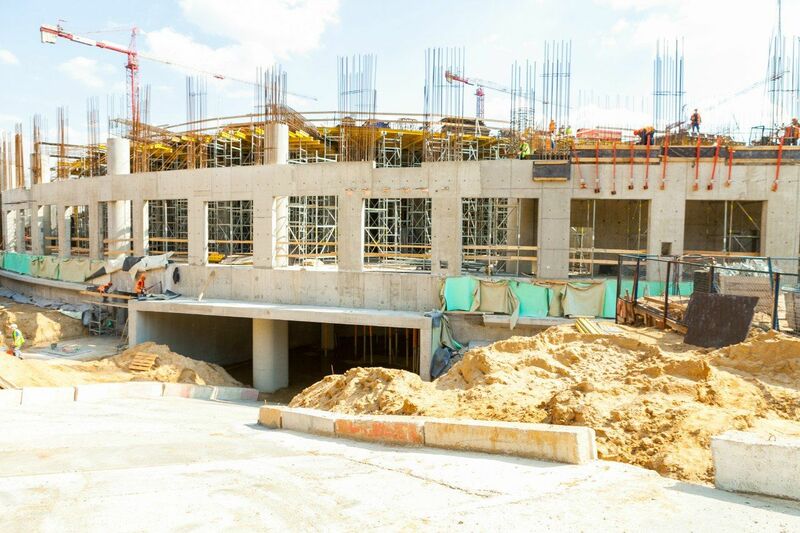 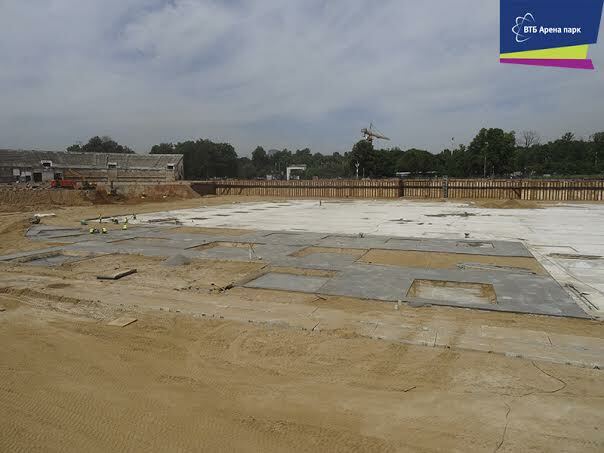 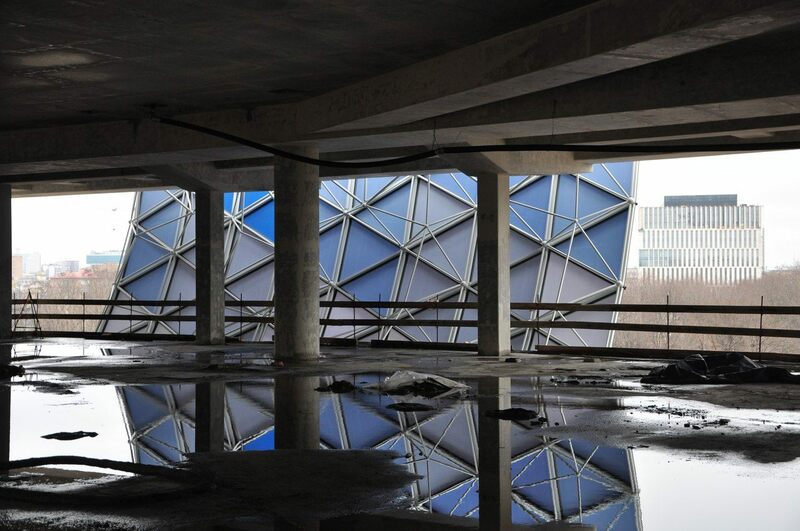 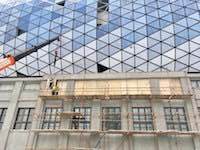 indoor hall for 12 000 seats, office and retail complex, extensive underground parking facilities. 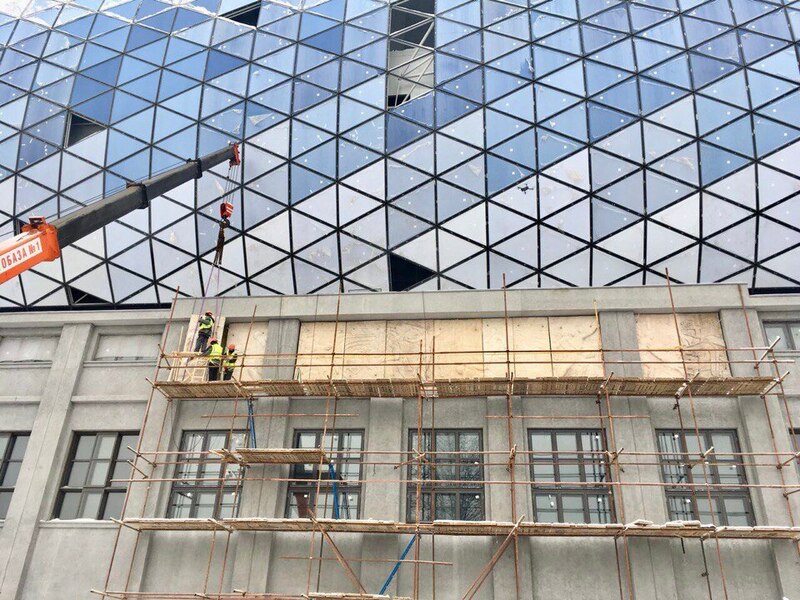 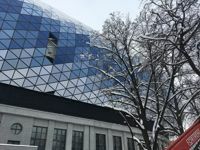 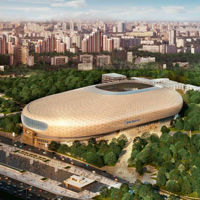 Additionally, 5-star hotel, 4 office buildings, several apartment blocks, conference centre and sports academy for Dynamo. 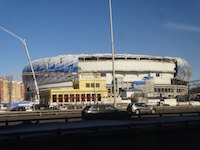 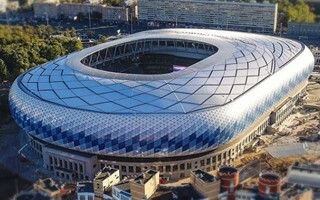 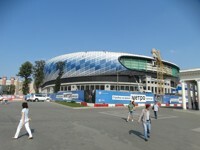 Initial concept was presented in 2010, before Russia officially announced their bid to host the 2018 World Cup. 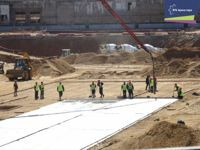 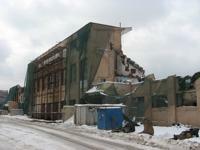 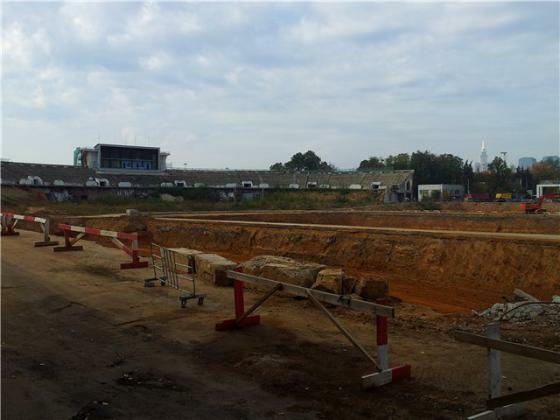 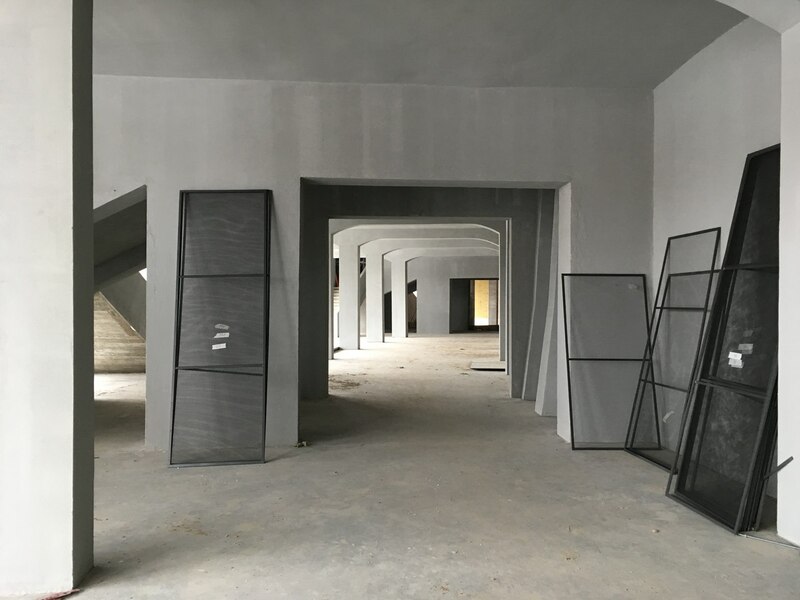 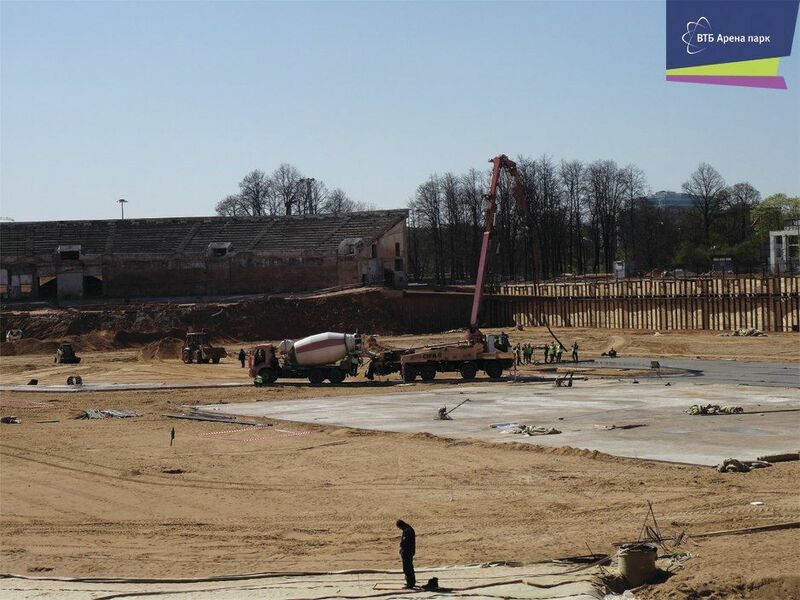 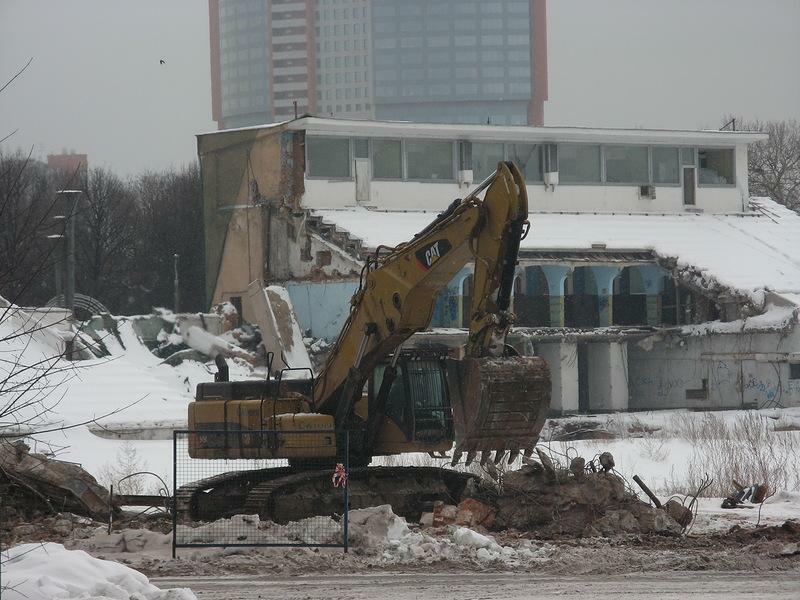 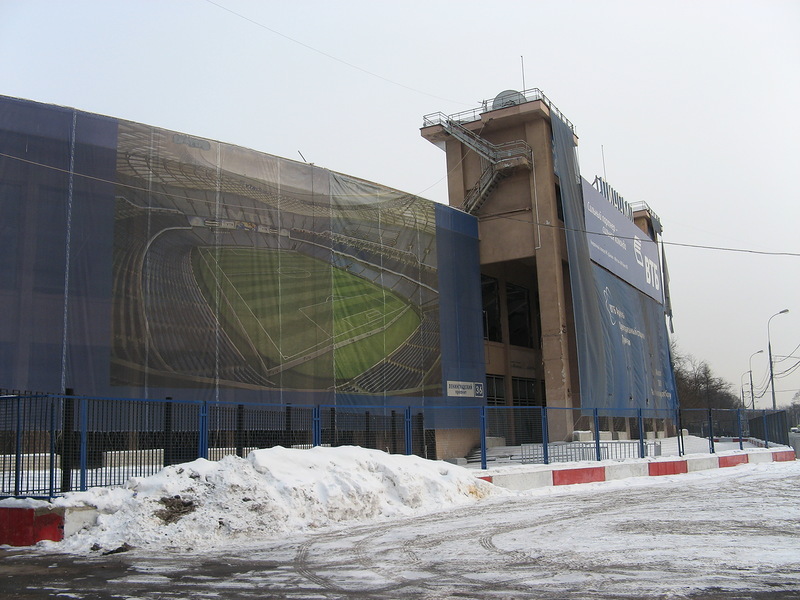 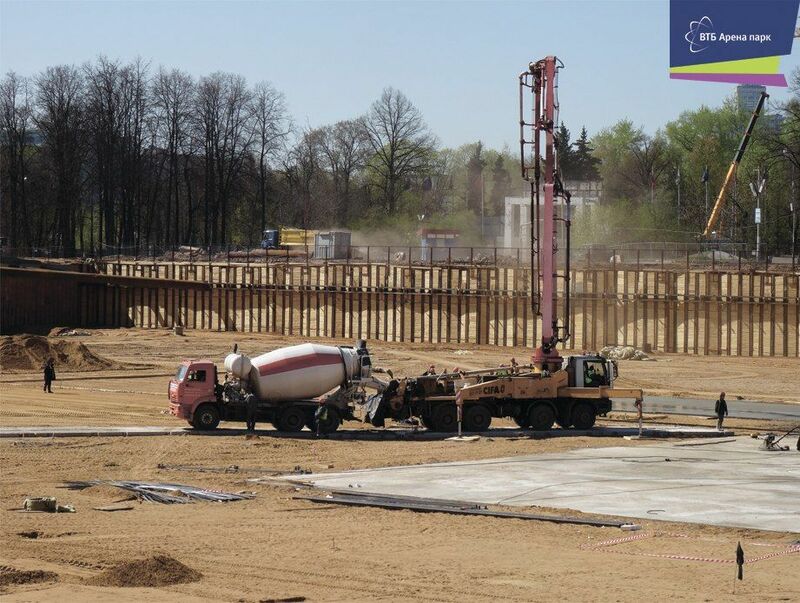 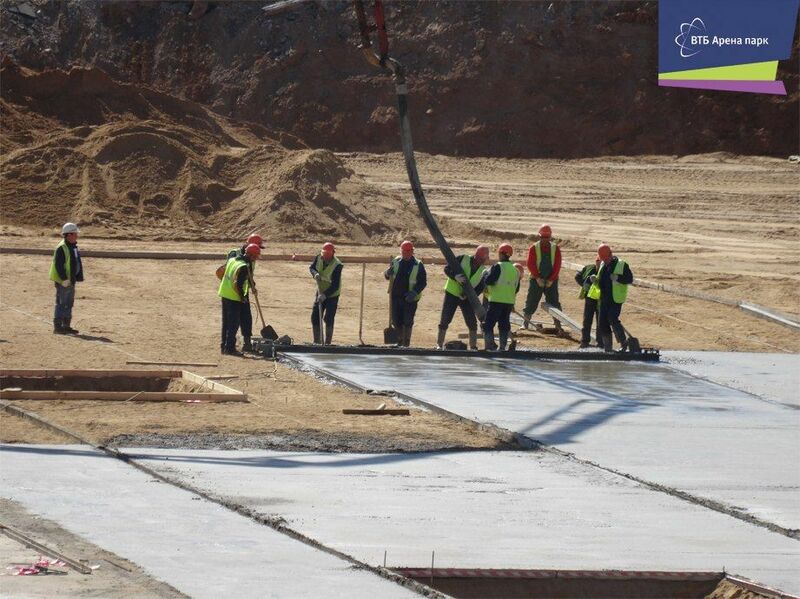 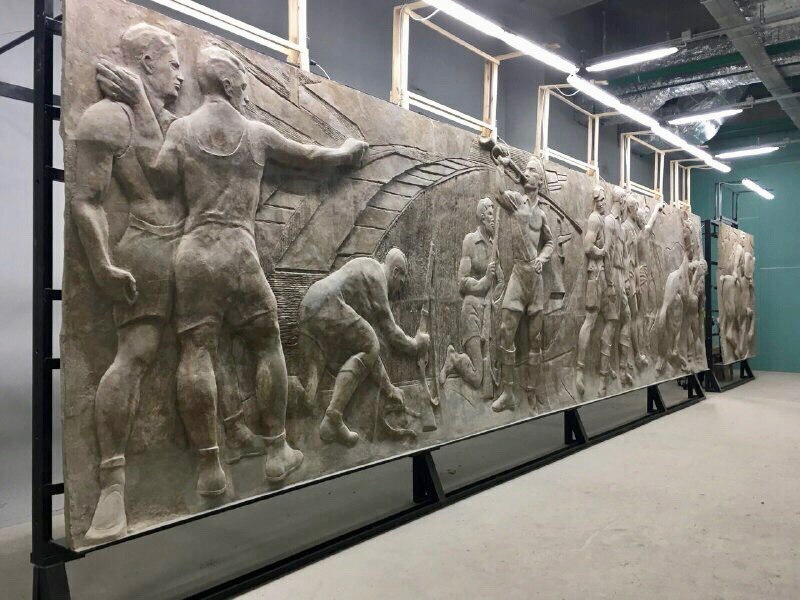 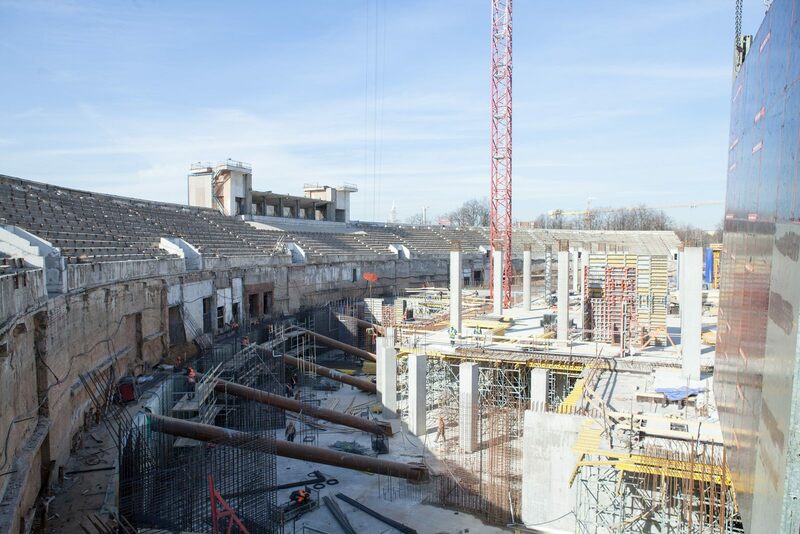 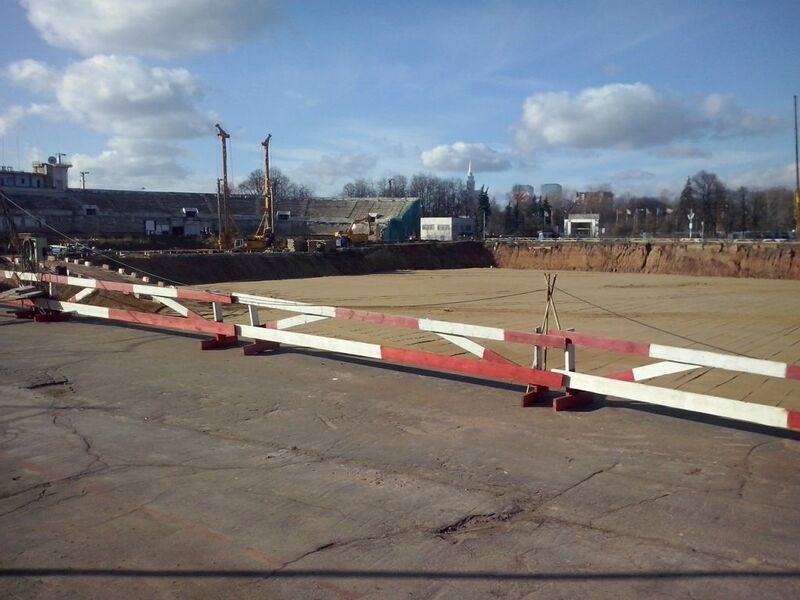 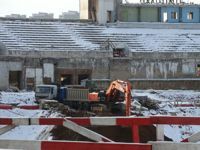 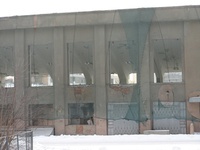 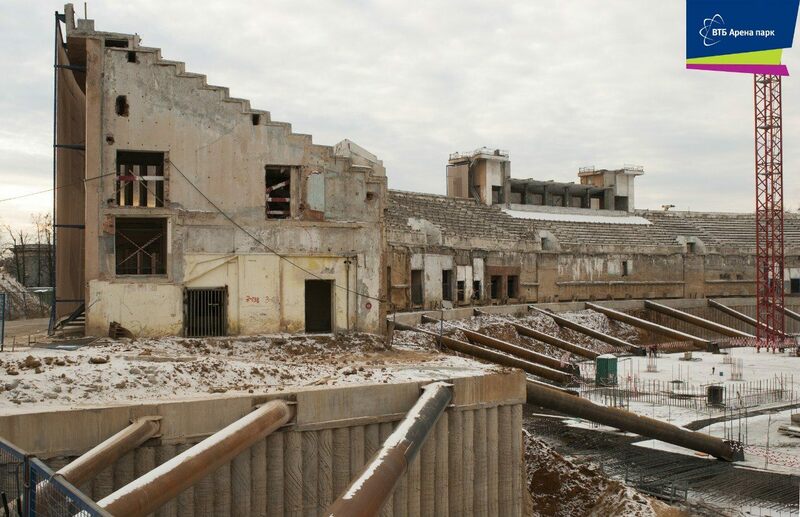 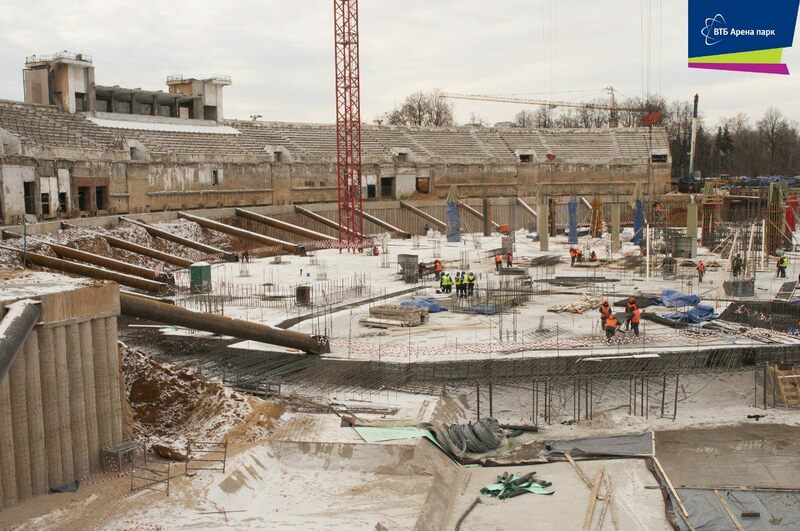 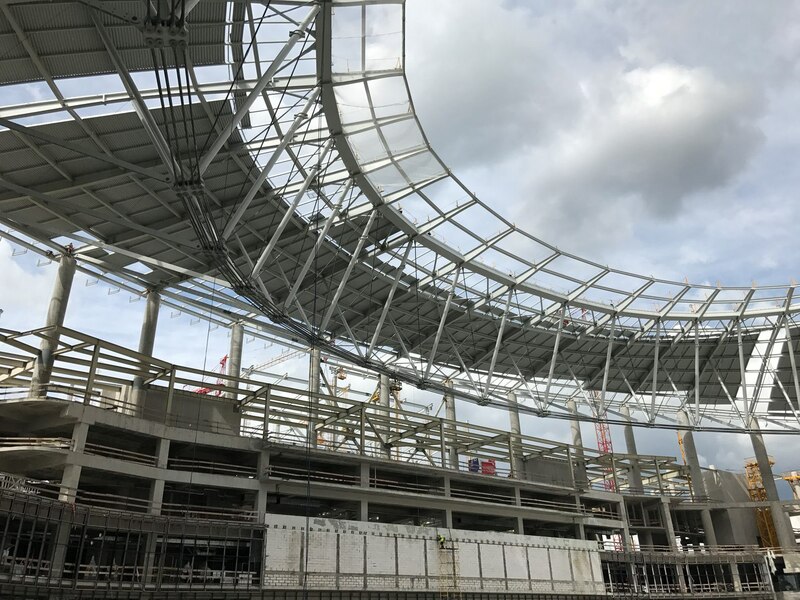 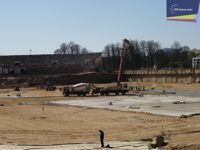 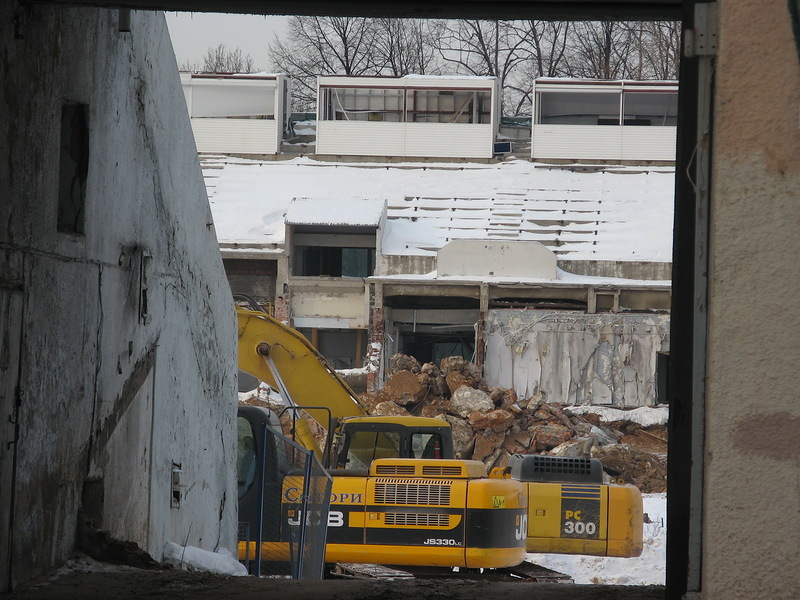 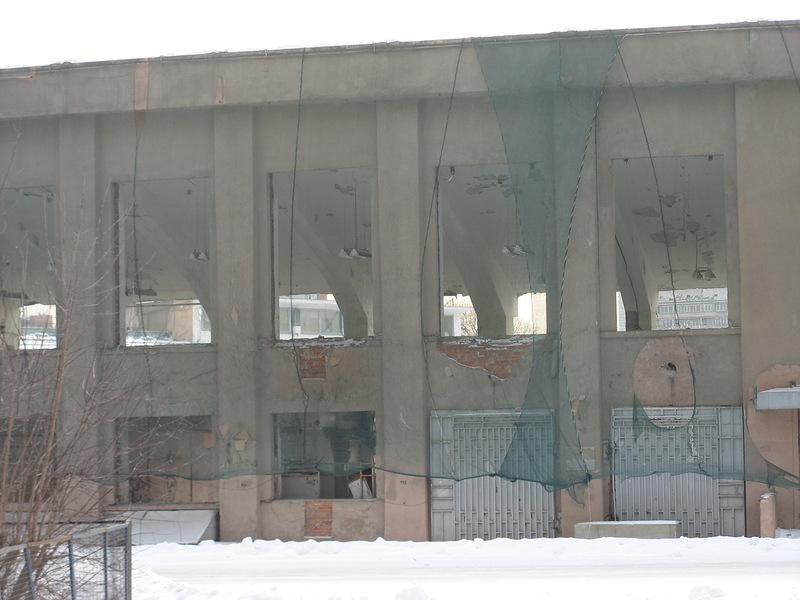 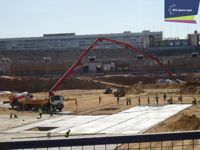 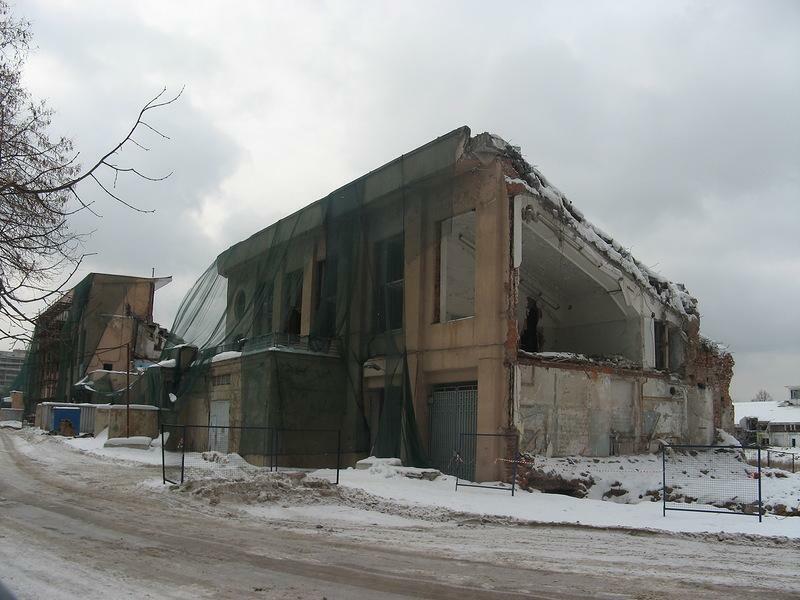 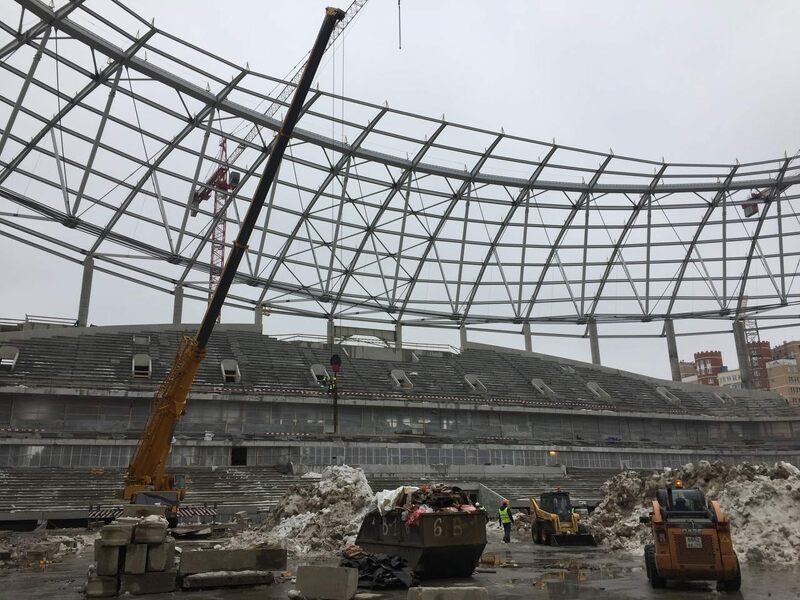 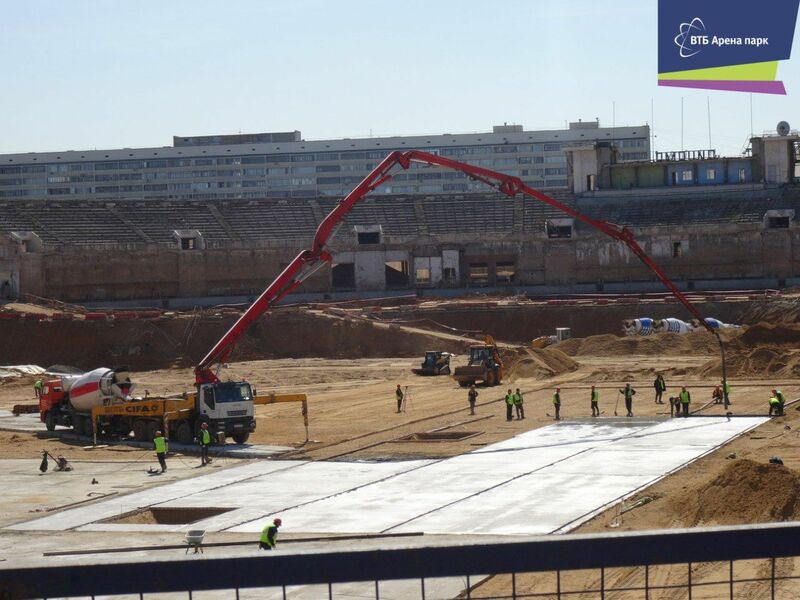 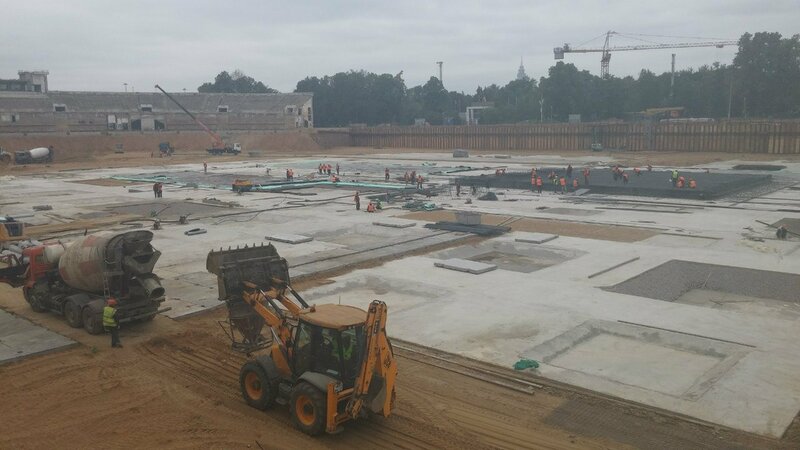 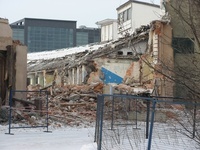 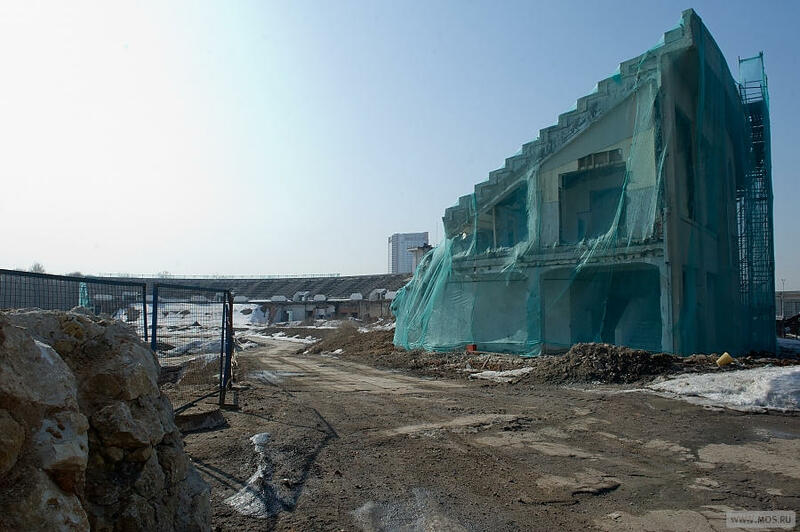 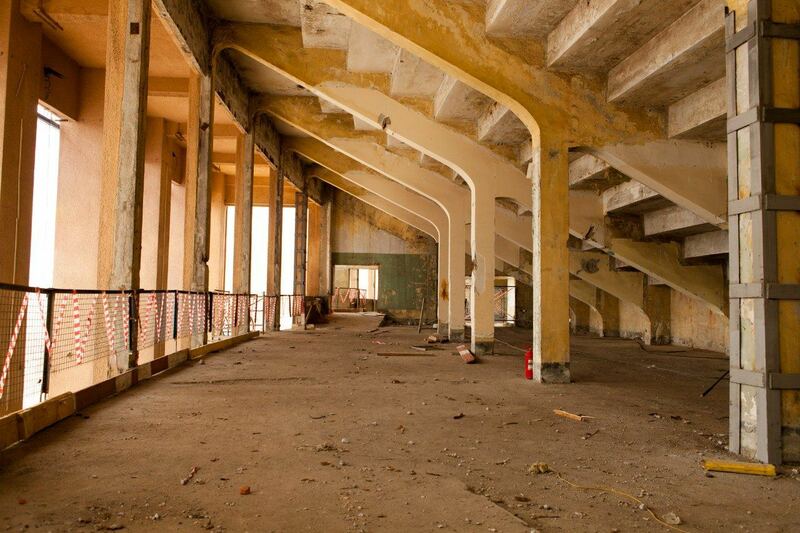 The plan was to fit a new stadium and indoor hall inside the existing historical bowl of Stadion Dinamo. 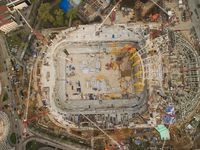 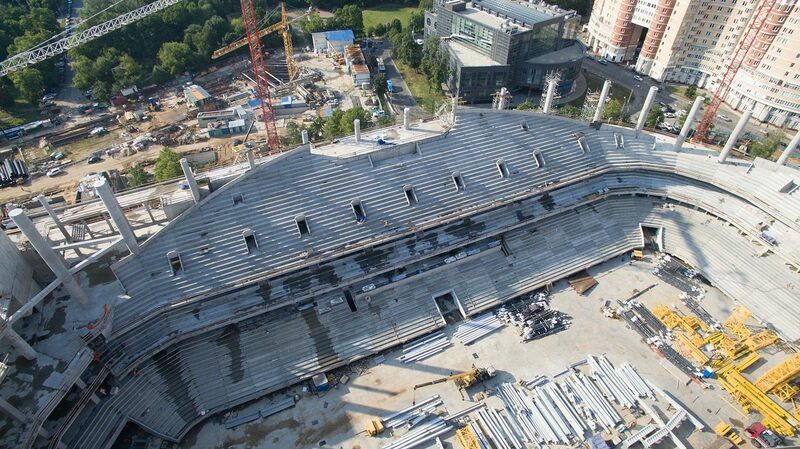 The new football-specific stadium was to hold up to 45,000 people, while multi-sport hall another 12,770. 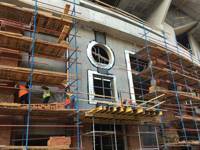 In 2011-2012 the design was evolving, which in practice meant mostly scaling down by Manica Architecture. 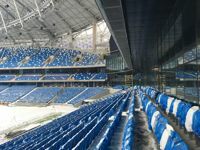 This was partly associated with the venue not being selected for the 2018 tournament by FIFA, making its satisfying capacity below 30,000. 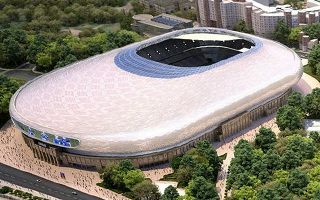 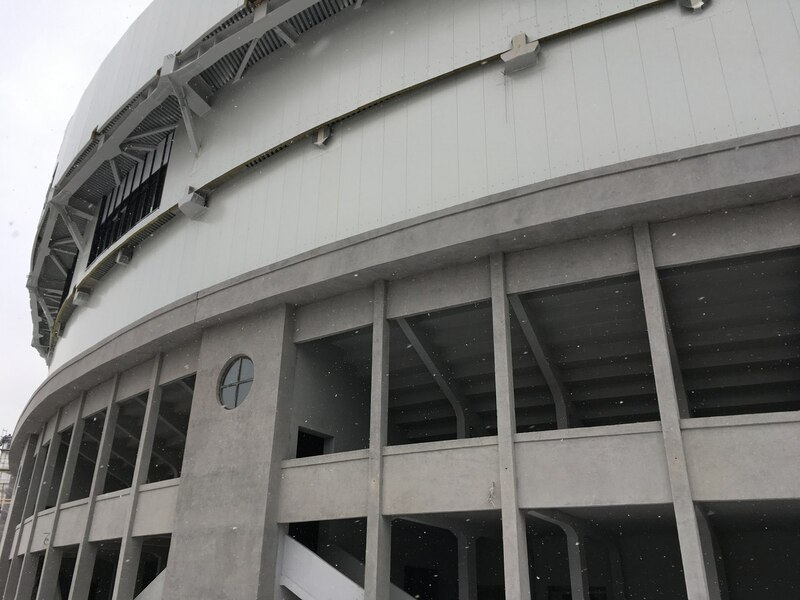 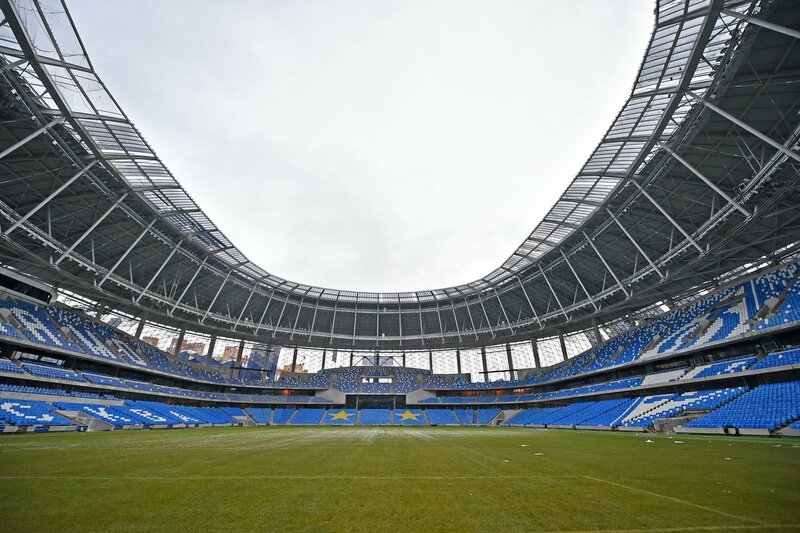 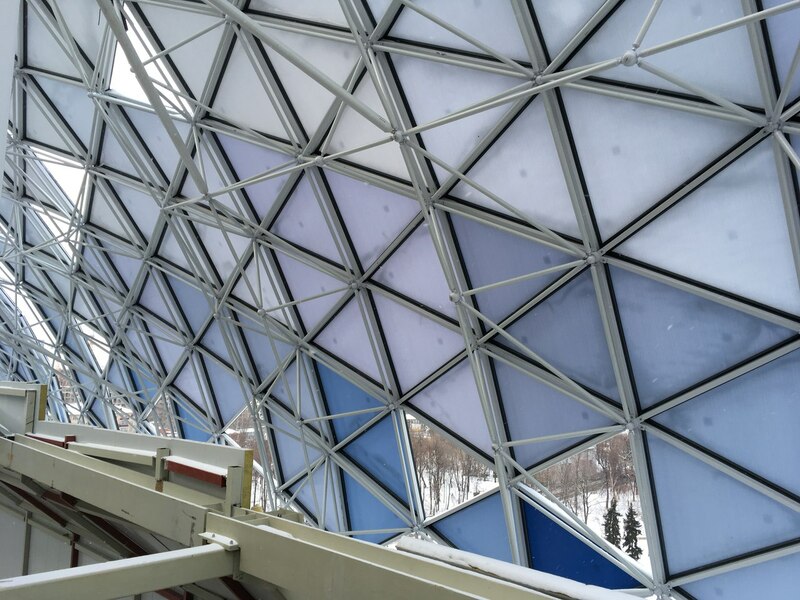 Staircases were fitted inside the bowl instead of outside, retractable roof was scrapped, while external cladding got simplified. 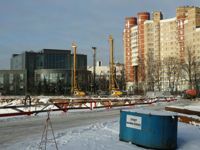 All this allowed for estimated cost to halve. 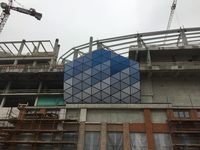 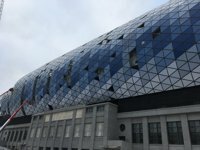 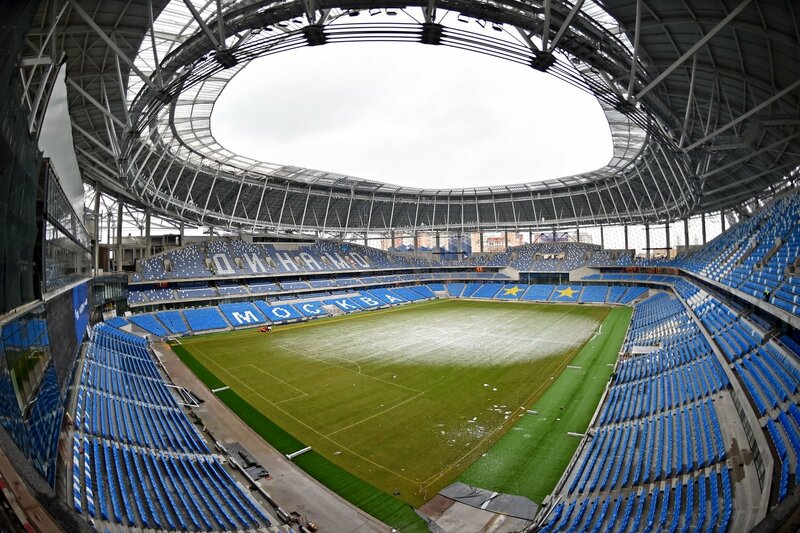 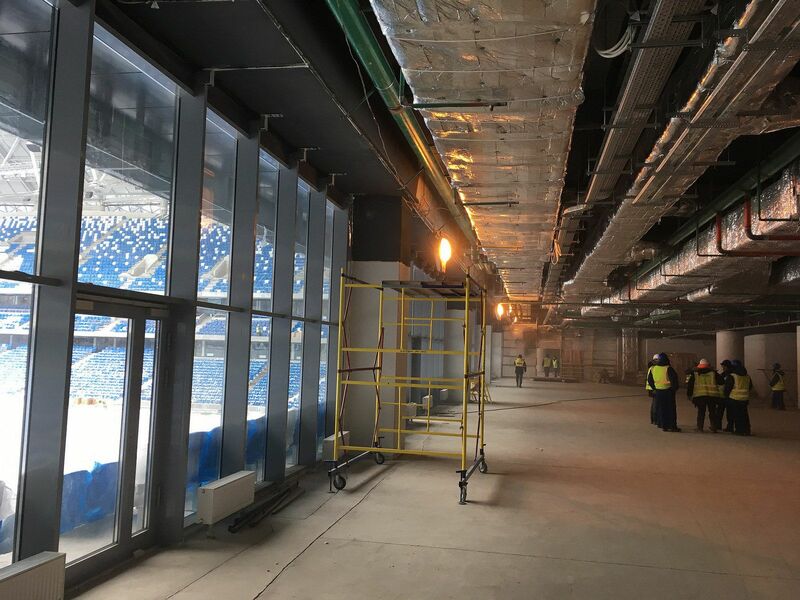 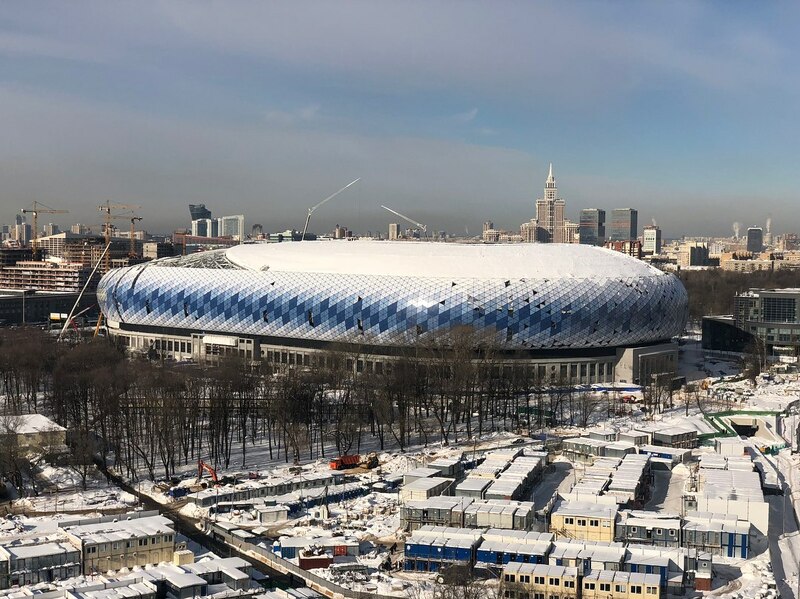 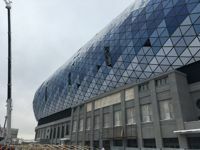 Though it was supposed to open in 2017 and then 2018, the new home of Dynamo Moskva will not host its first football game before March, 2019. 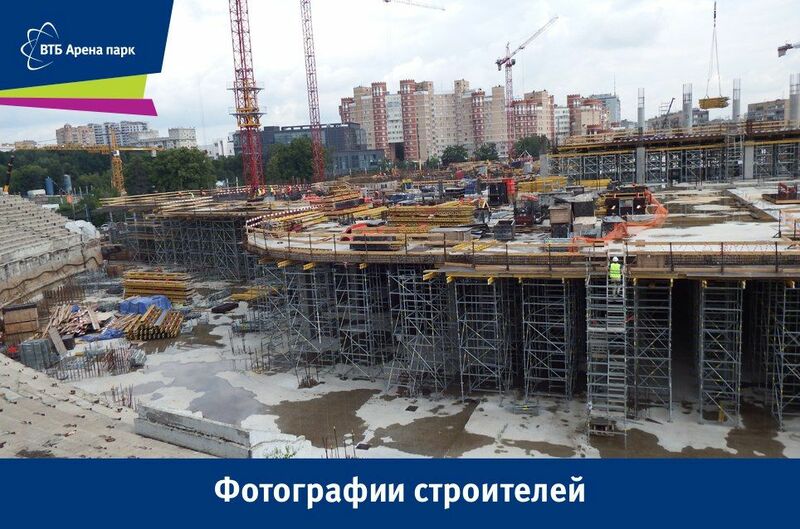 Meanwhile, VTB has settled naming rights for the first 4 years in operation. 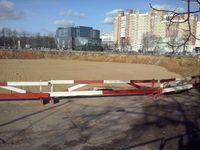 It sounds like a paradox and almost is. 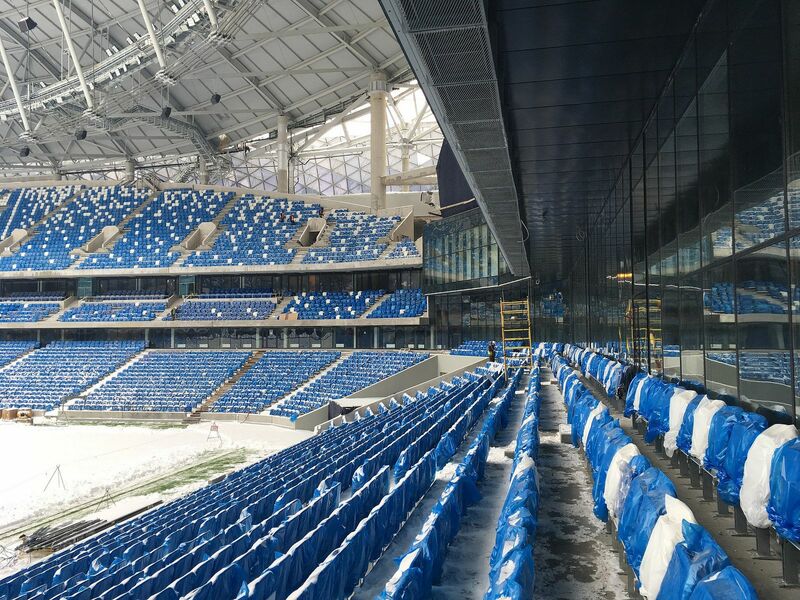 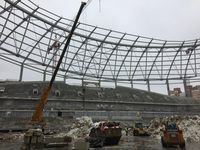 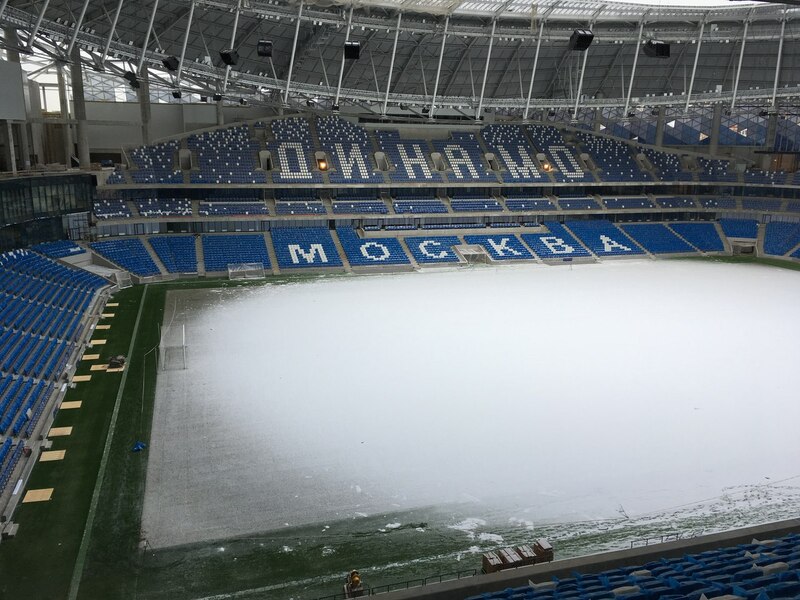 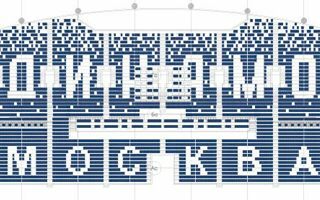 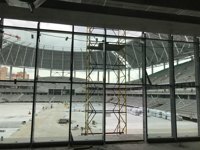 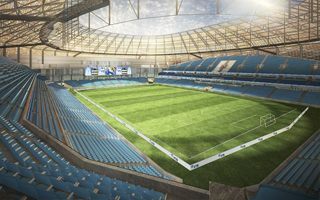 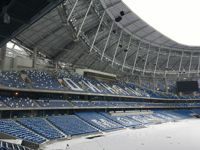 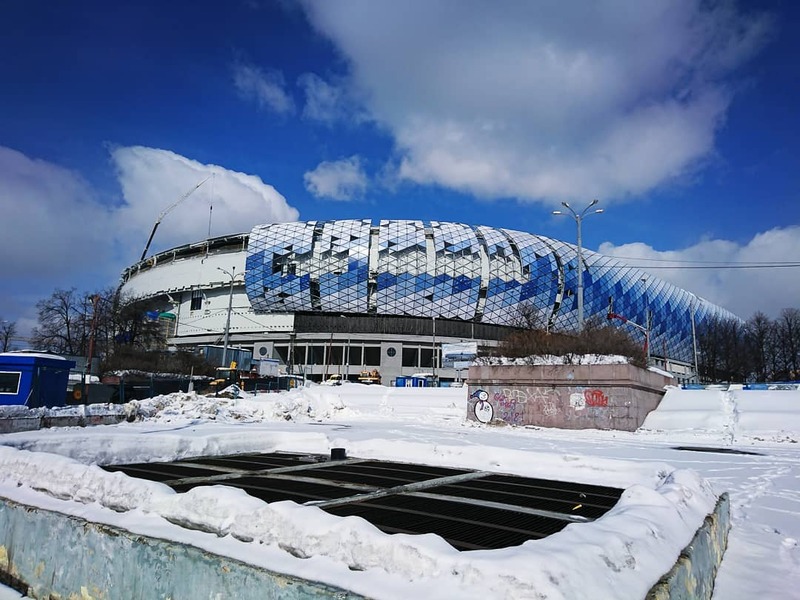 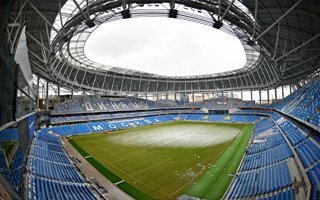 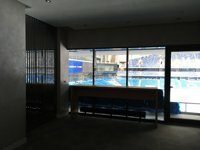 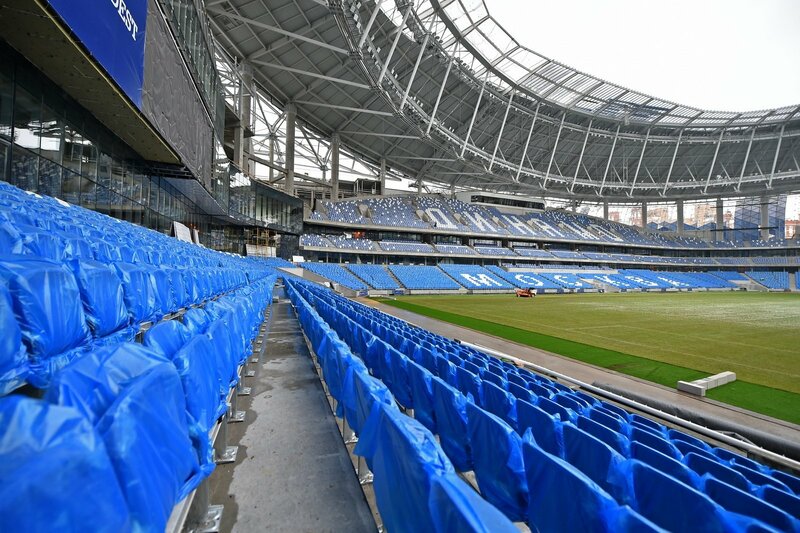 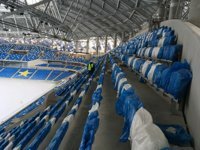 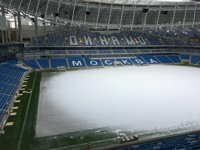 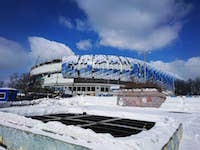 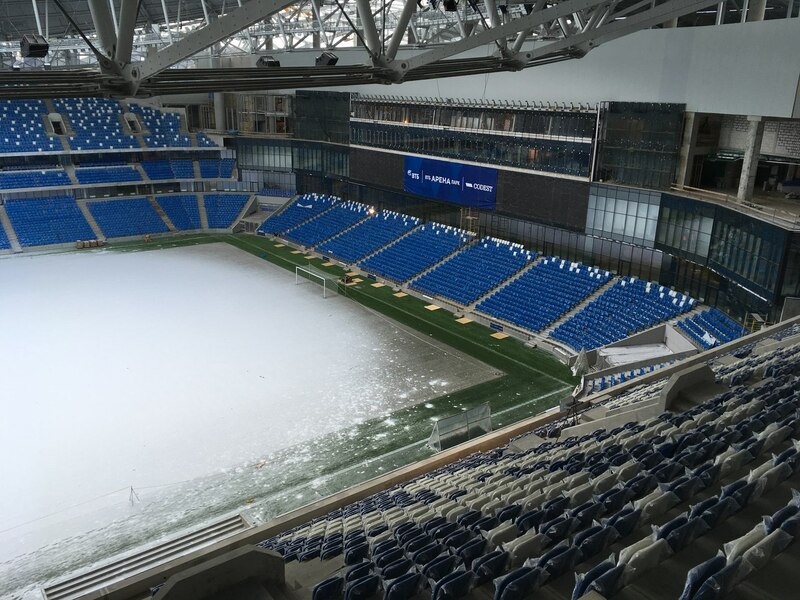 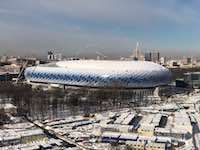 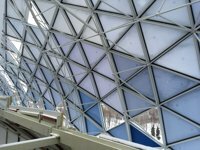 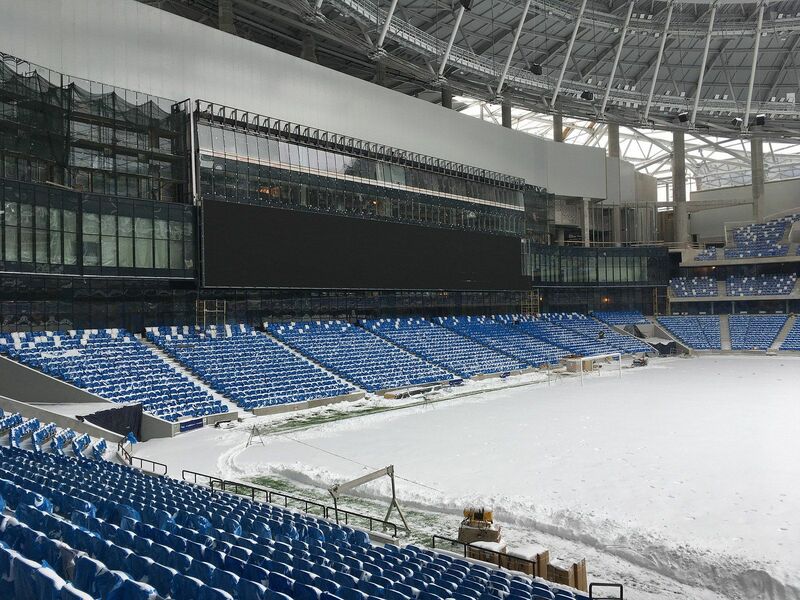 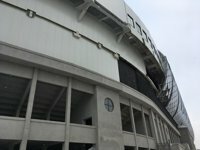 Due to ownership changes FC Dynamo and VTB Arena are no longer the same group, forcing them to negotiate terms of stadium use. 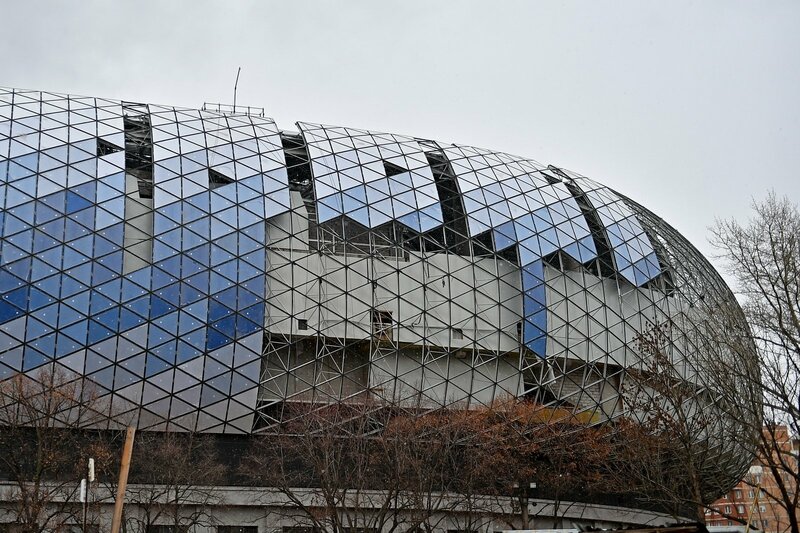 And a few months before opening there is no agreement. 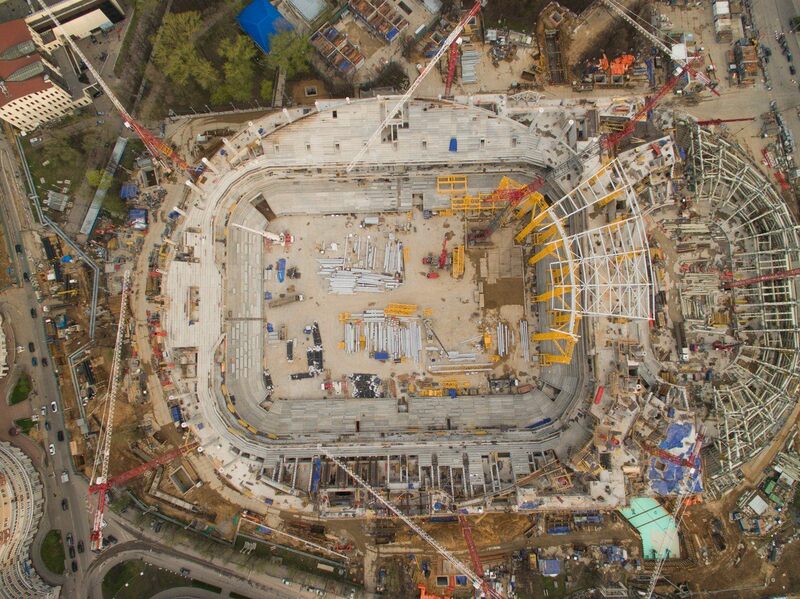 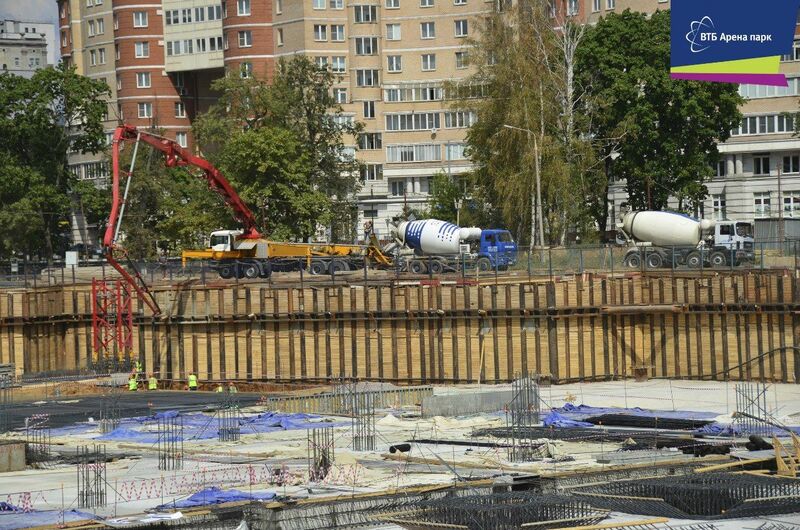 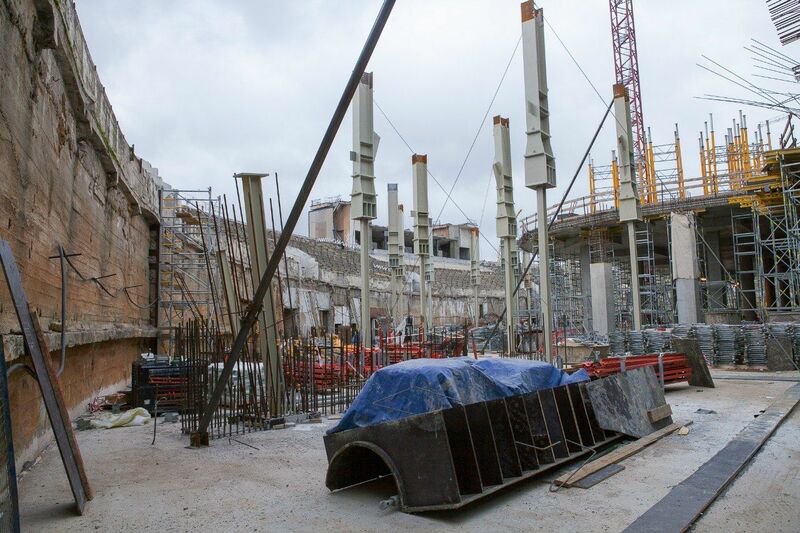 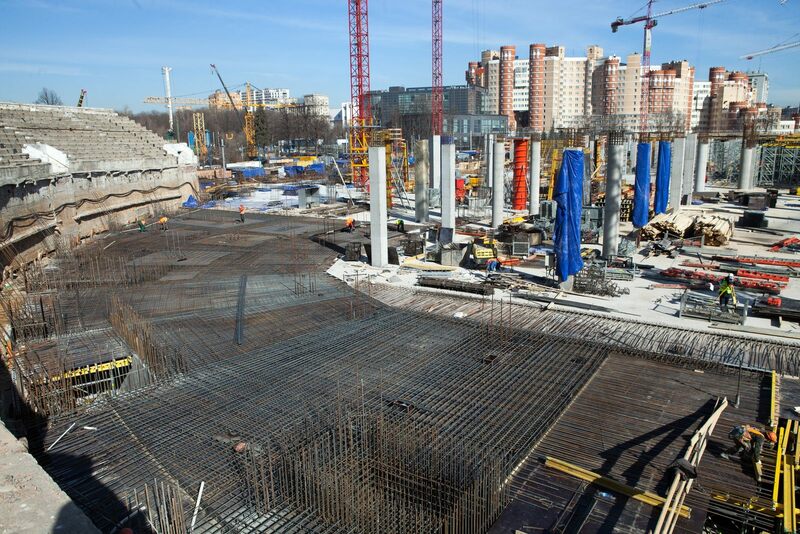 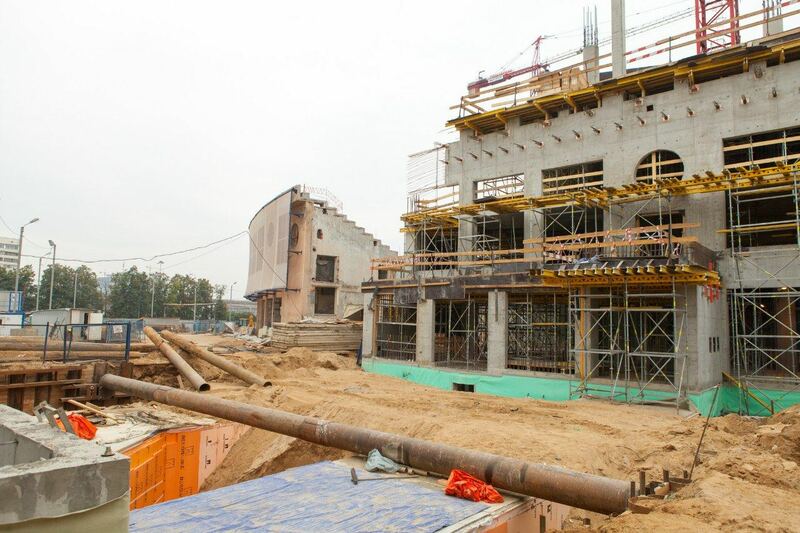 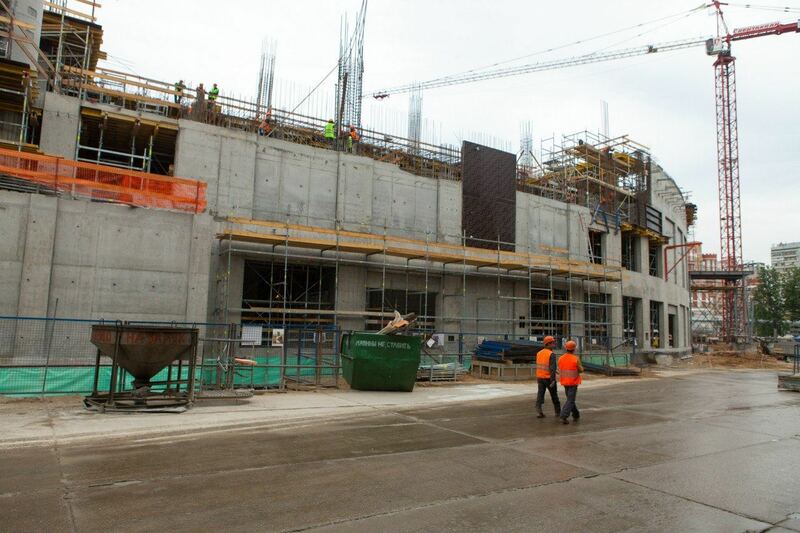 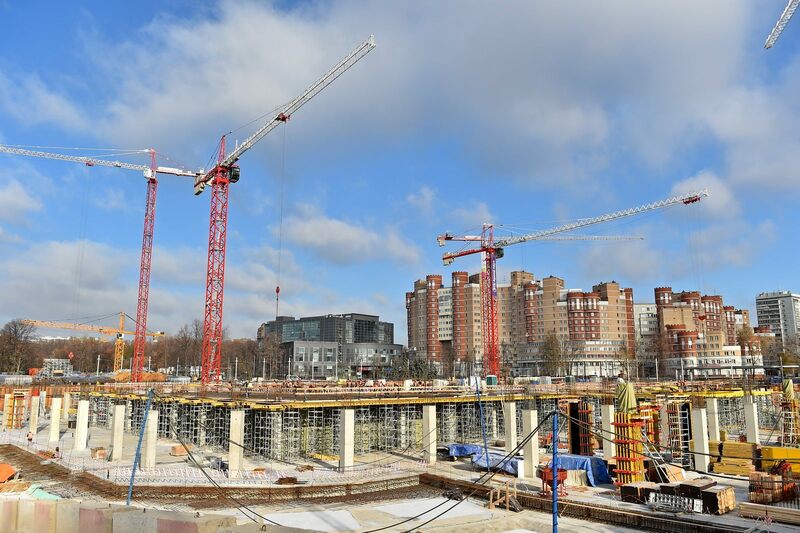 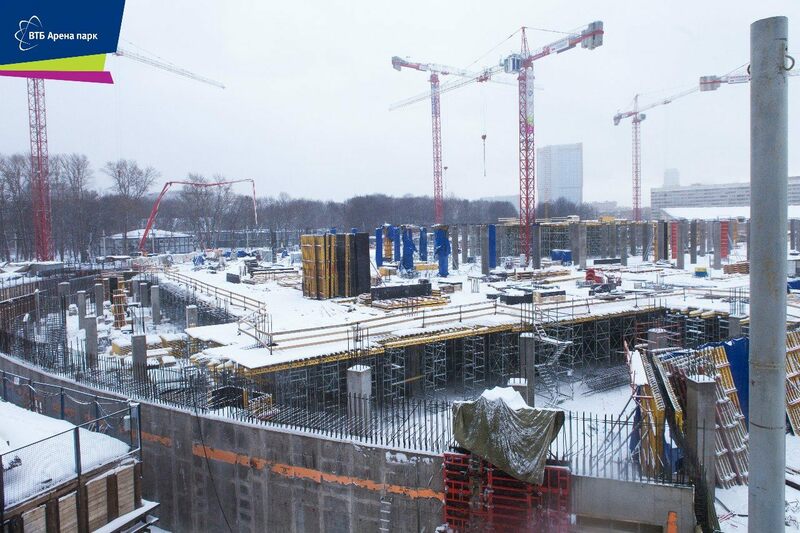 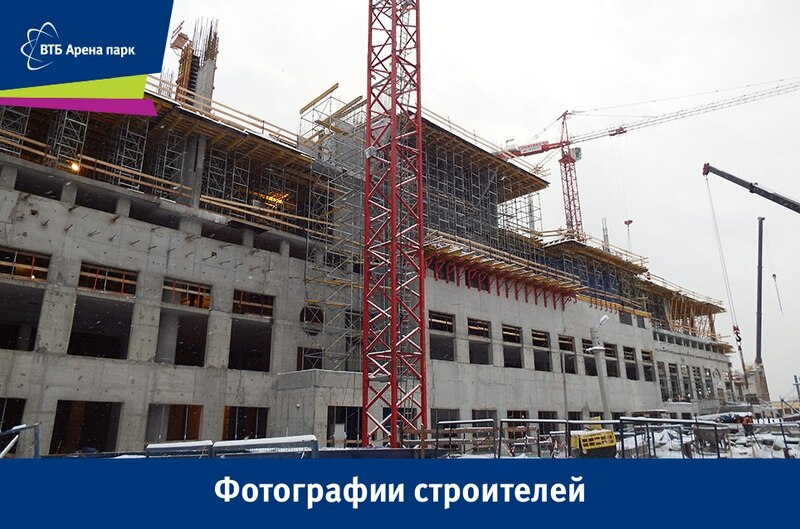 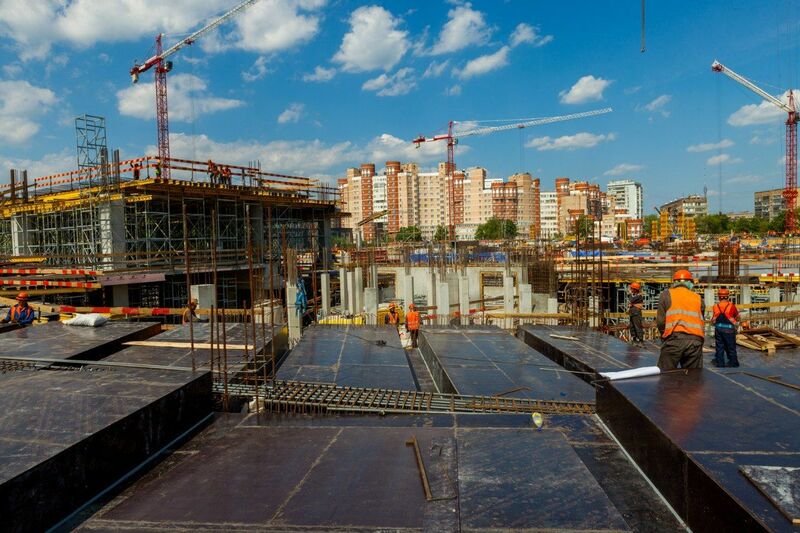 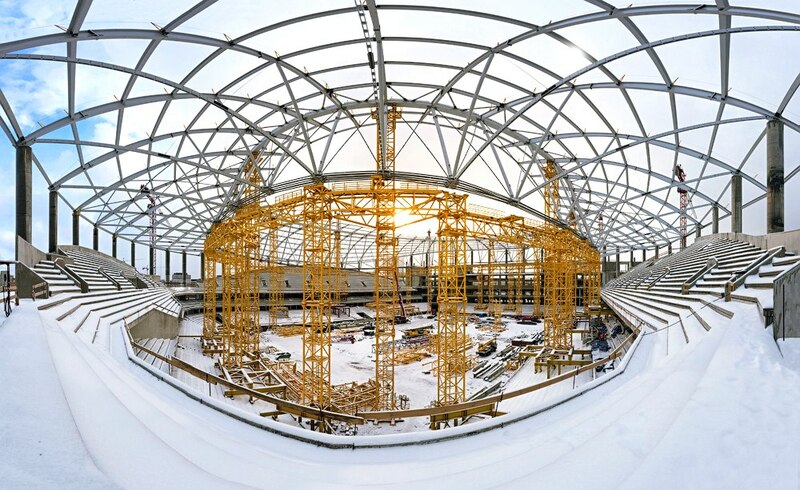 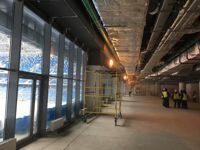 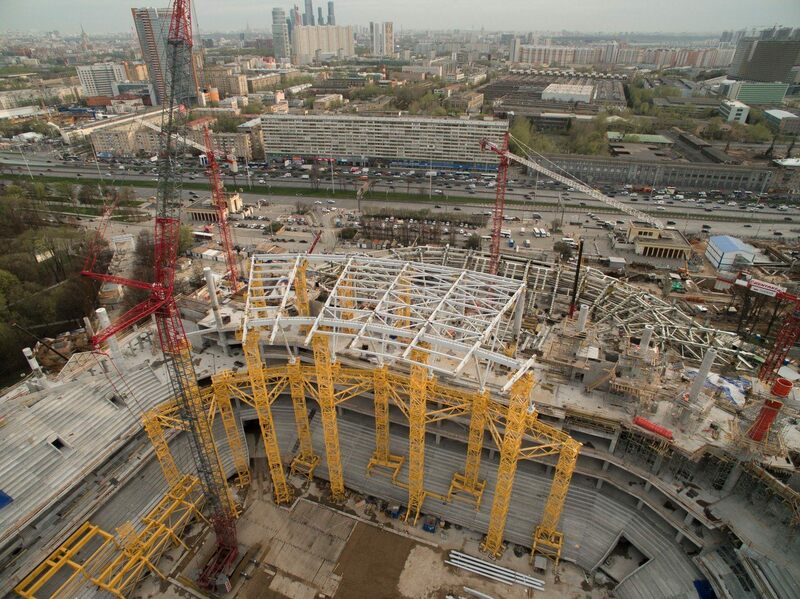 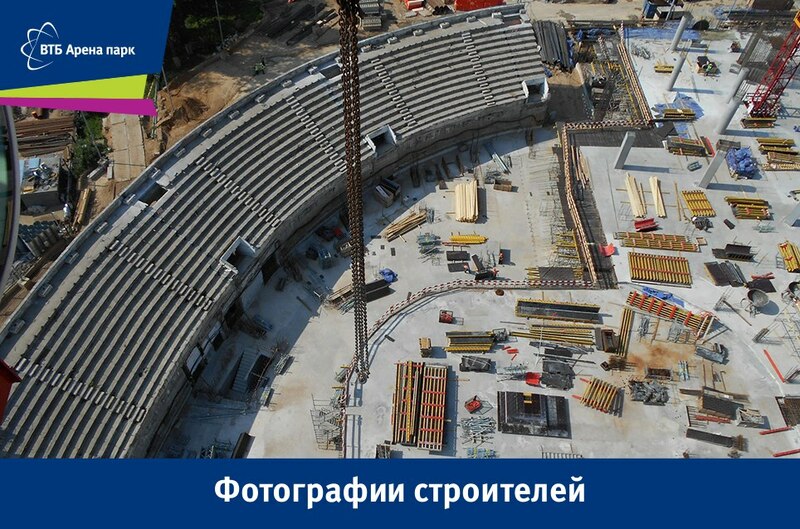 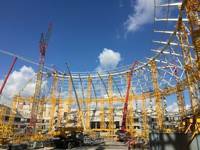 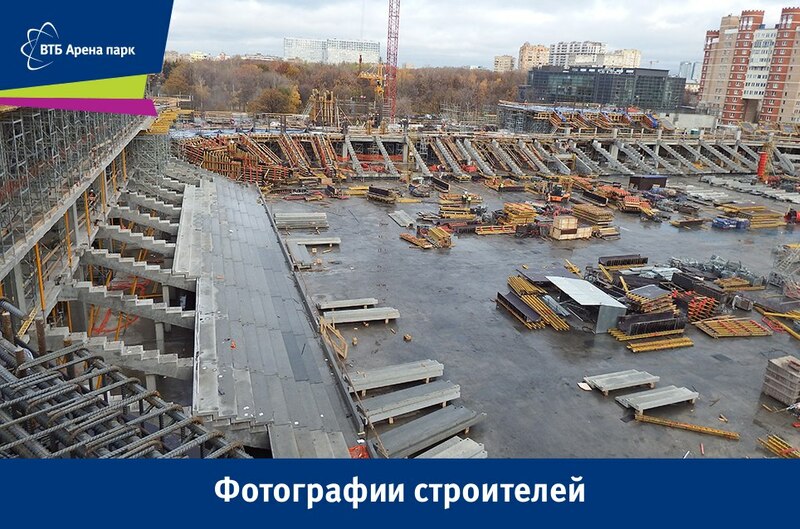 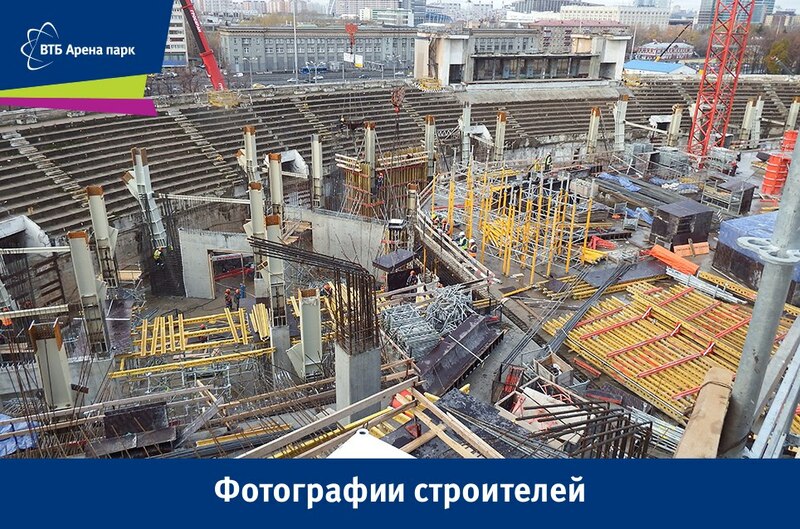 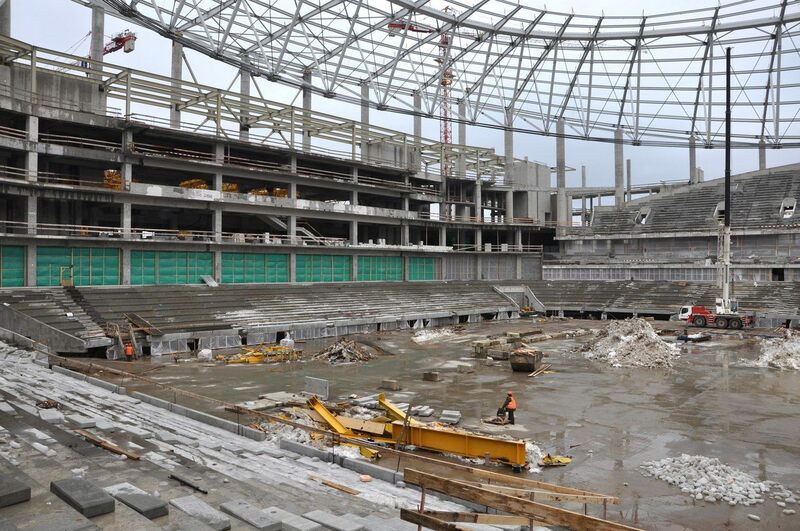 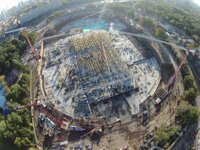 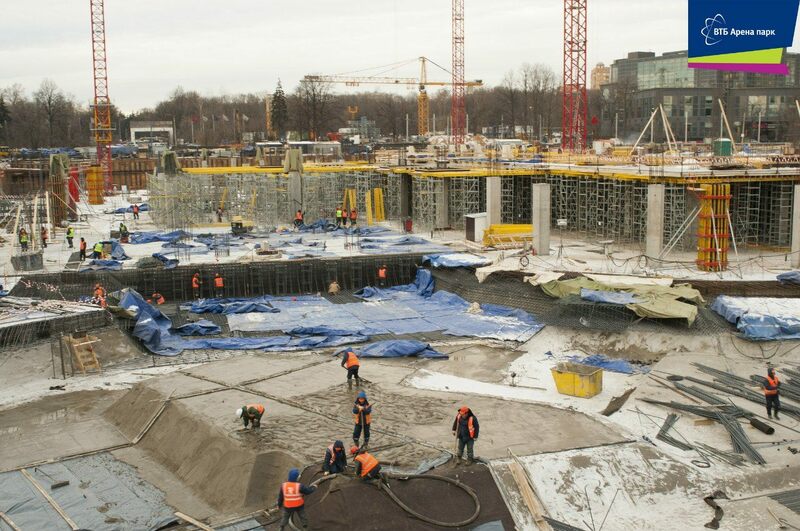 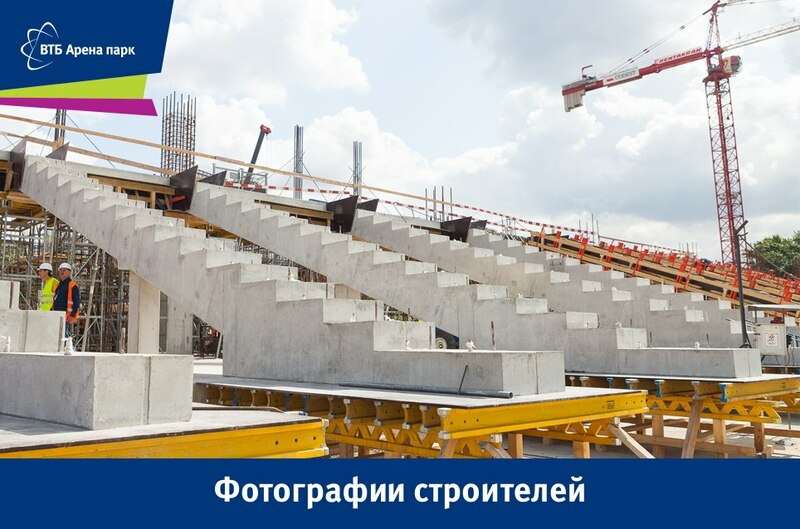 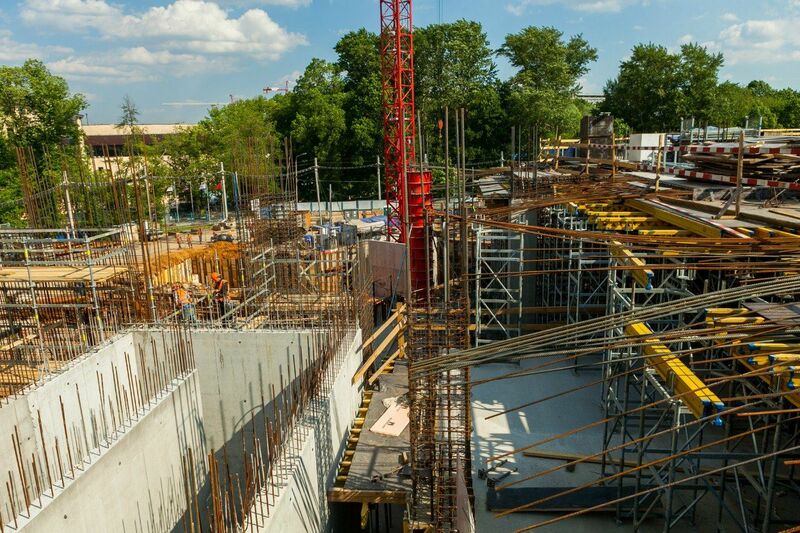 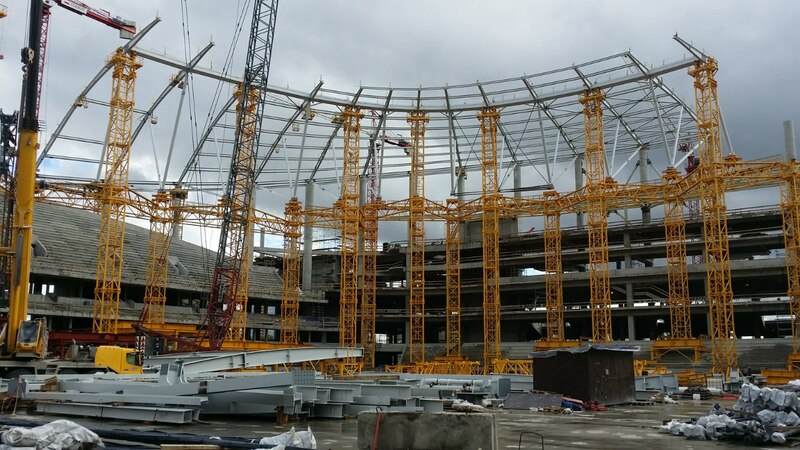 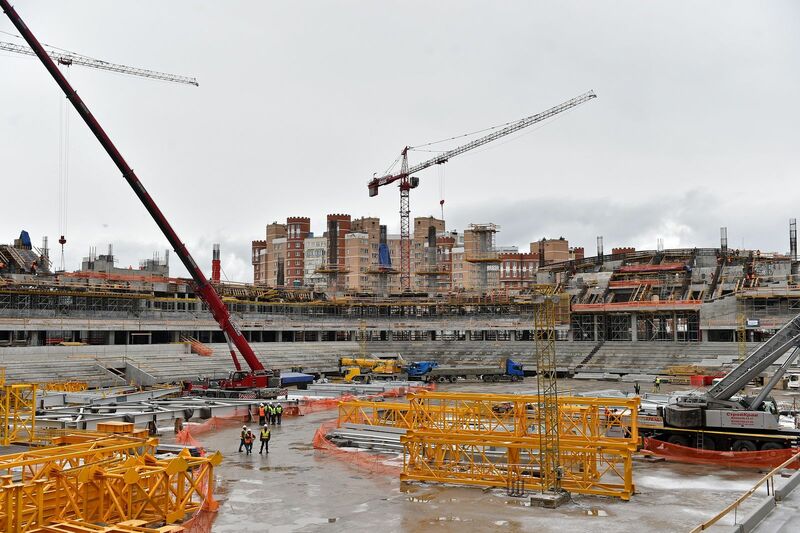 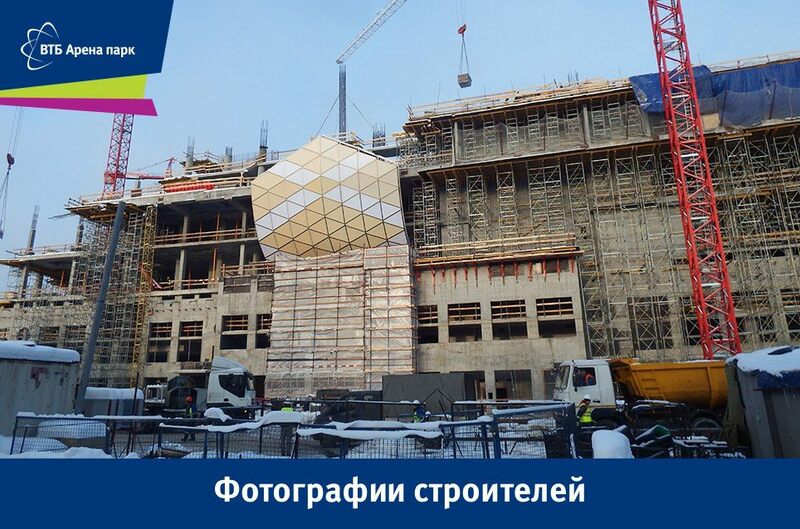 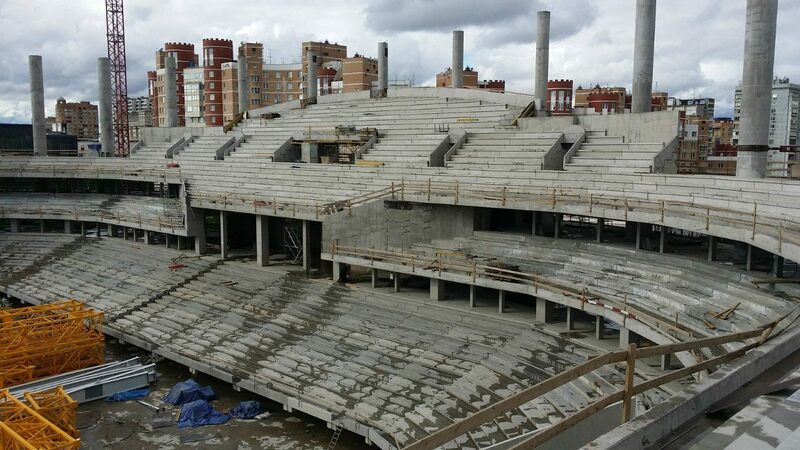 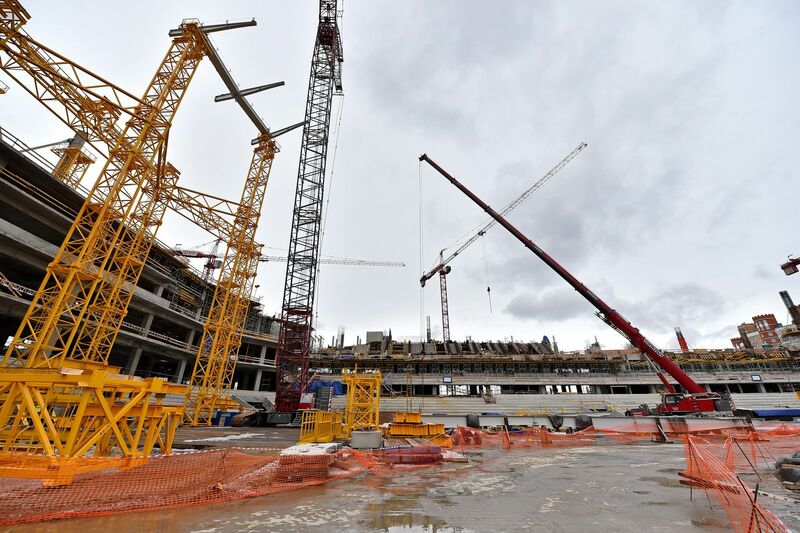 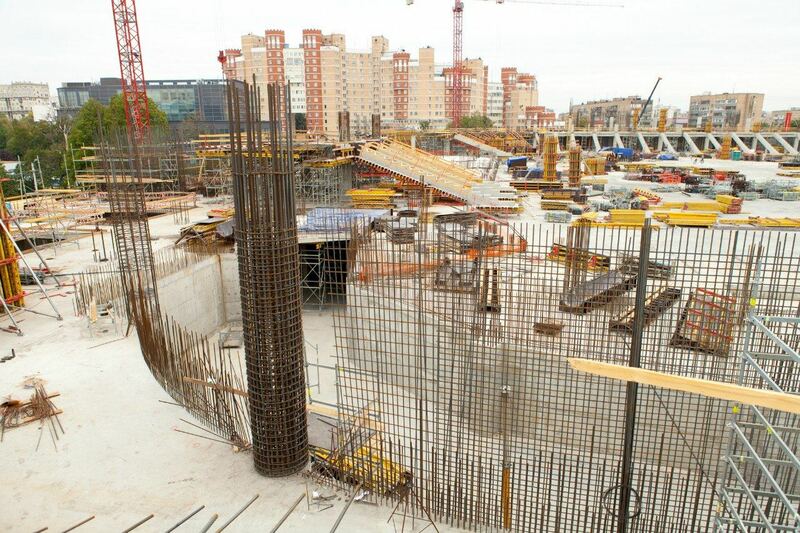 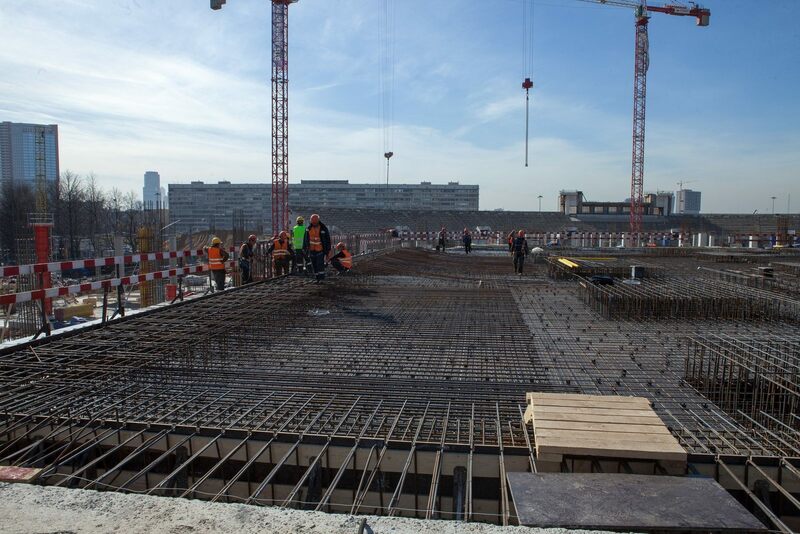 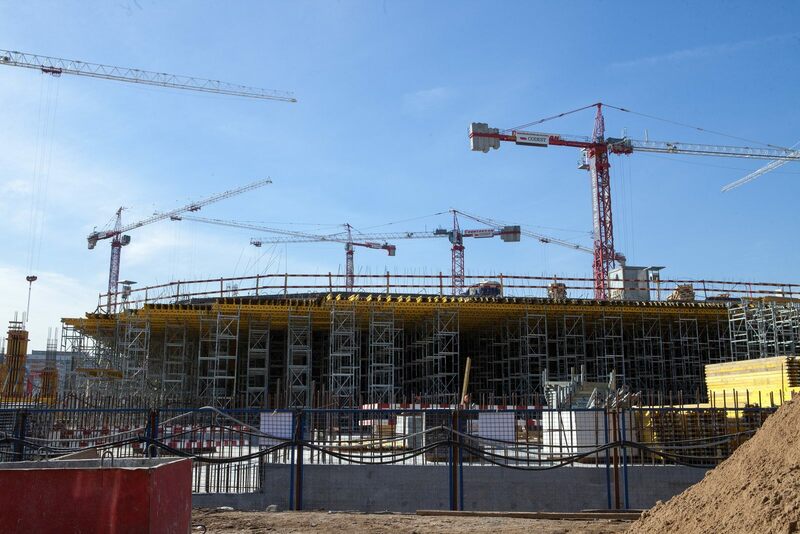 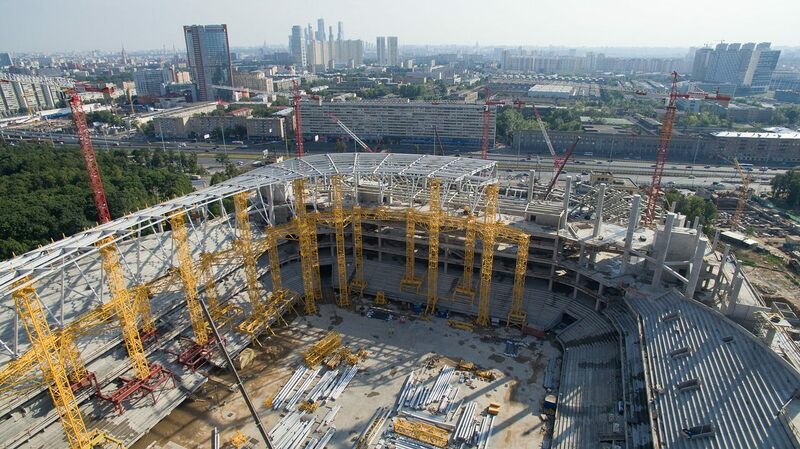 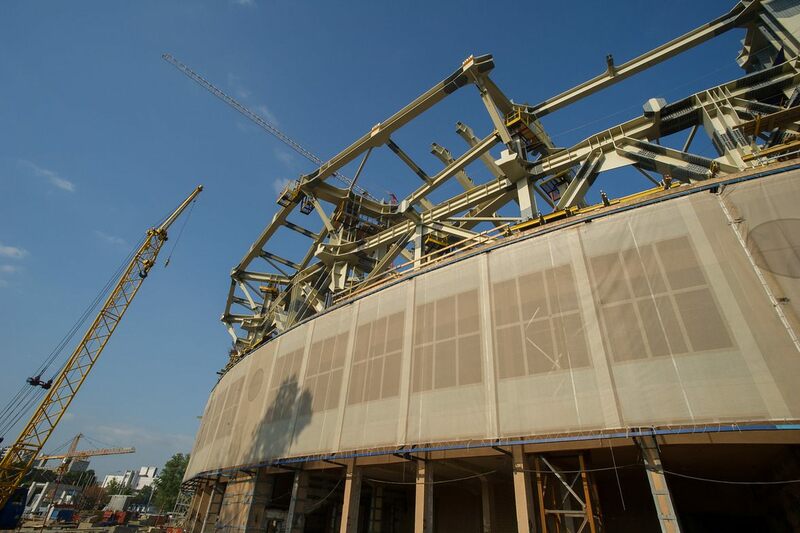 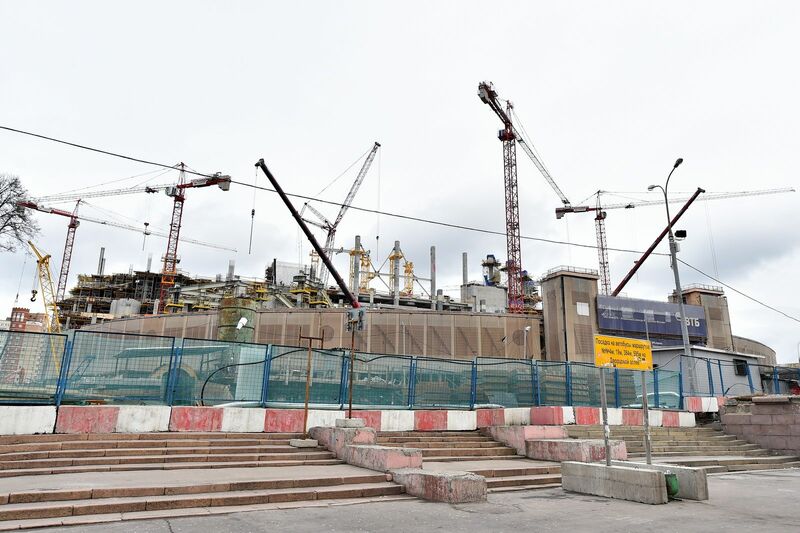 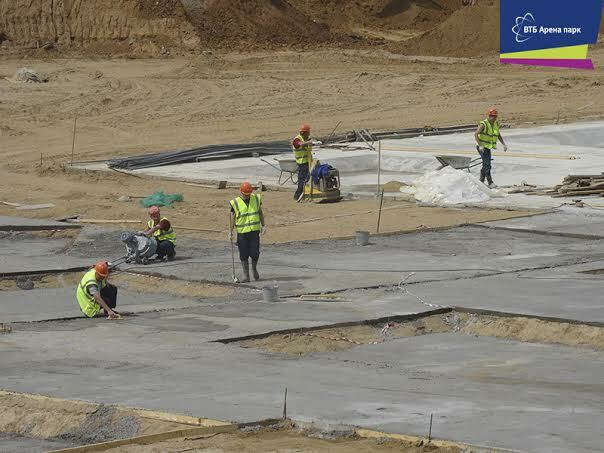 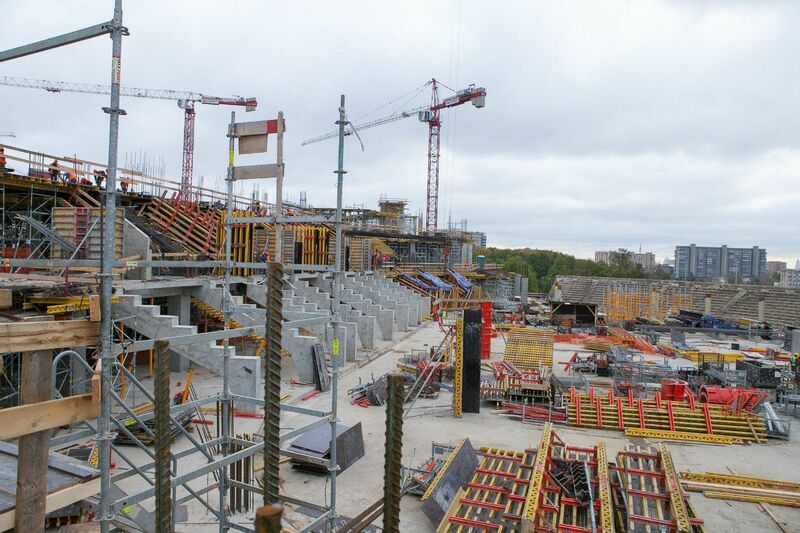 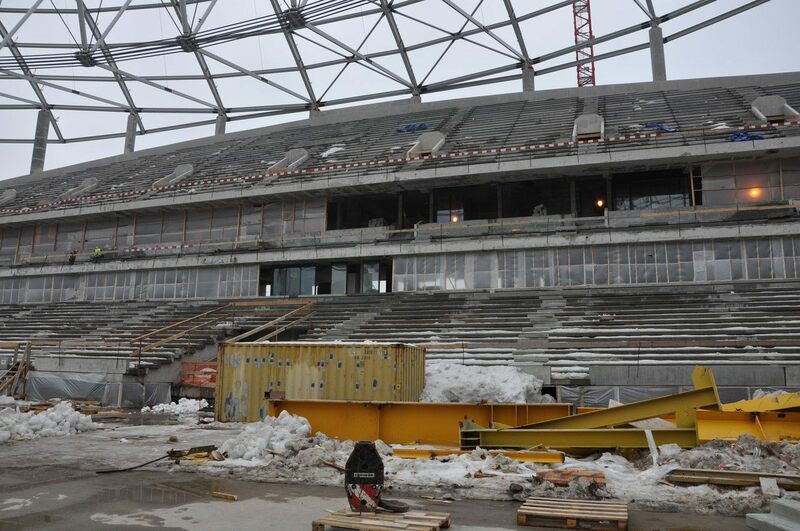 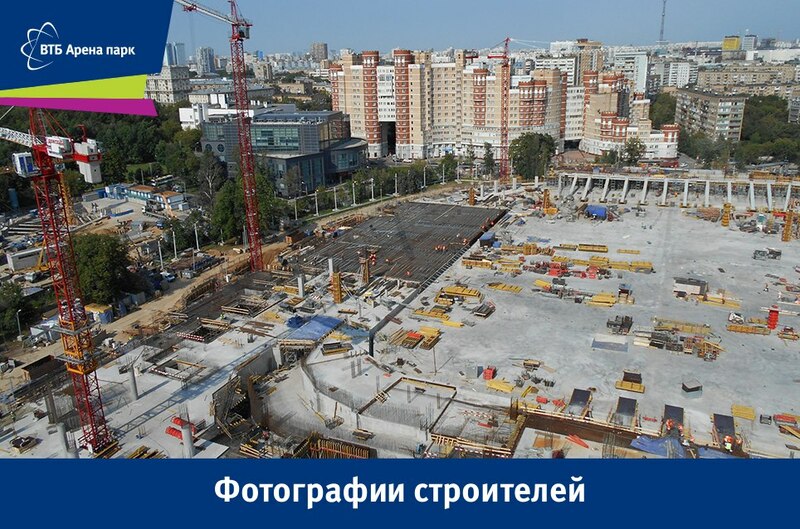 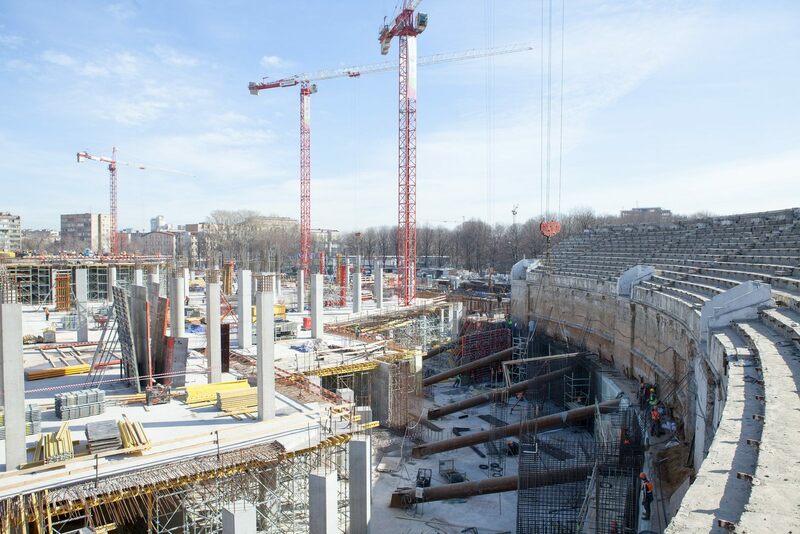 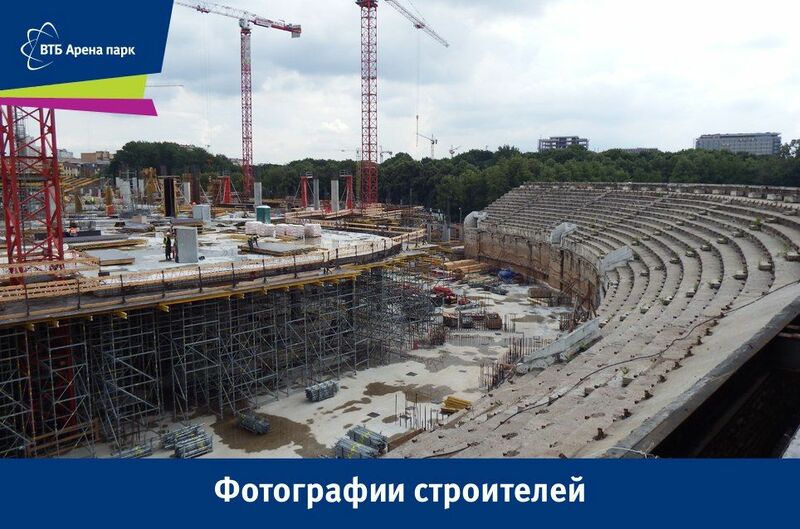 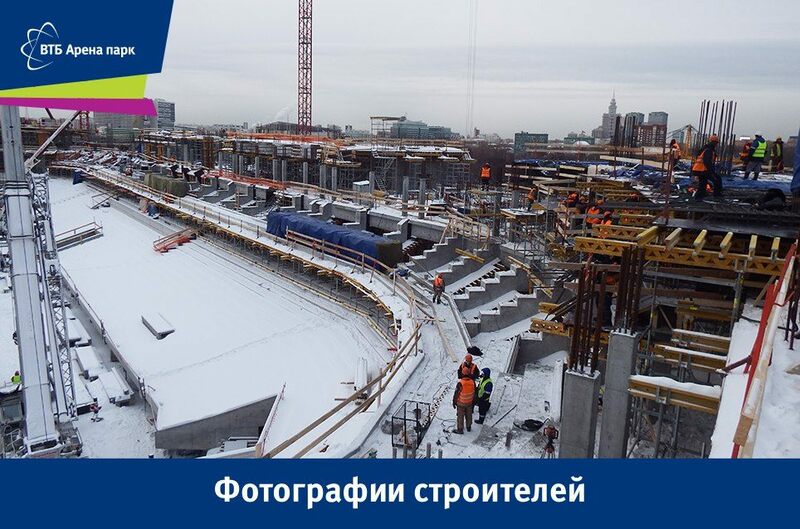 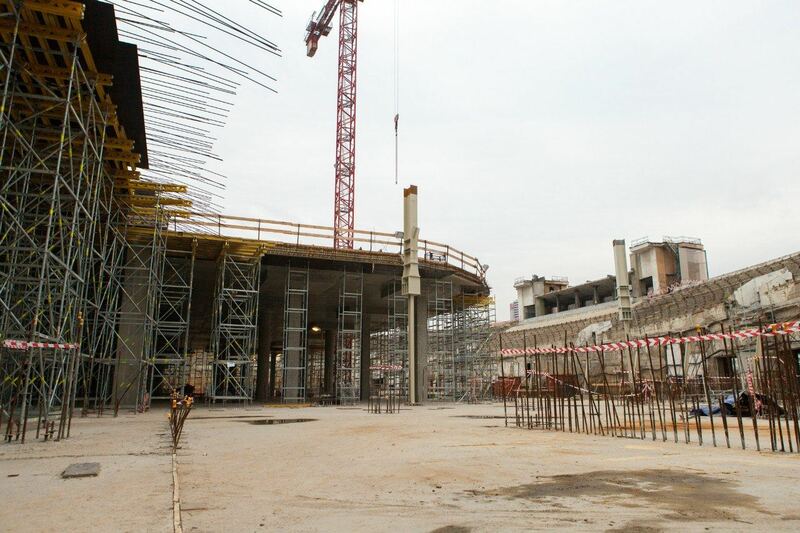 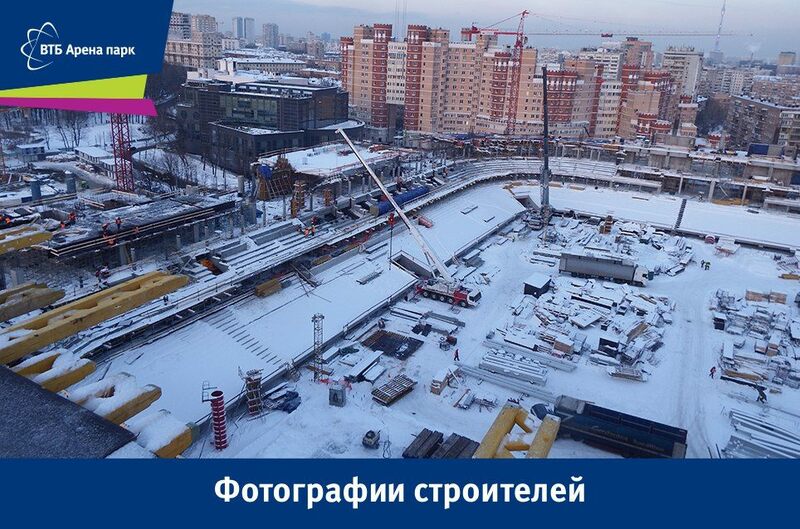 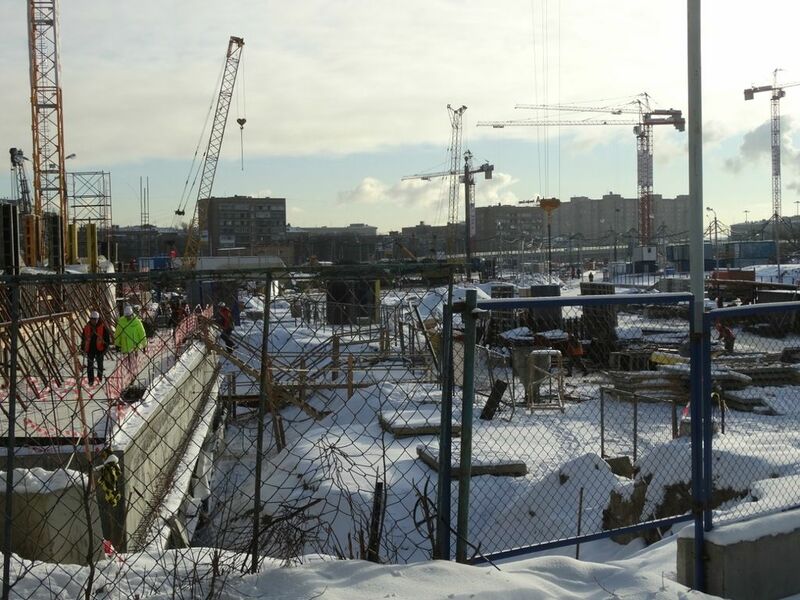 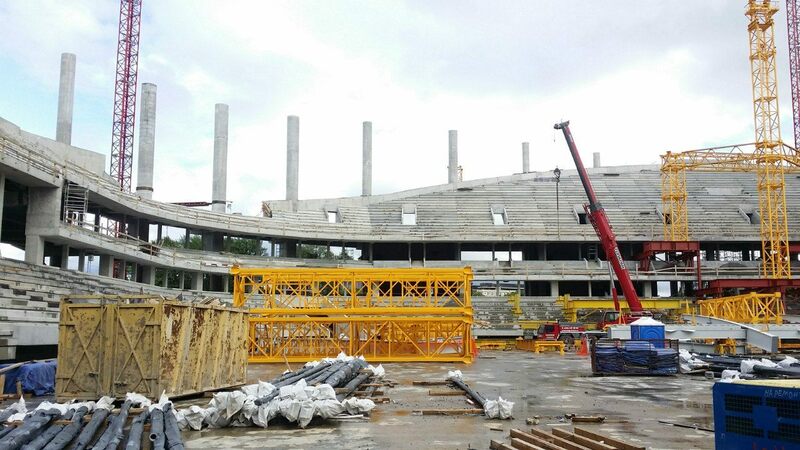 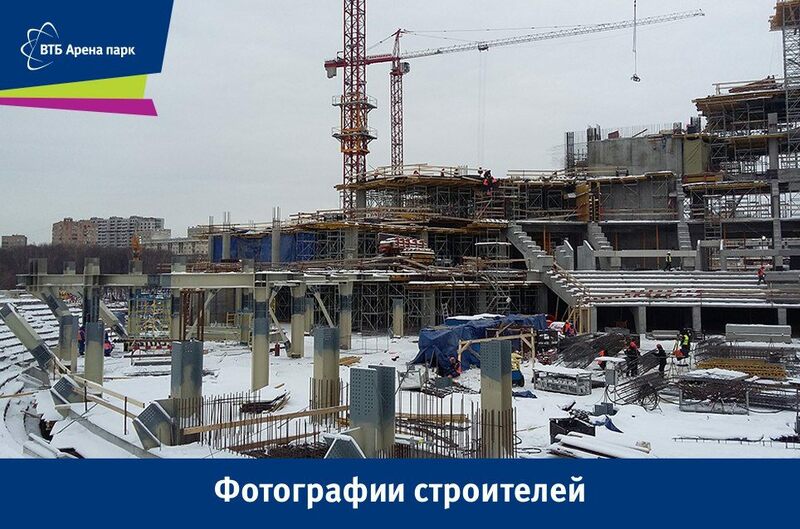 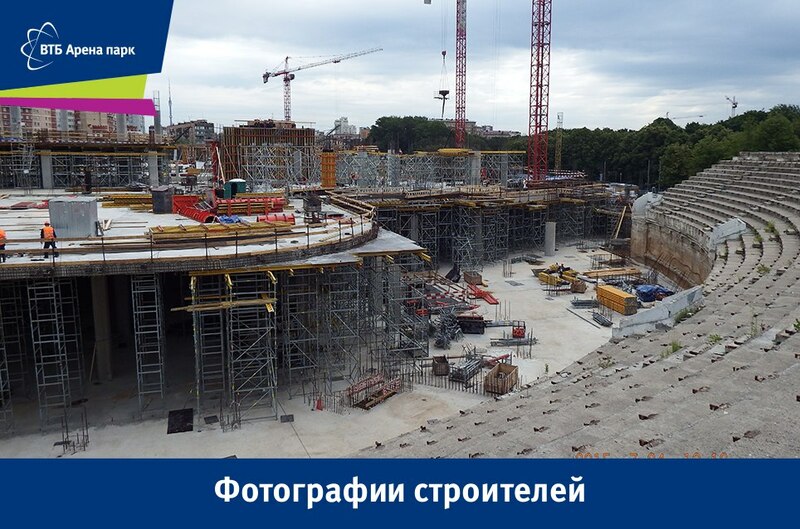 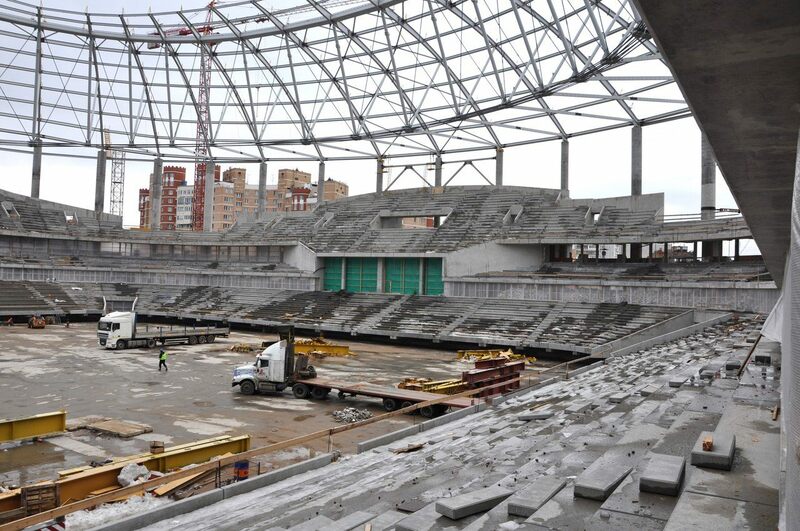 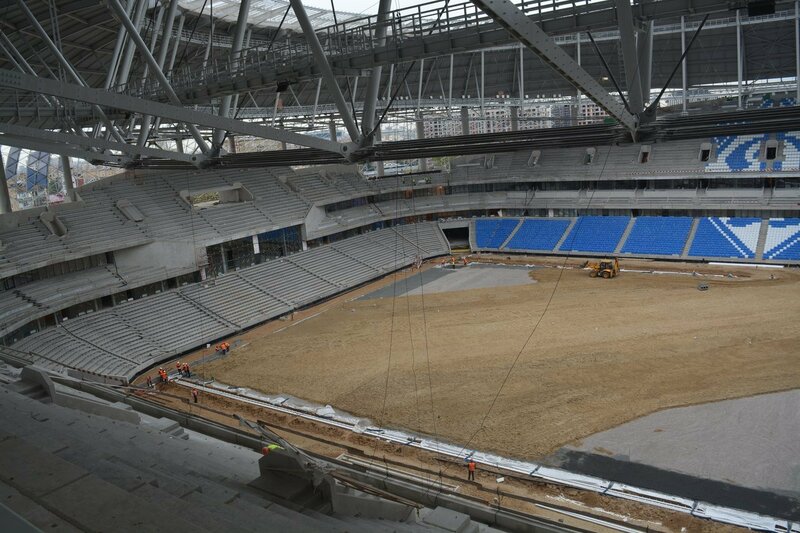 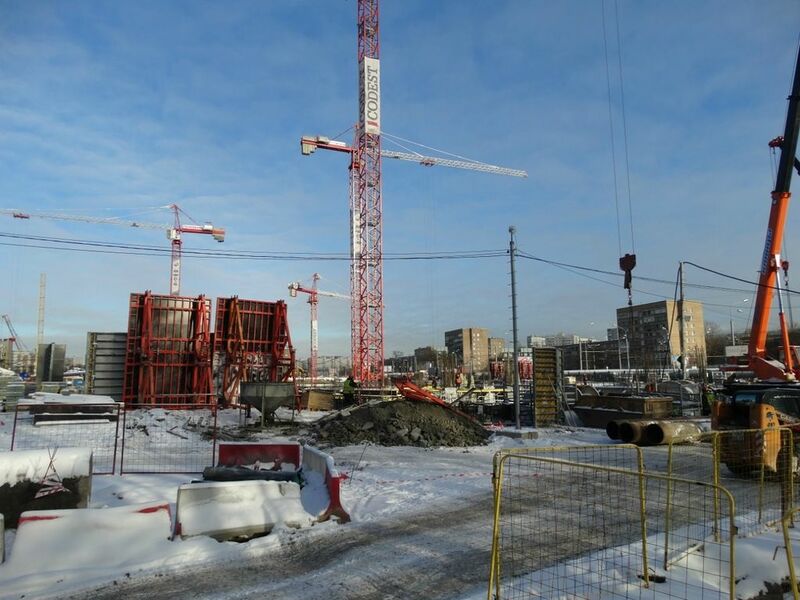 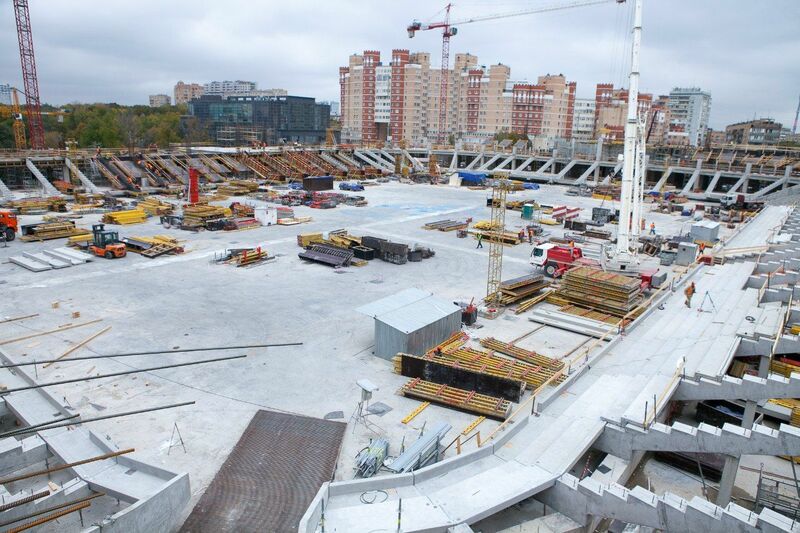 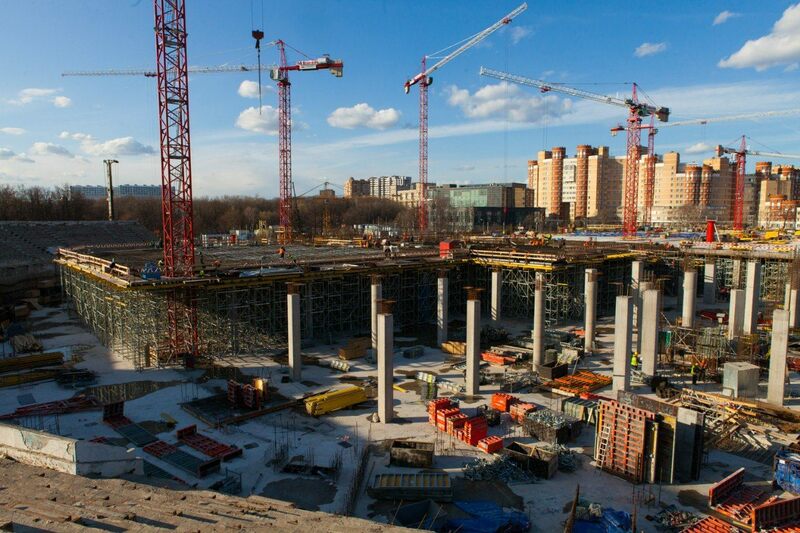 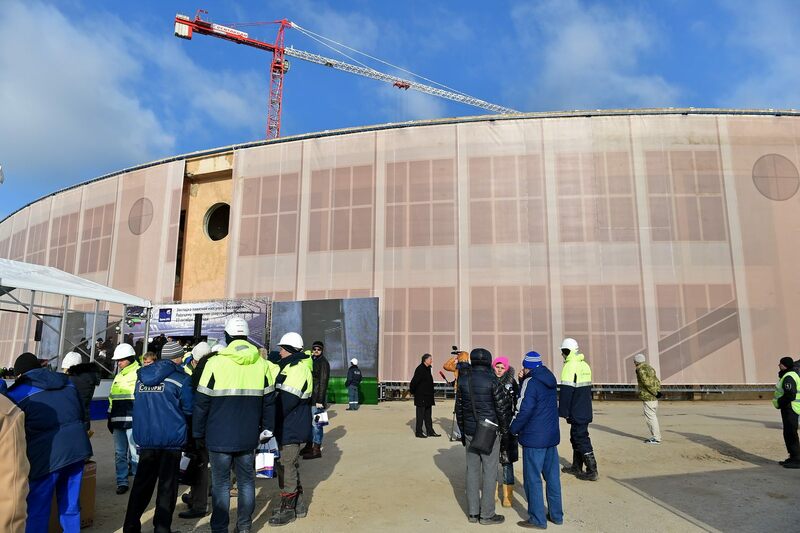 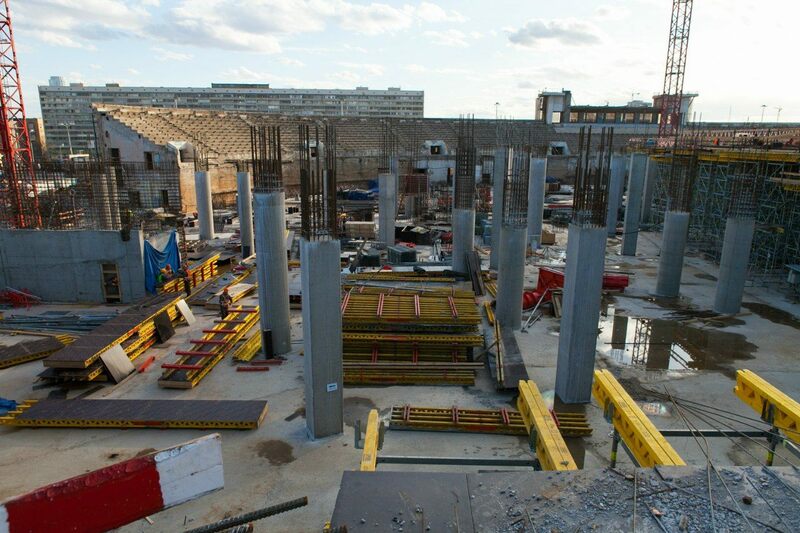 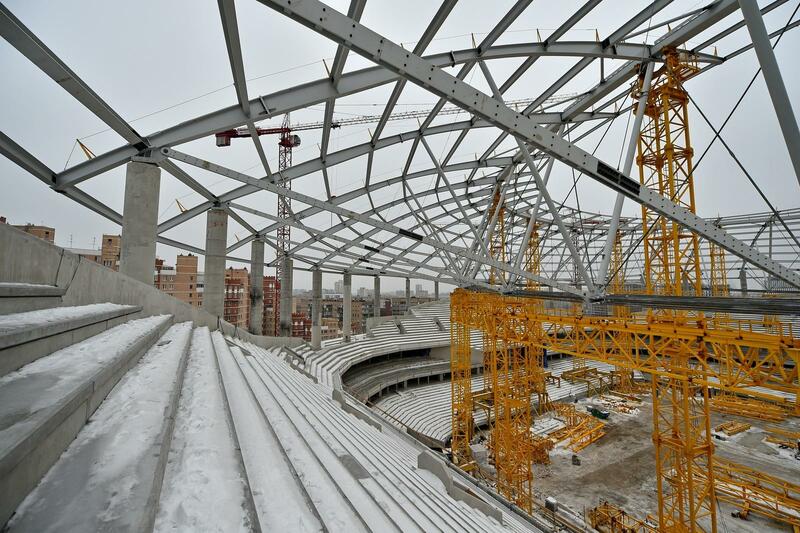 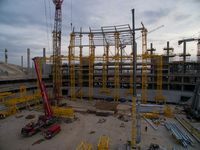 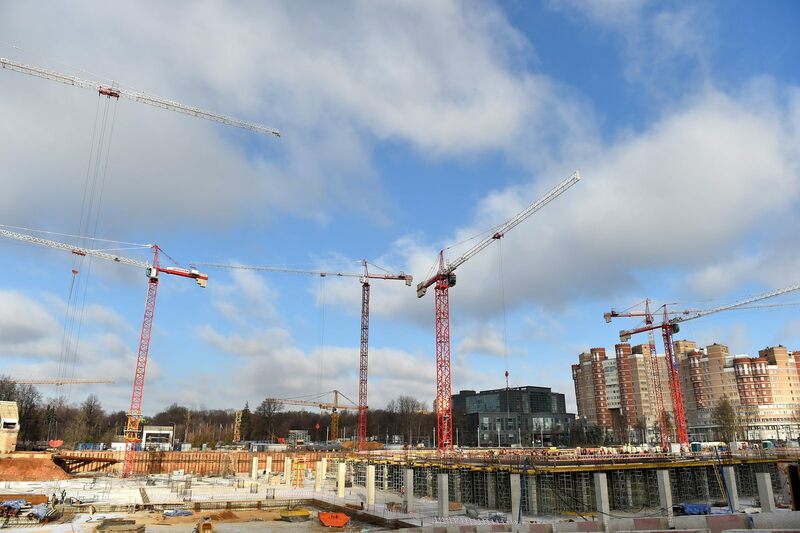 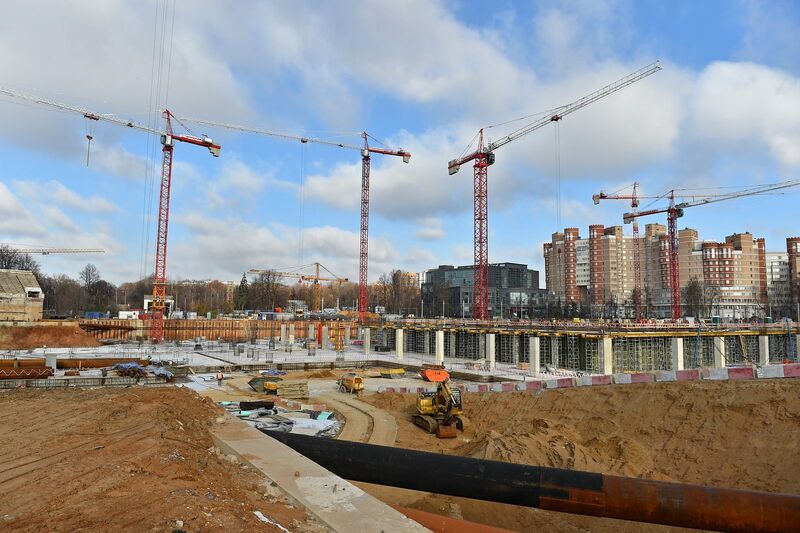 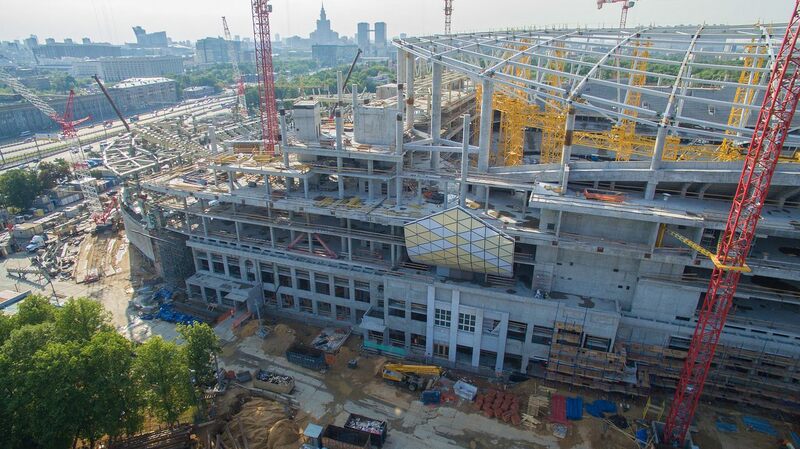 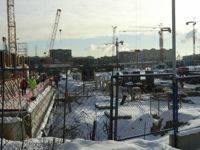 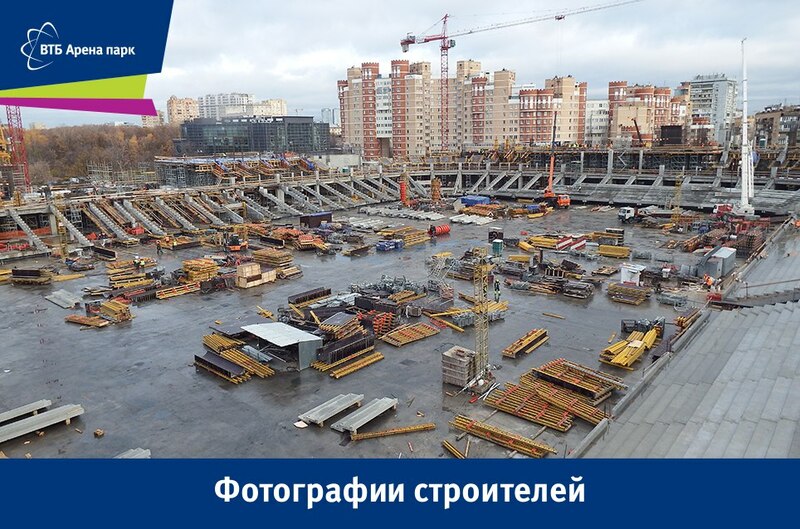 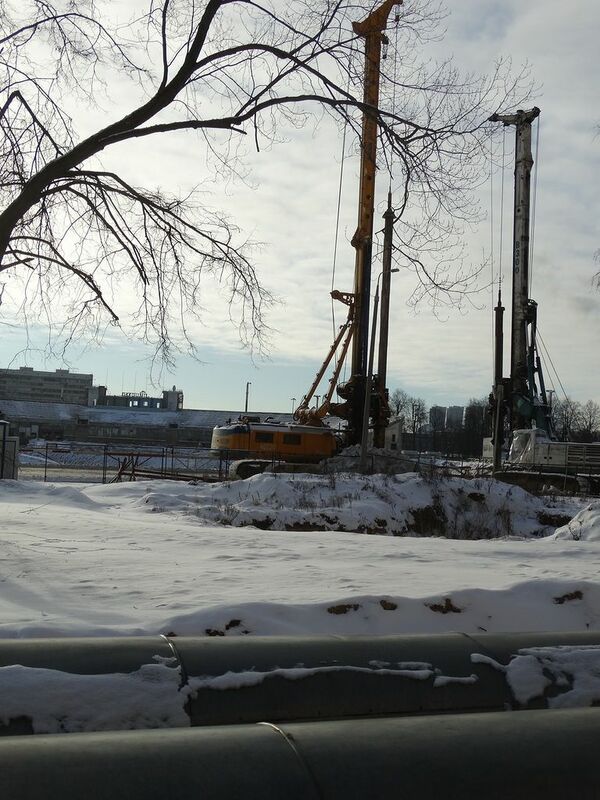 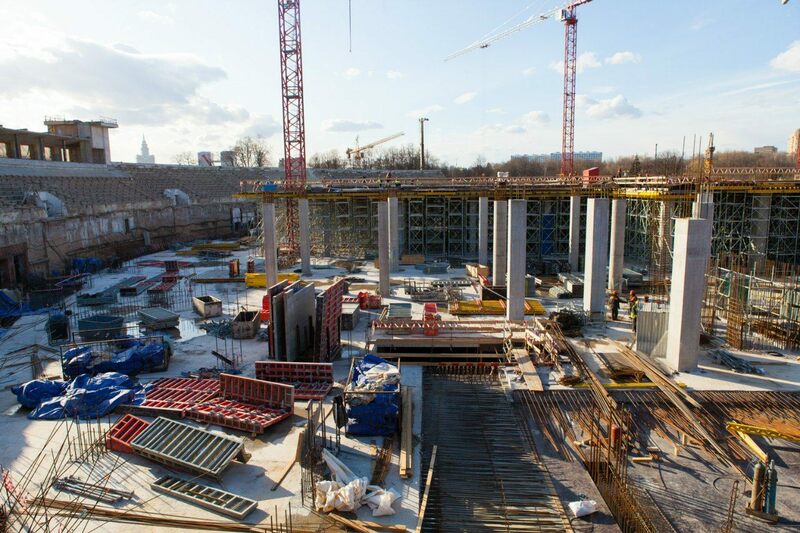 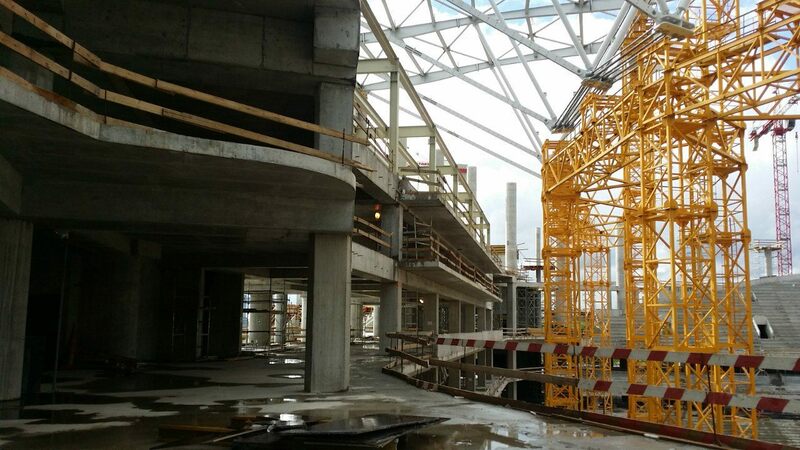 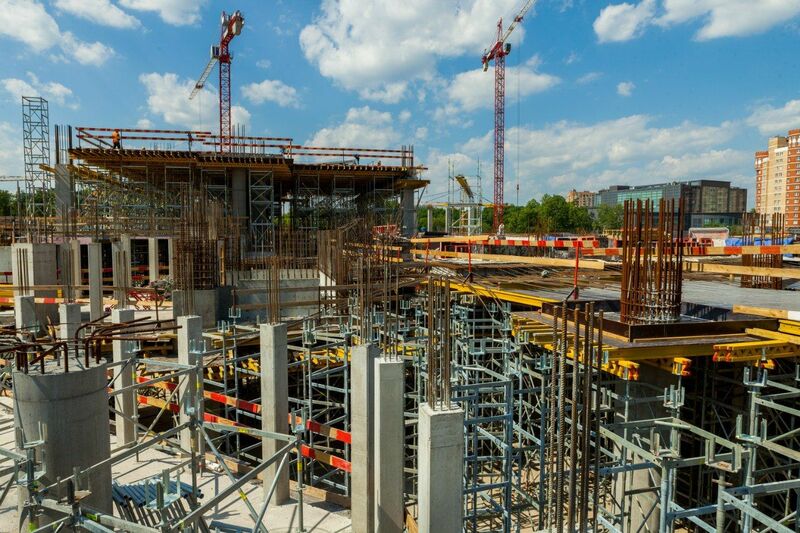 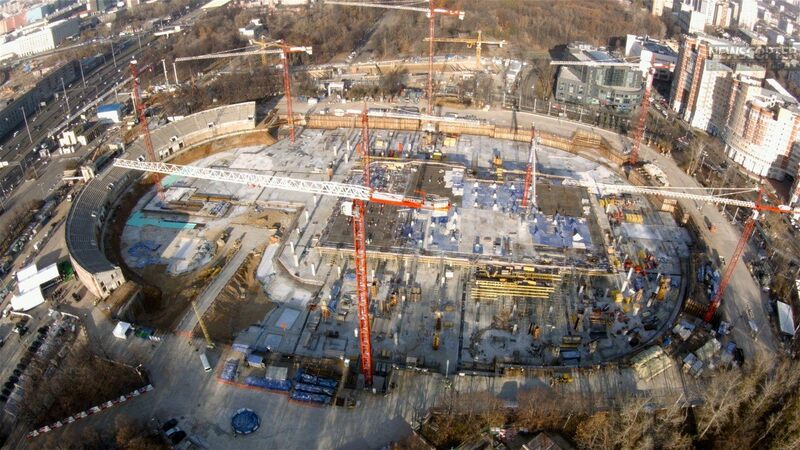 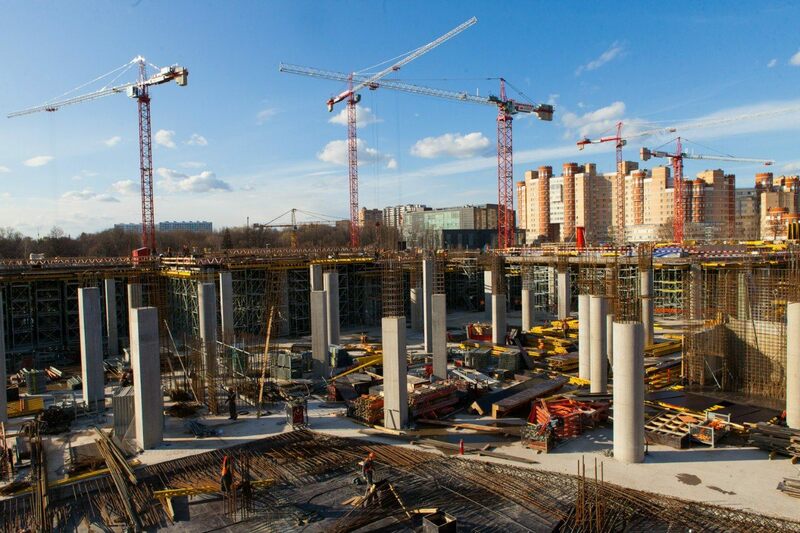 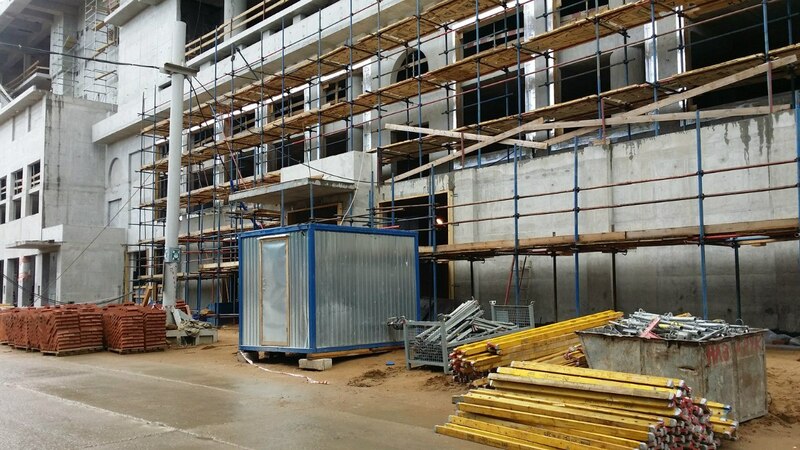 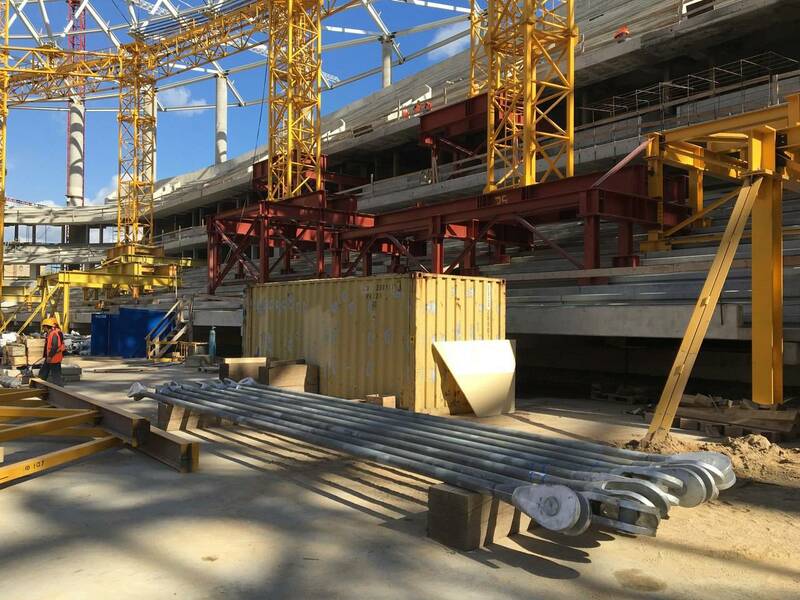 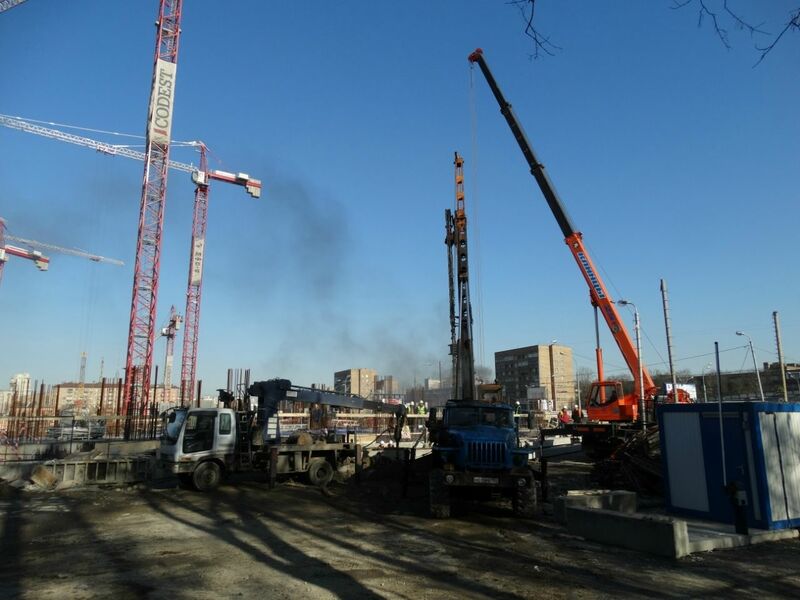 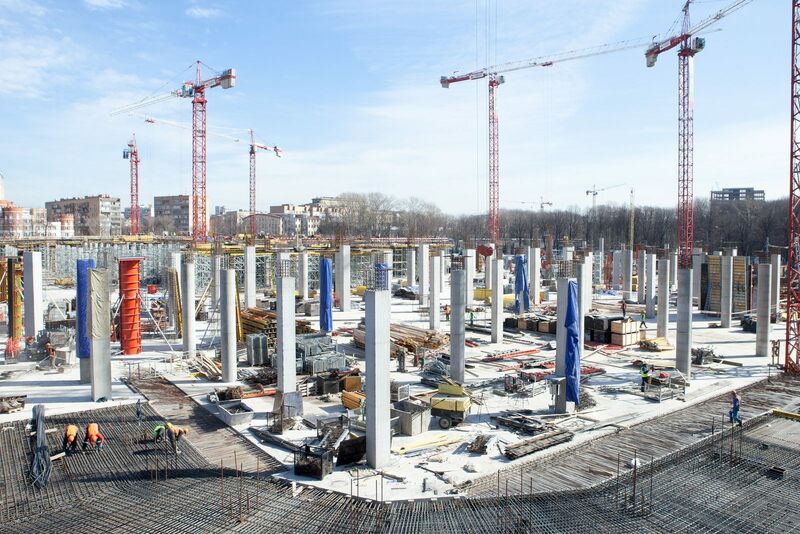 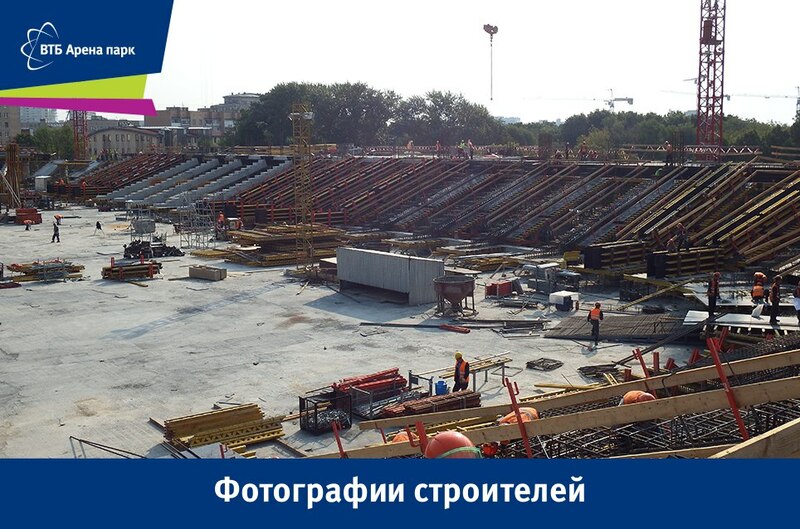 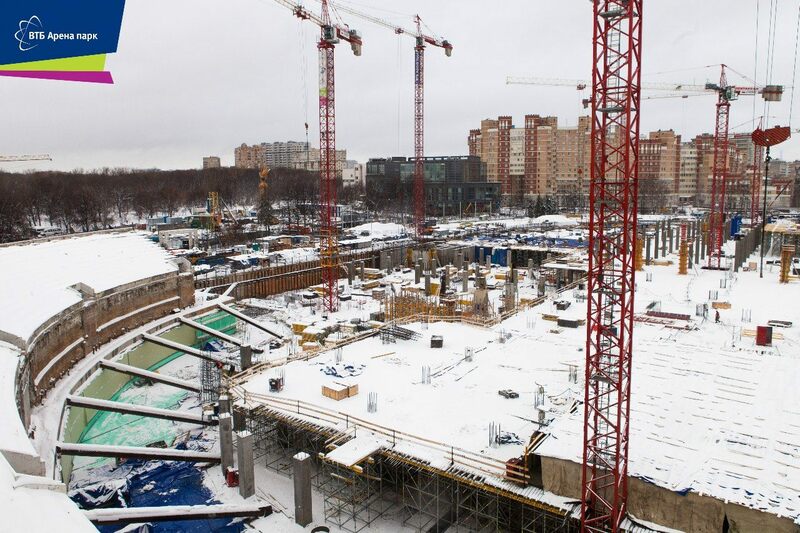 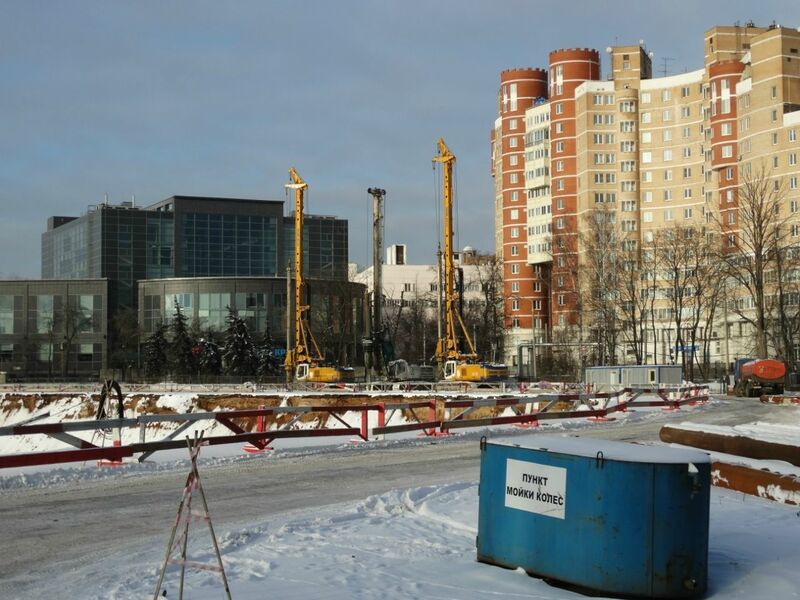 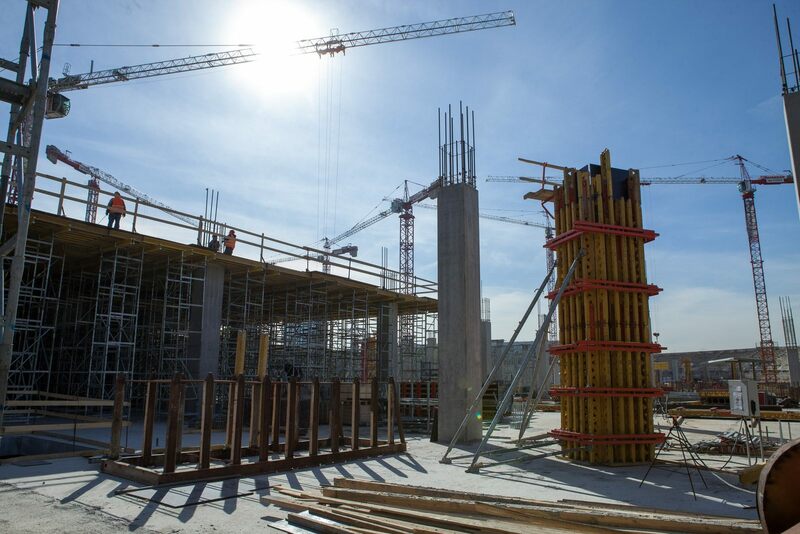 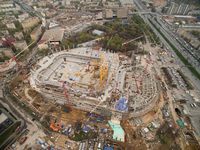 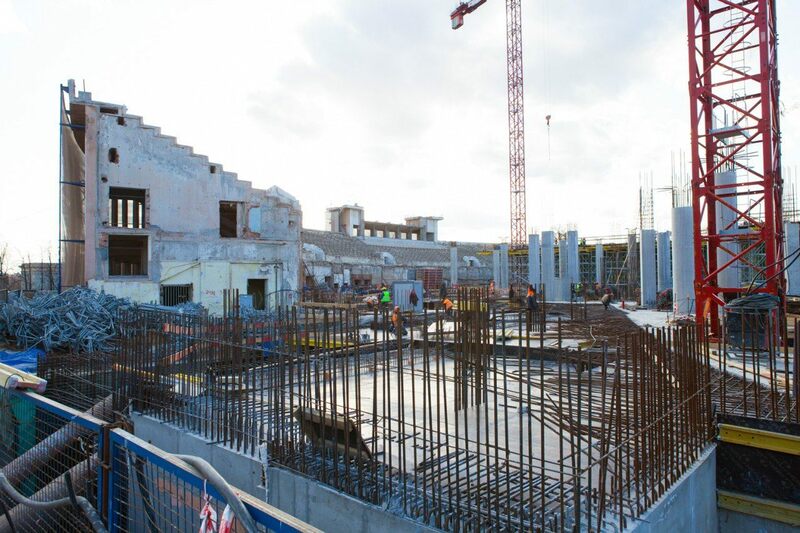 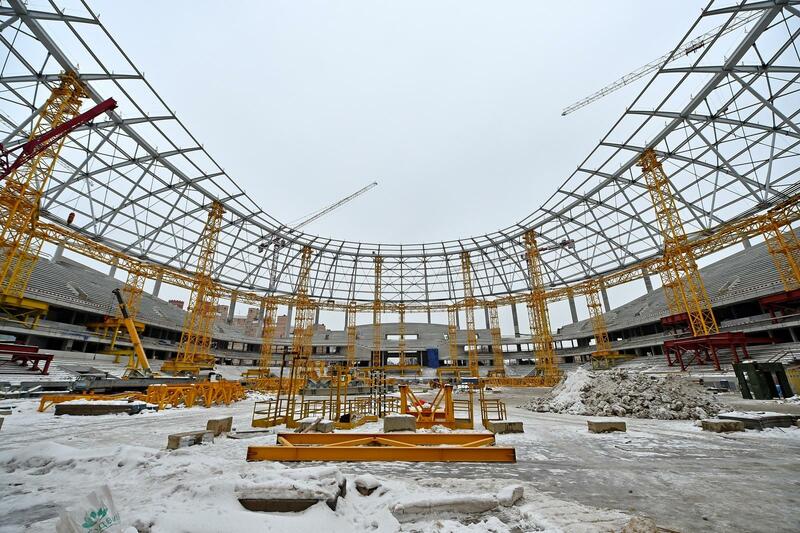 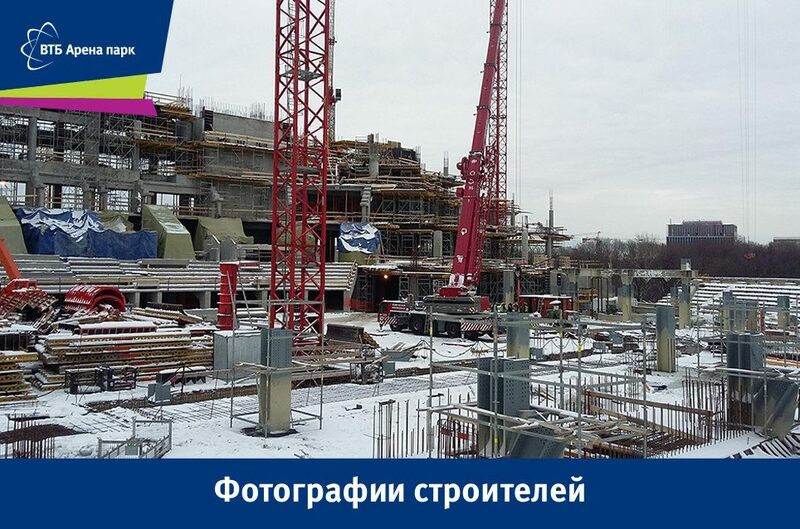 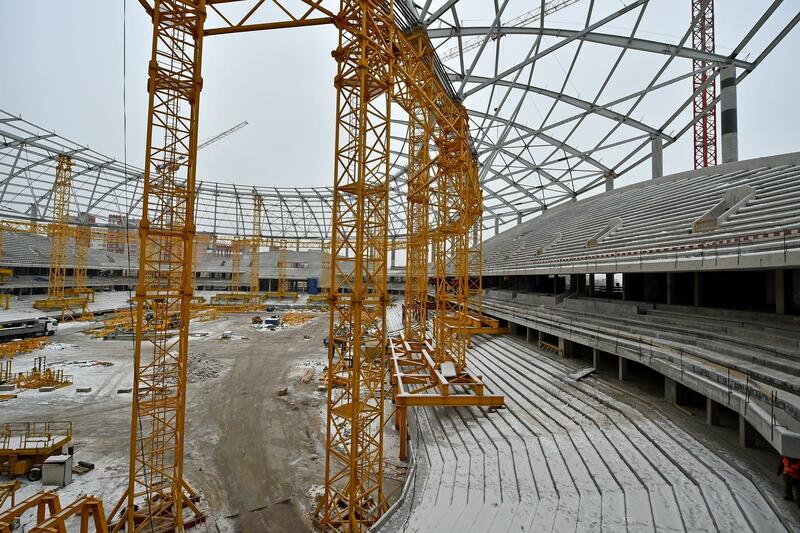 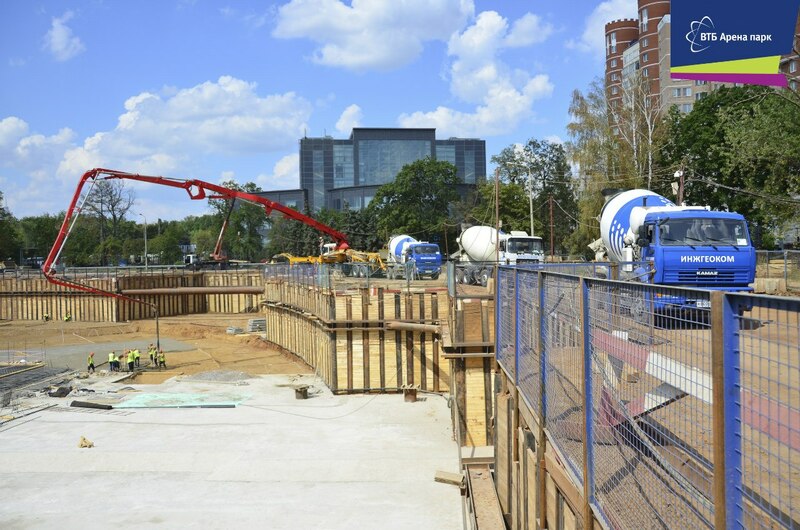 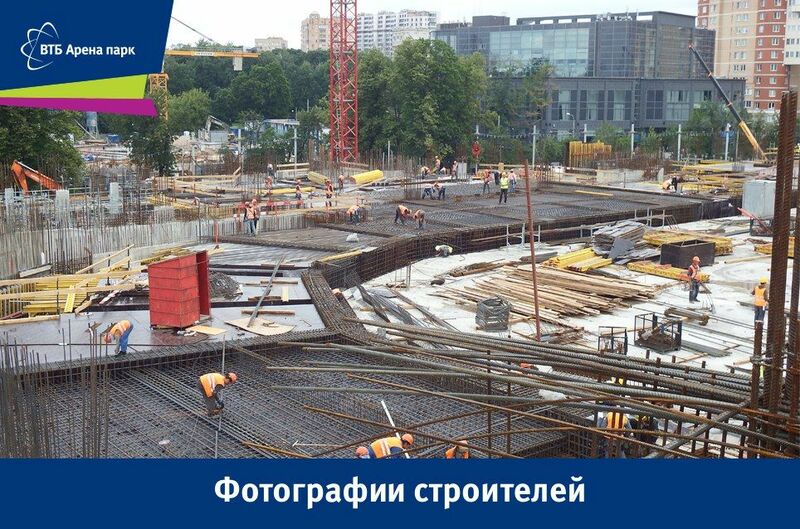 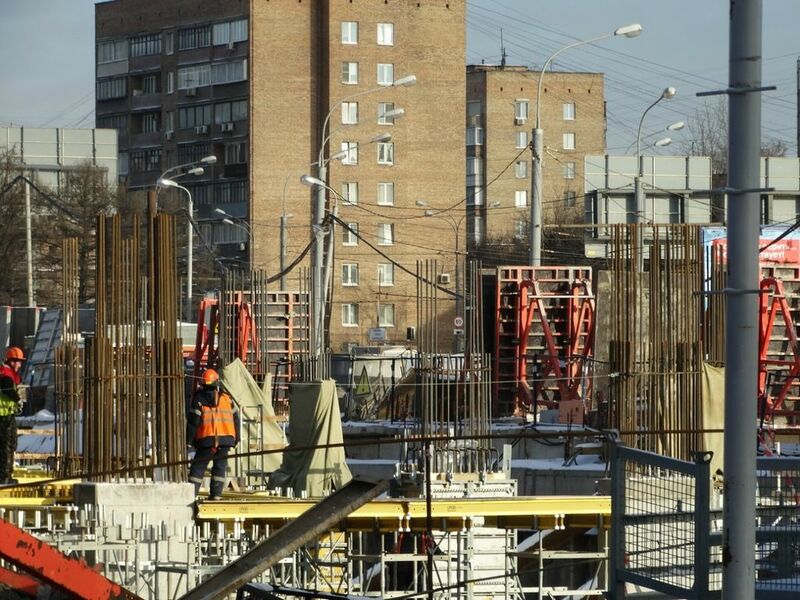 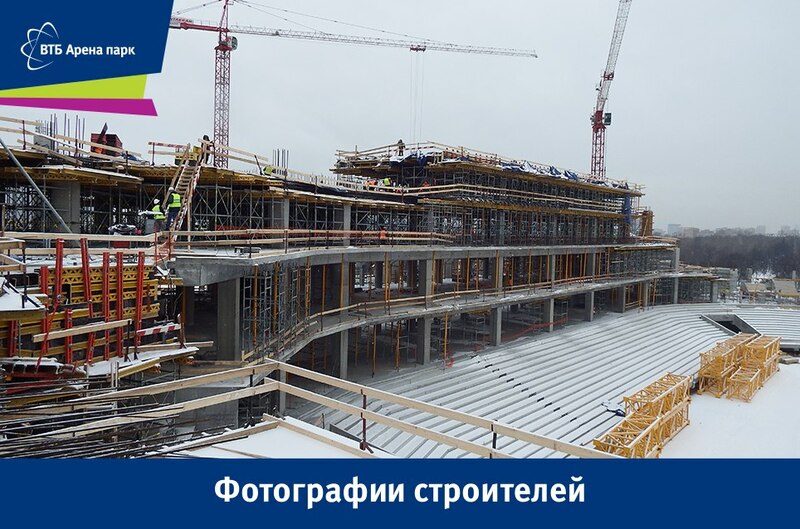 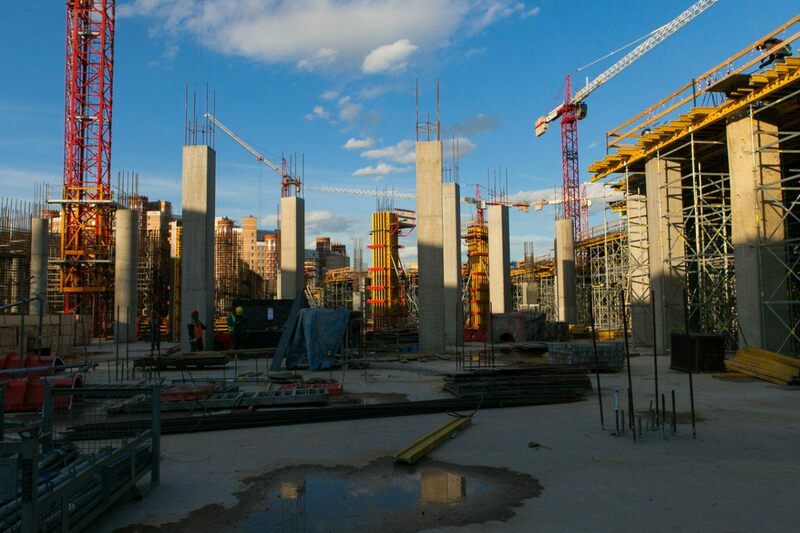 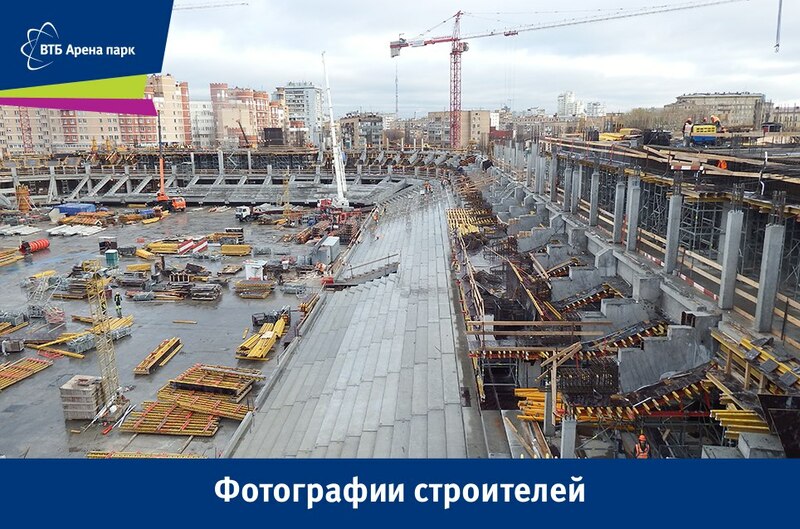 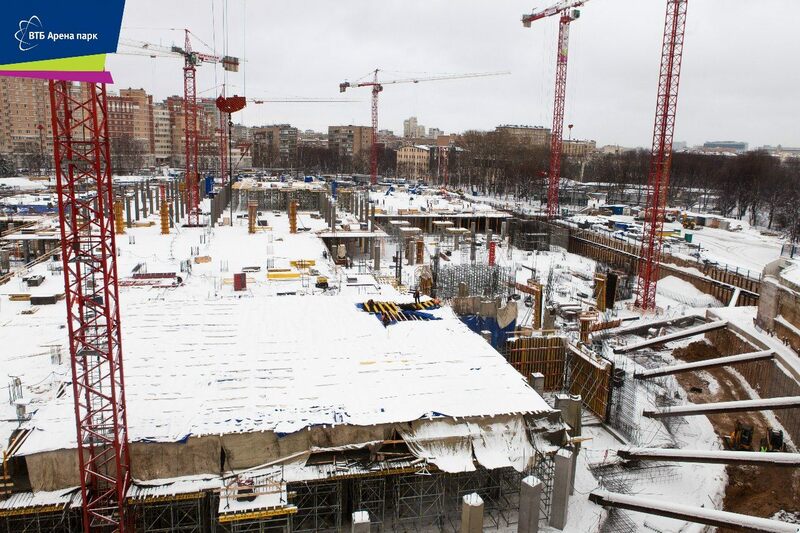 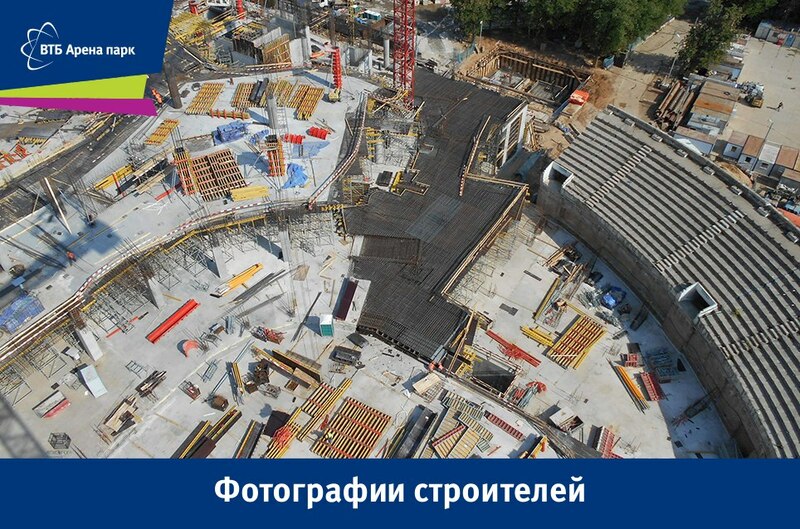 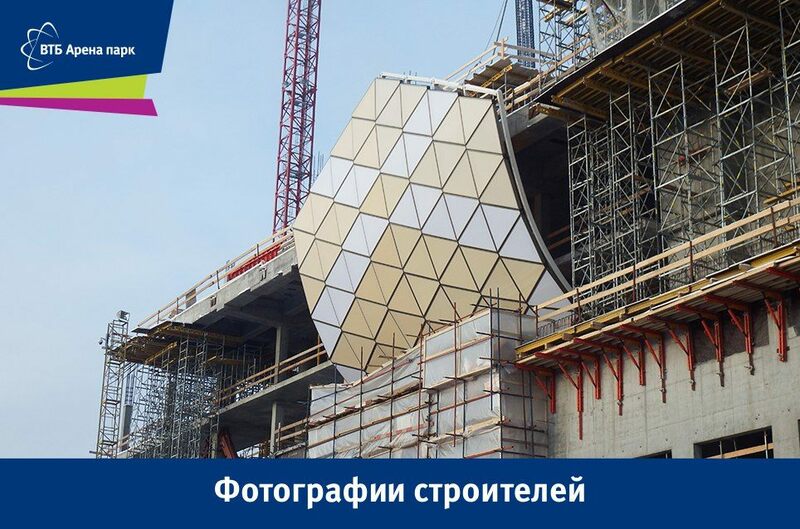 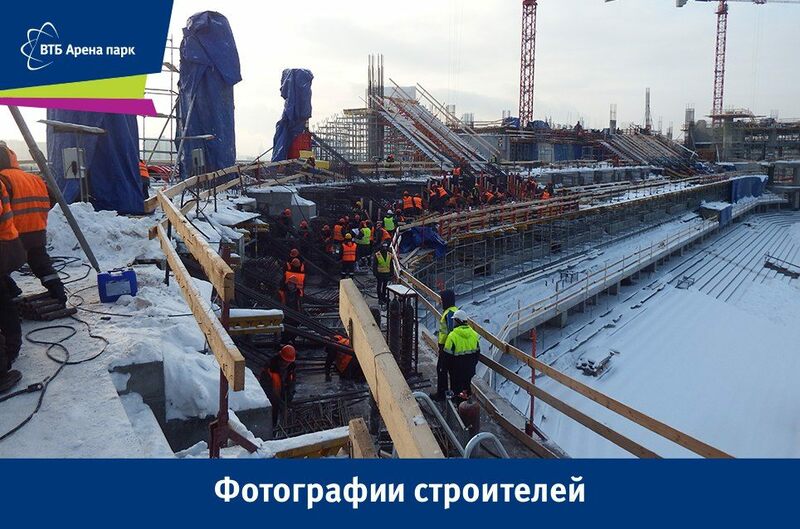 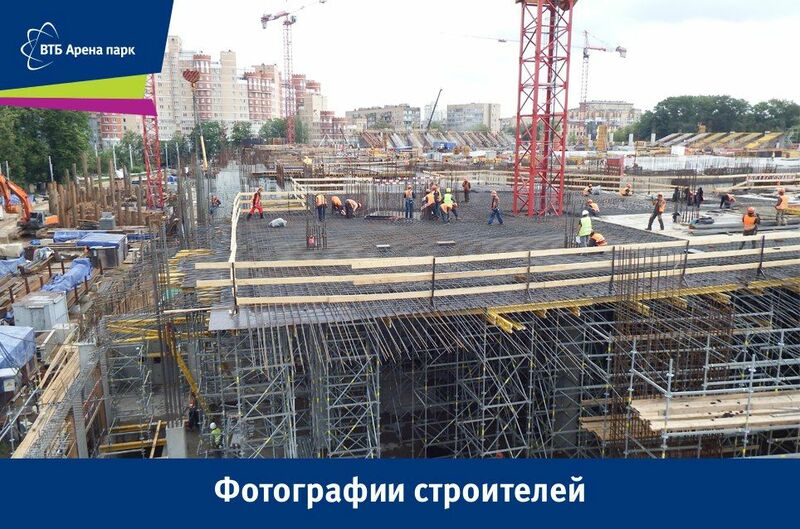 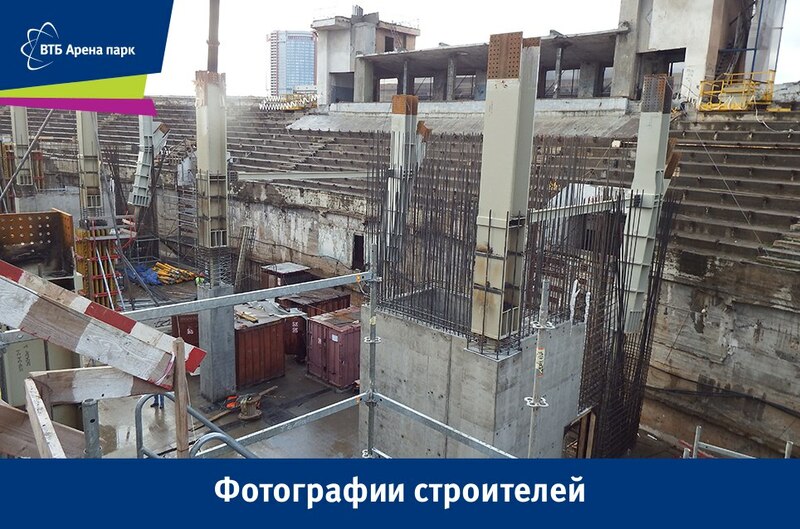 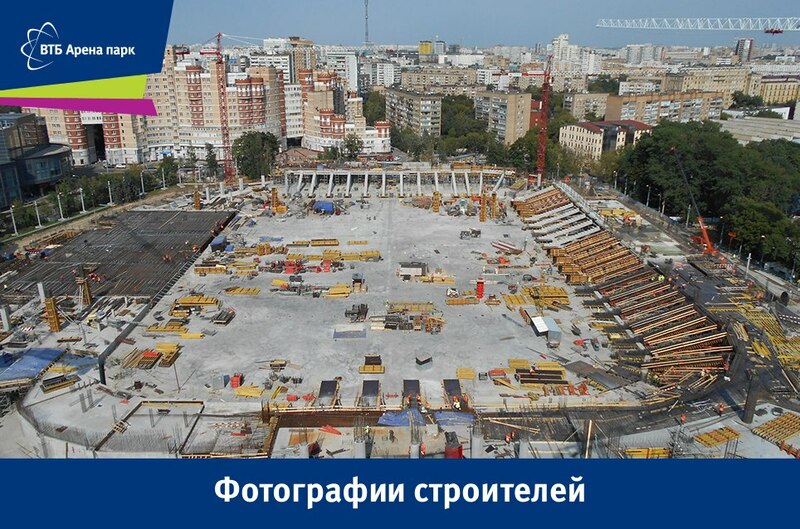 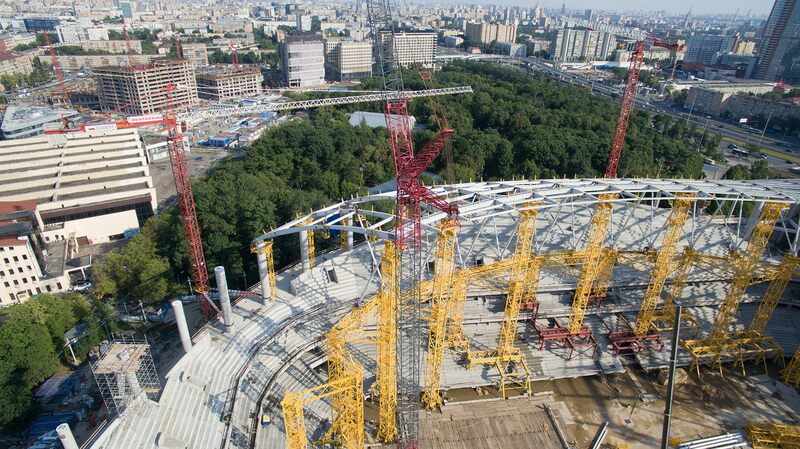 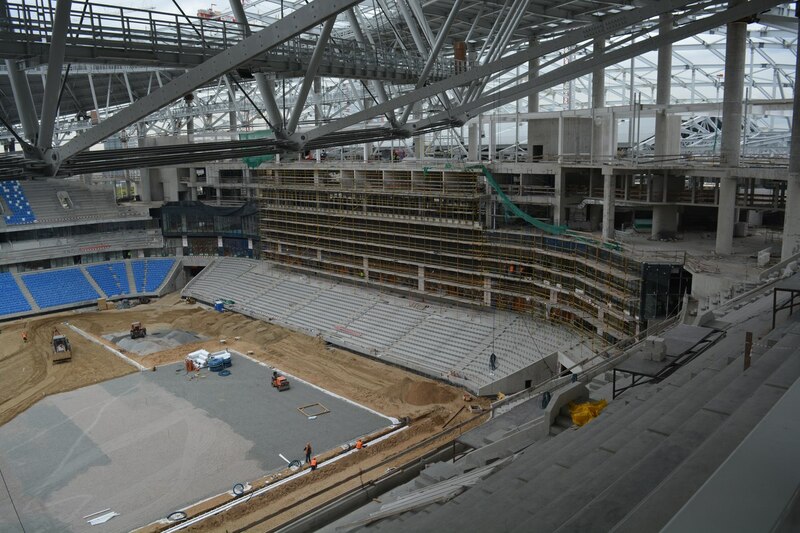 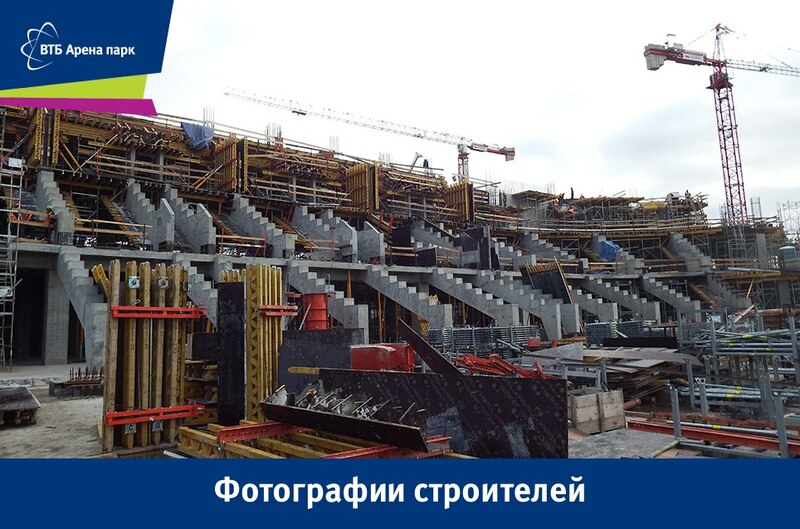 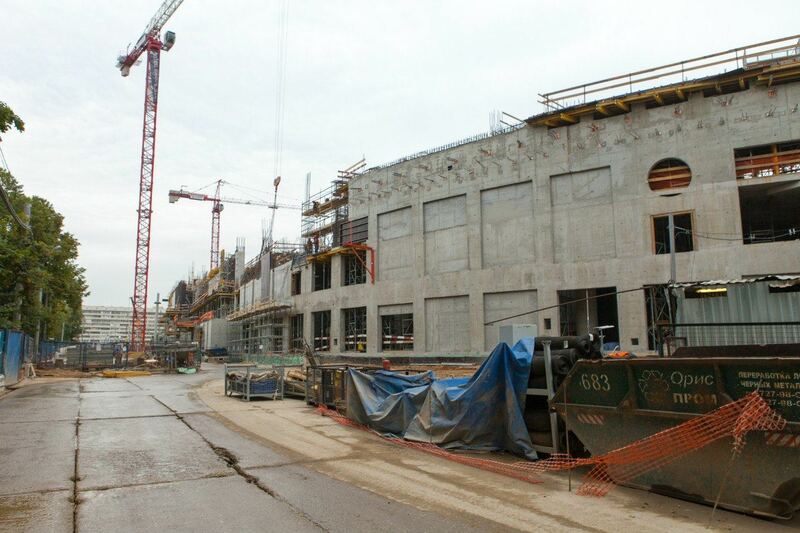 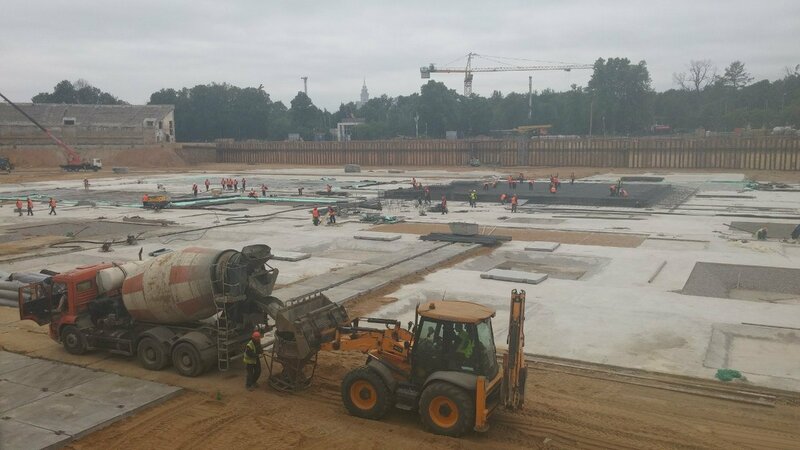 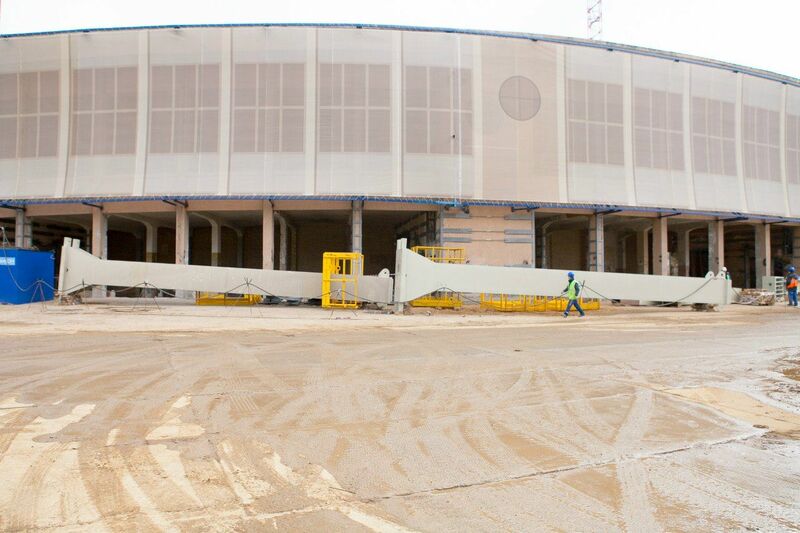 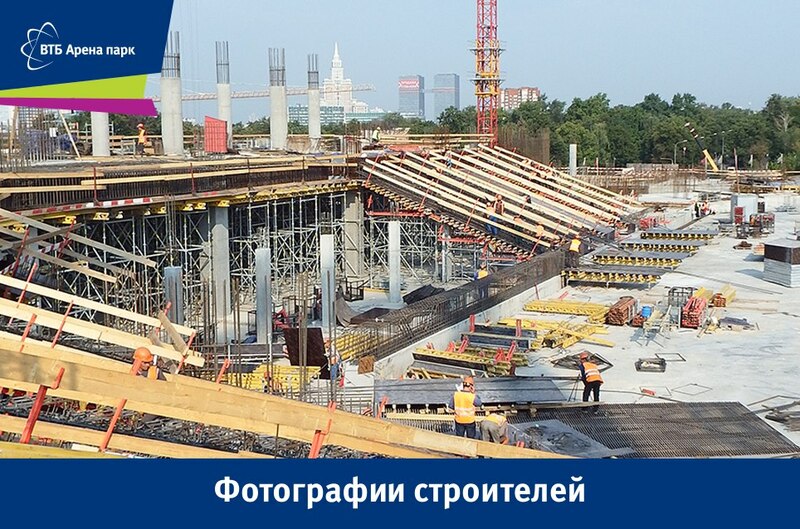 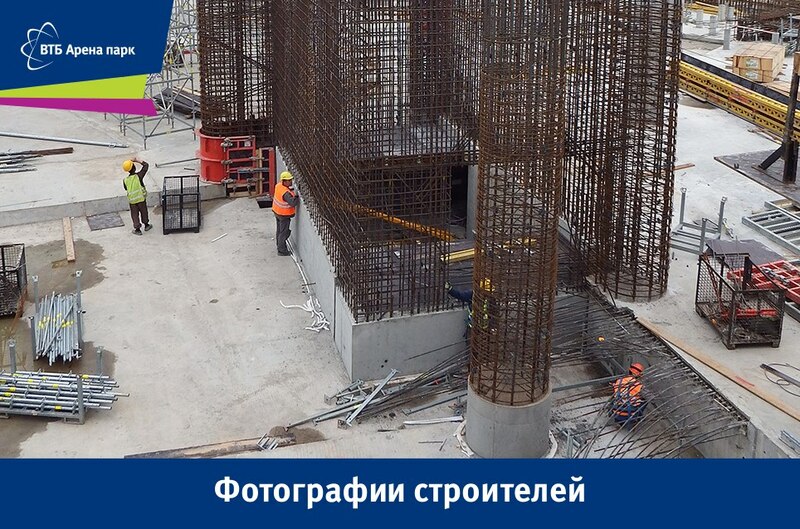 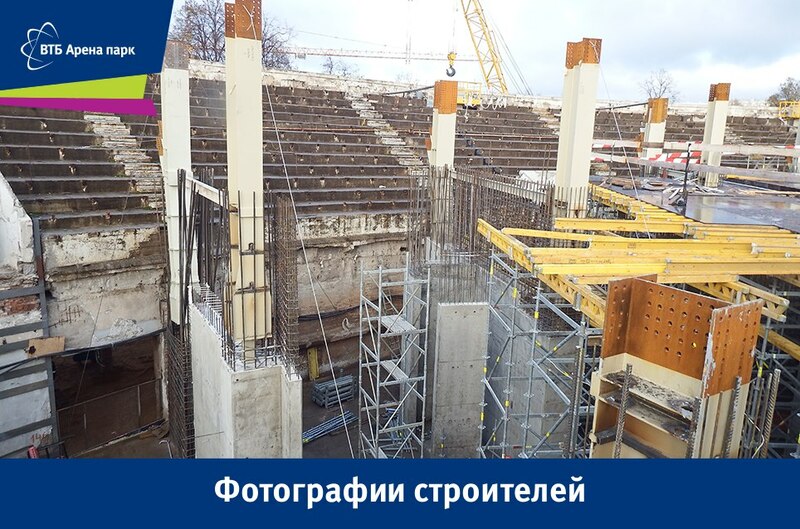 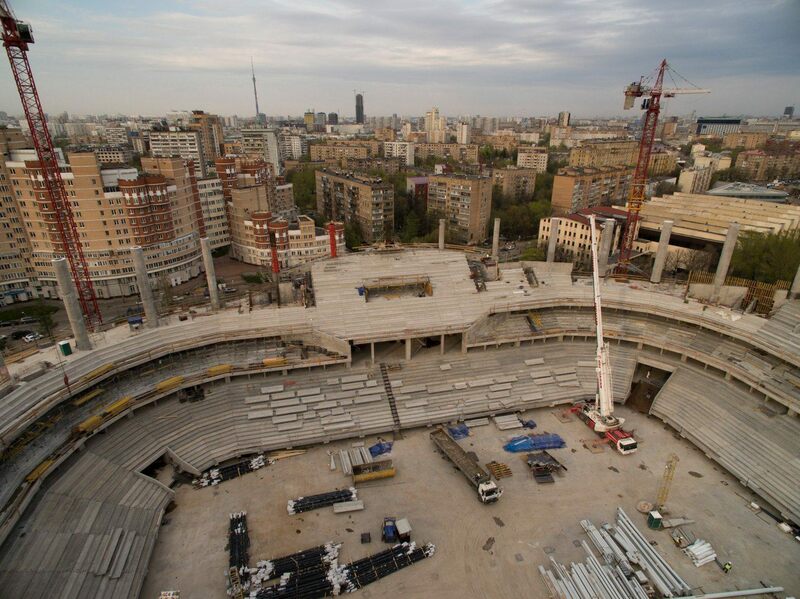 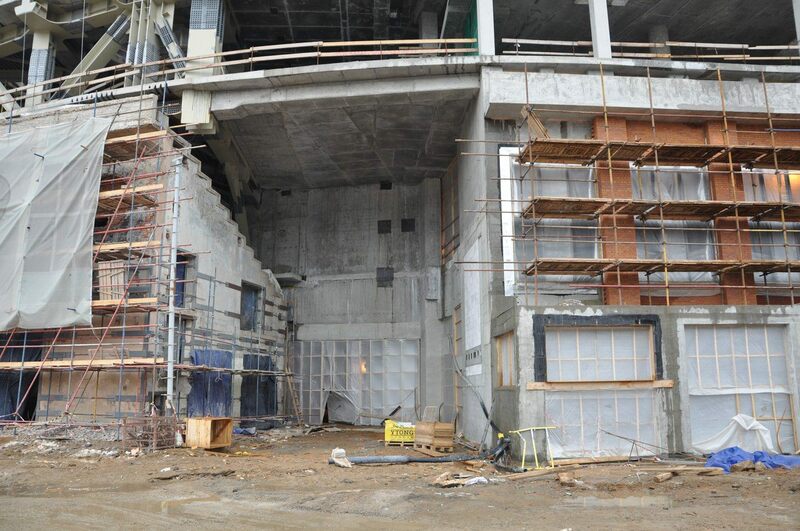 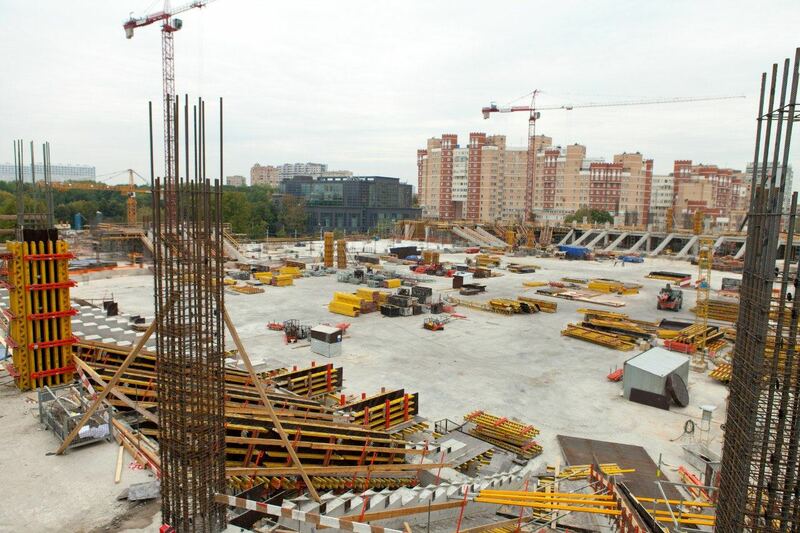 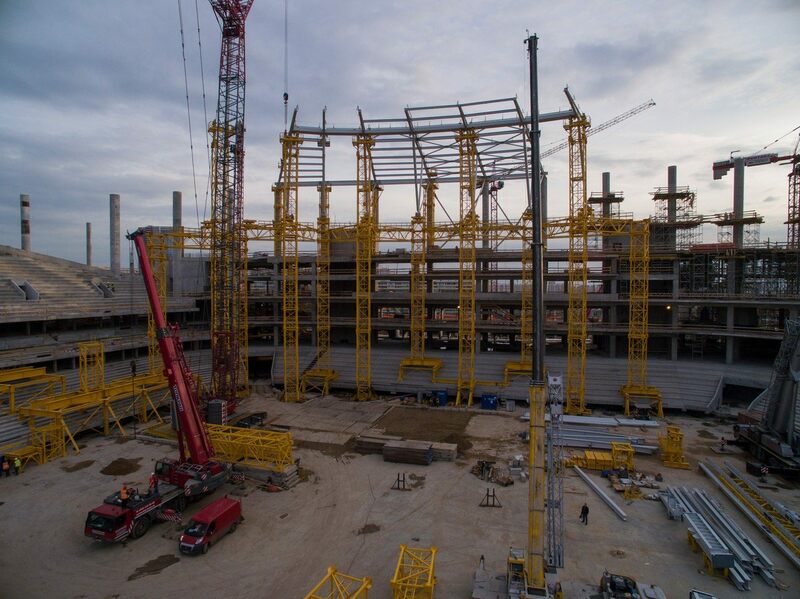 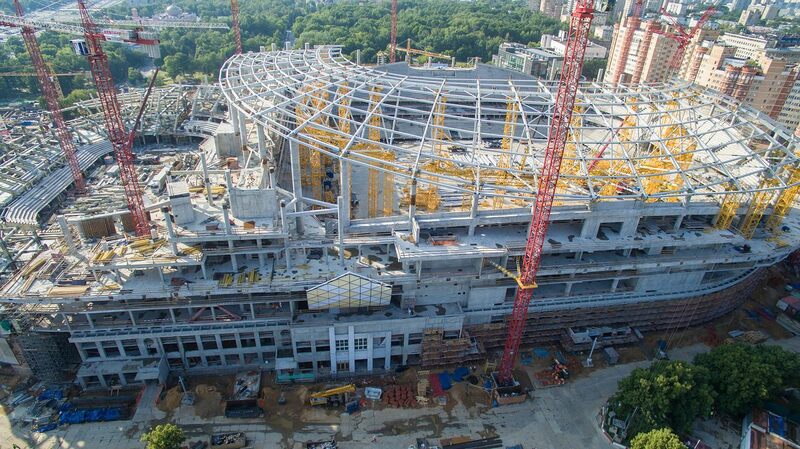 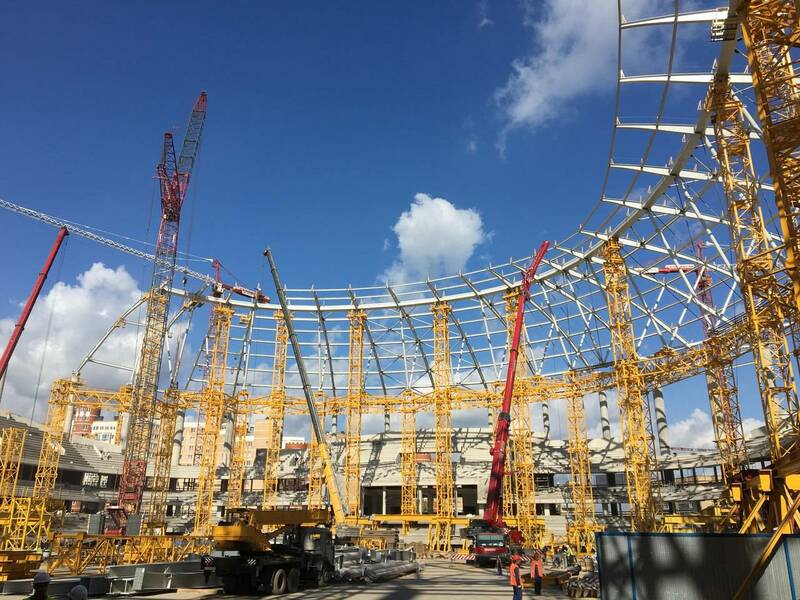 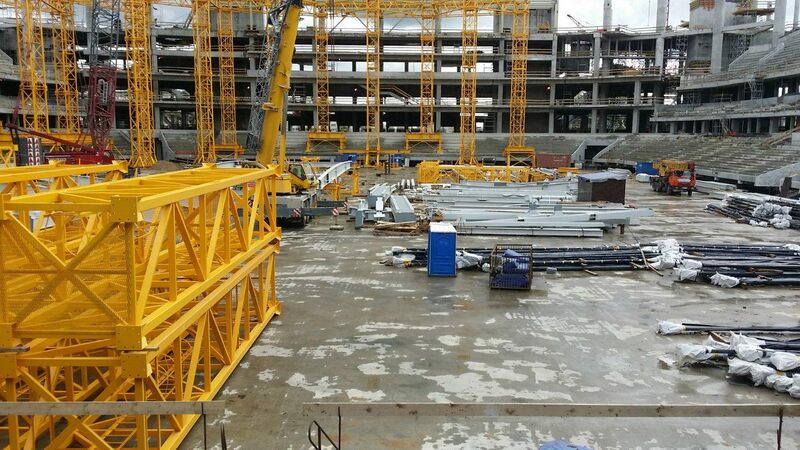 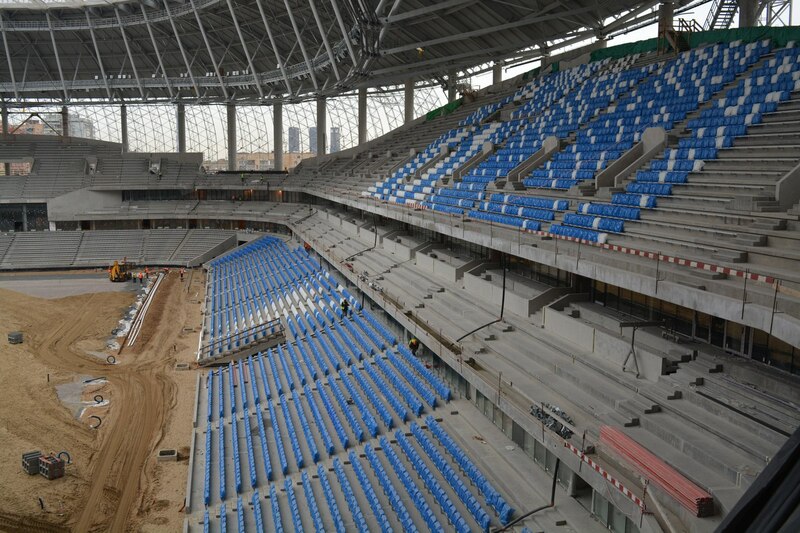 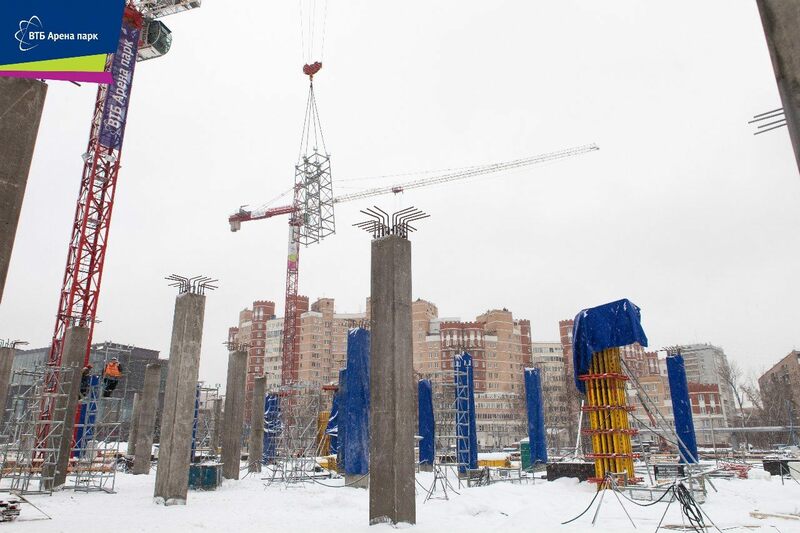 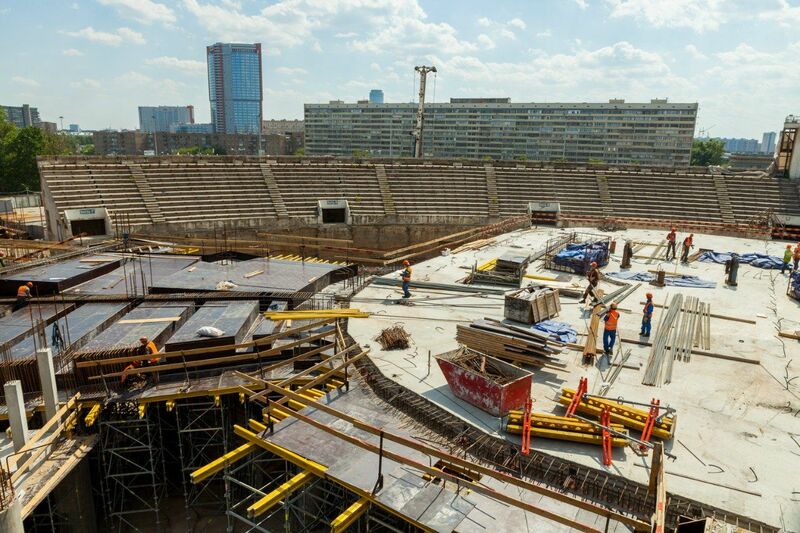 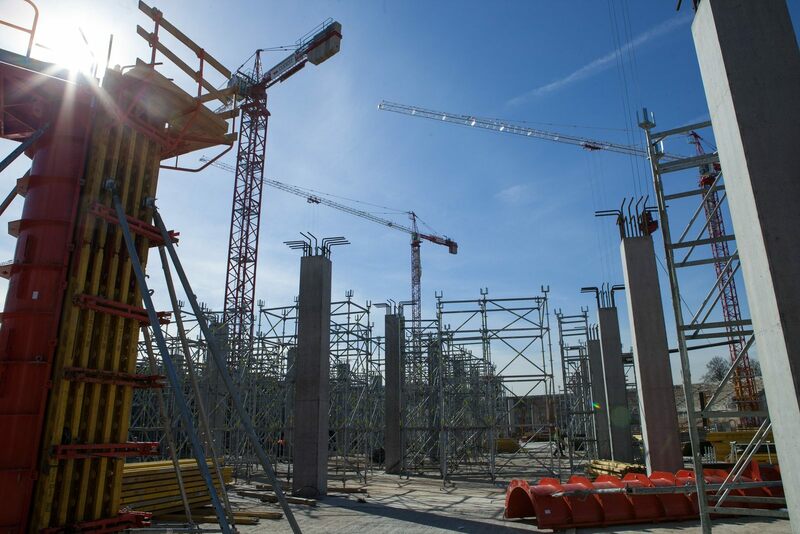 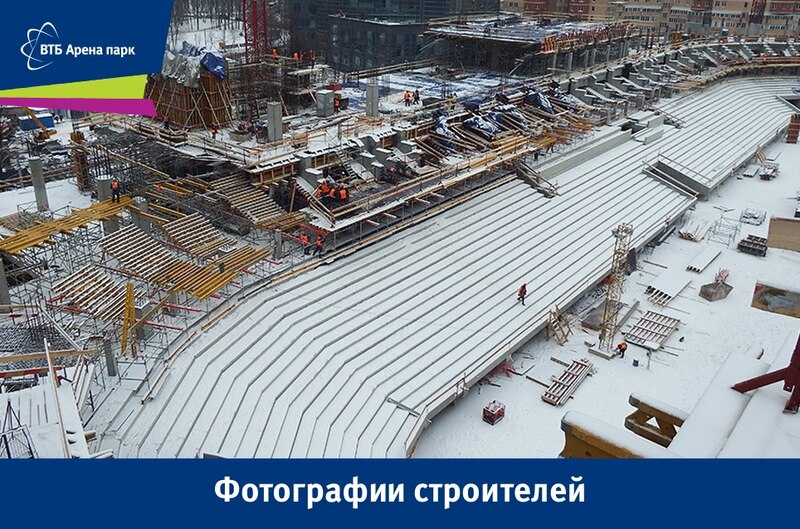 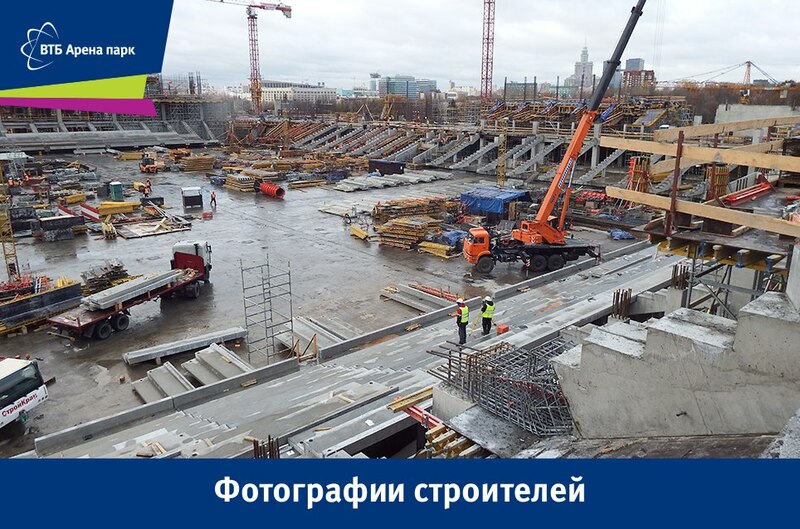 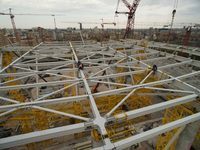 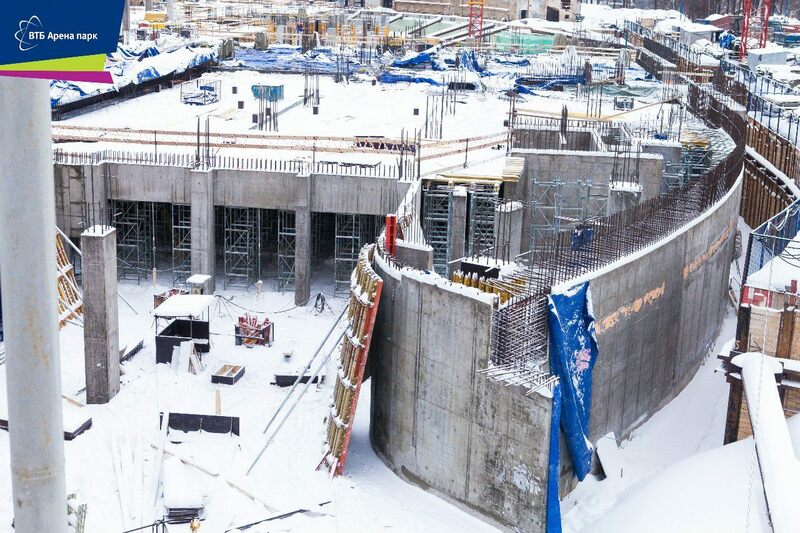 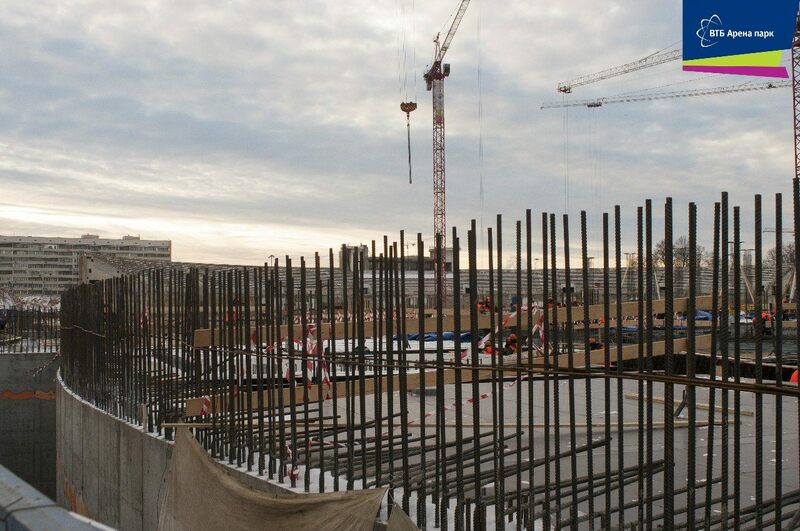 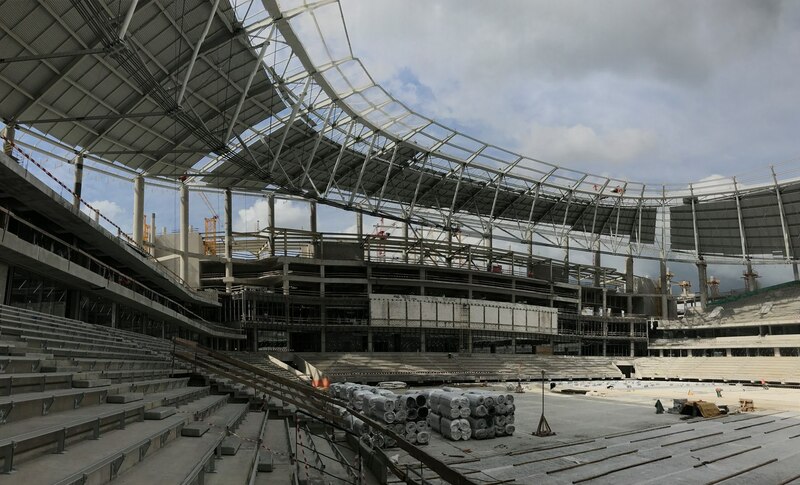 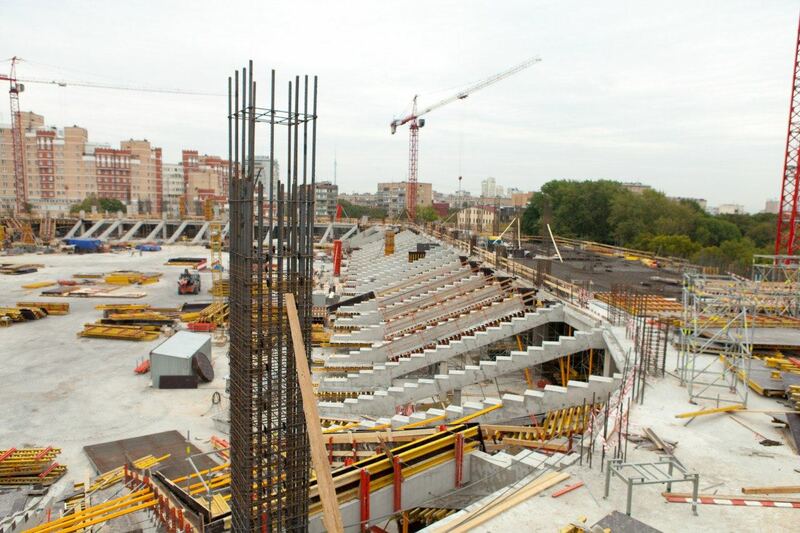 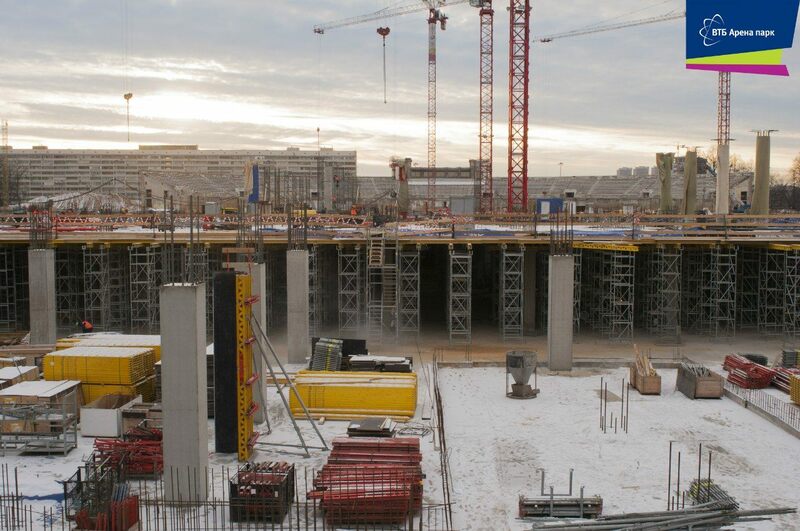 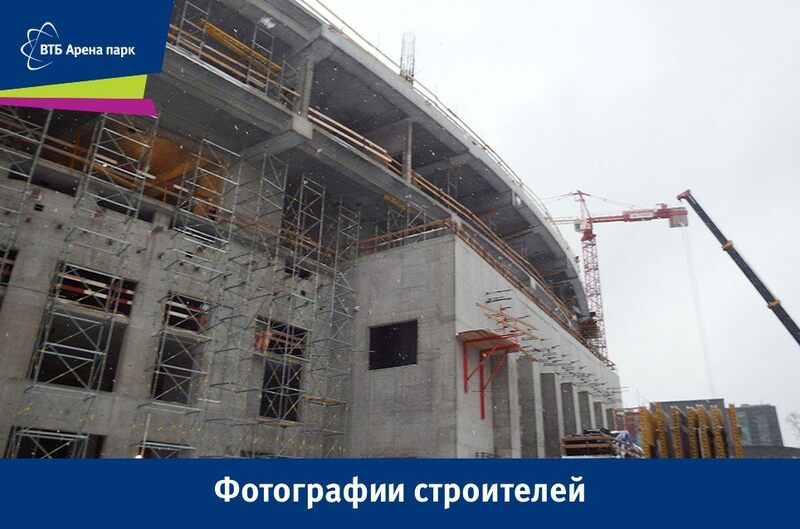 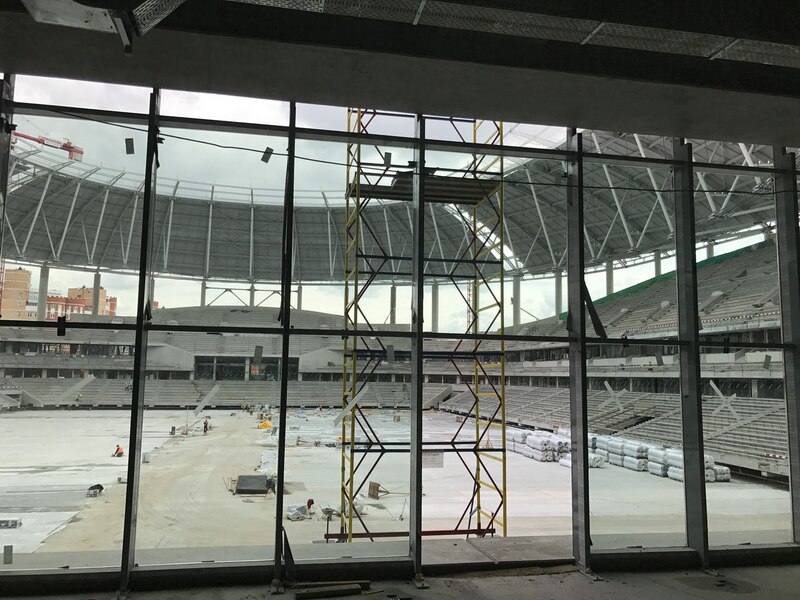 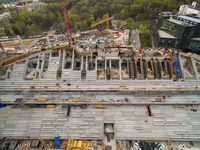 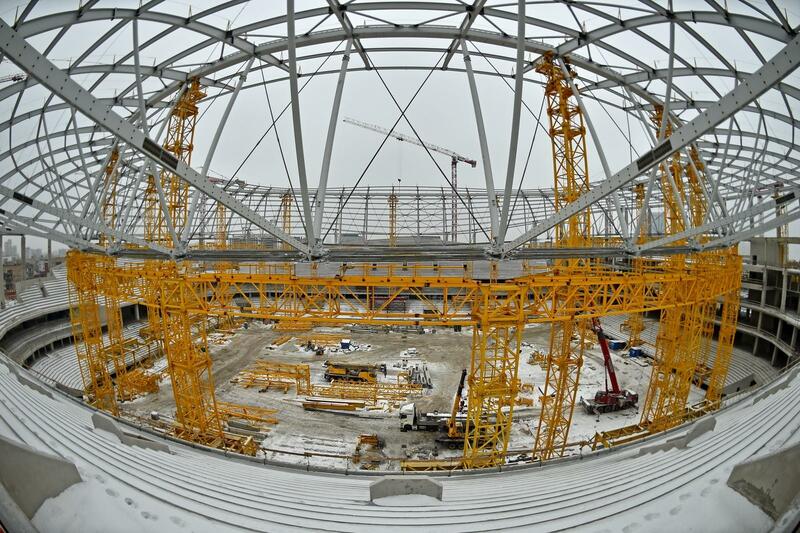 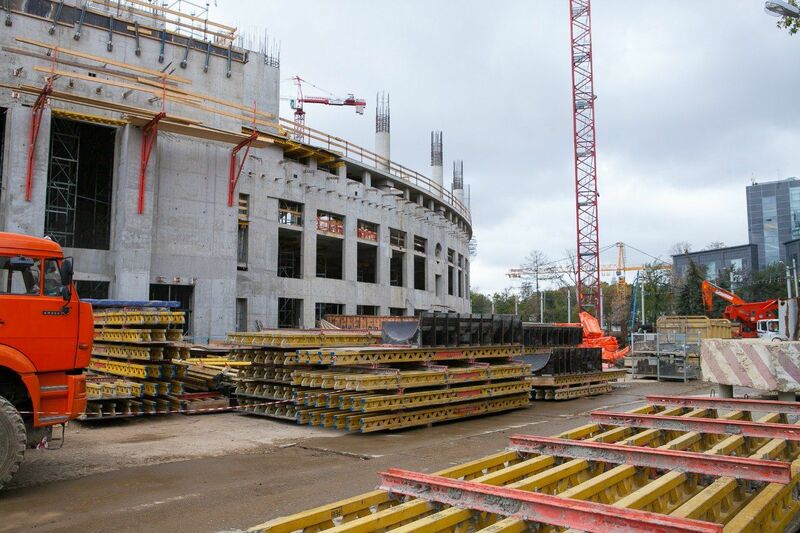 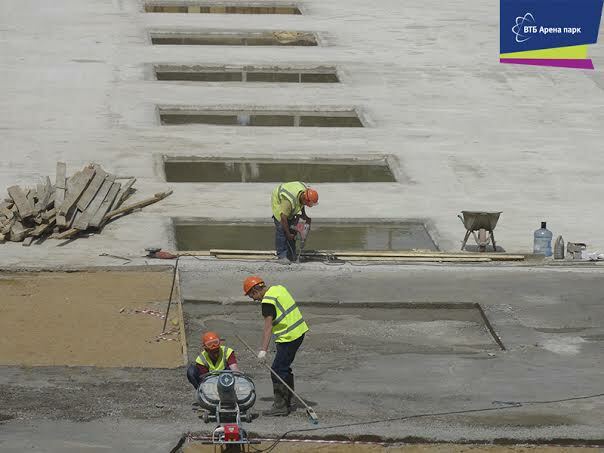 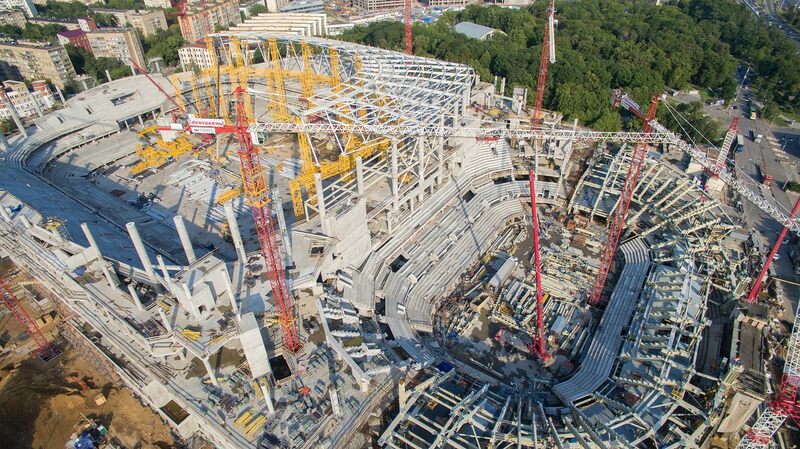 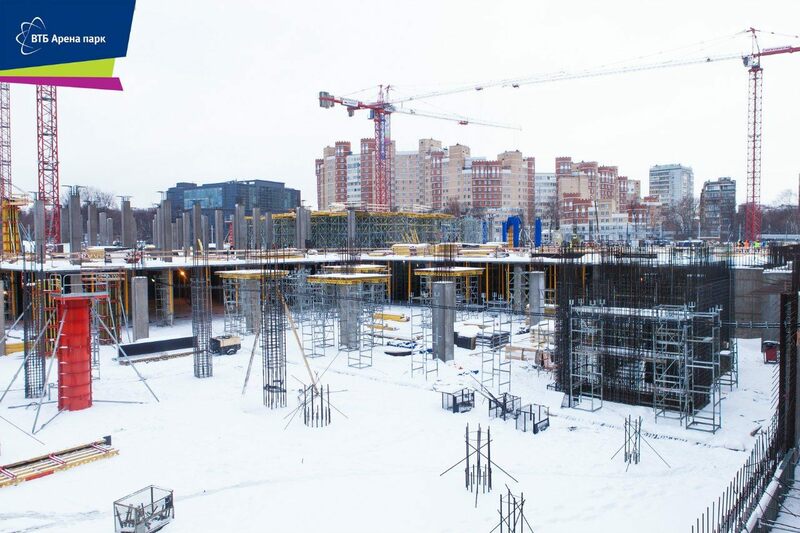 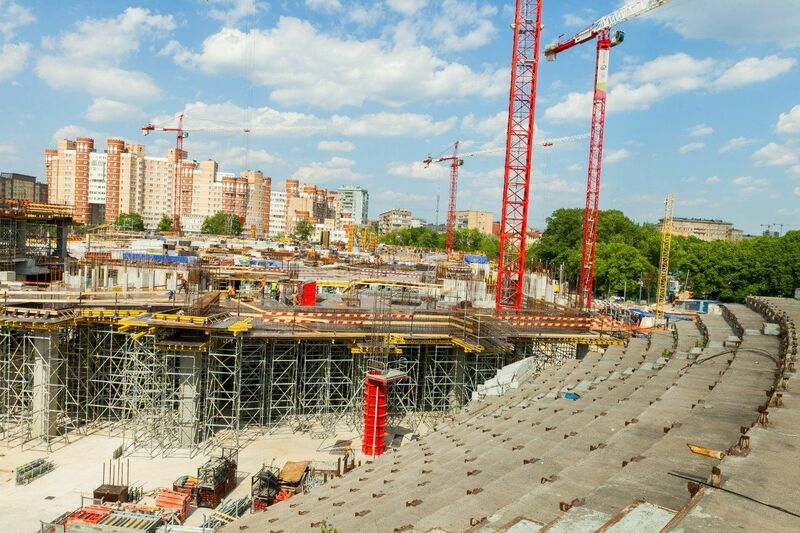 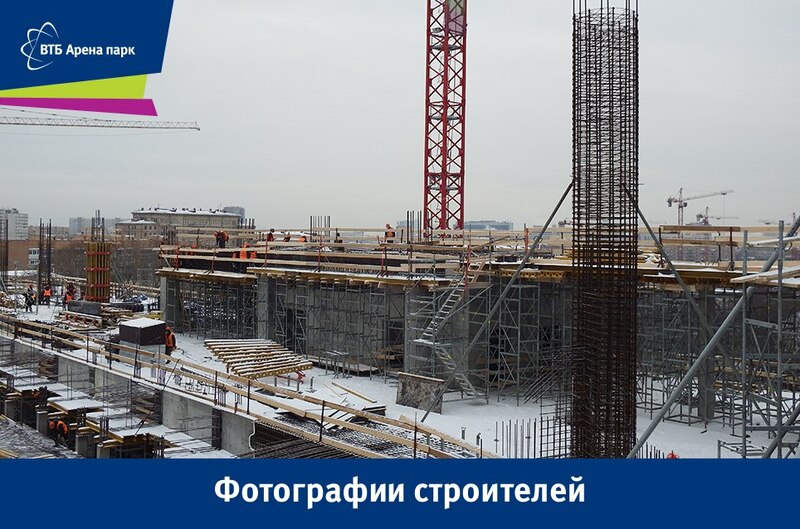 In just over 2 months the main concrete structure of VTB Arena will be ready. 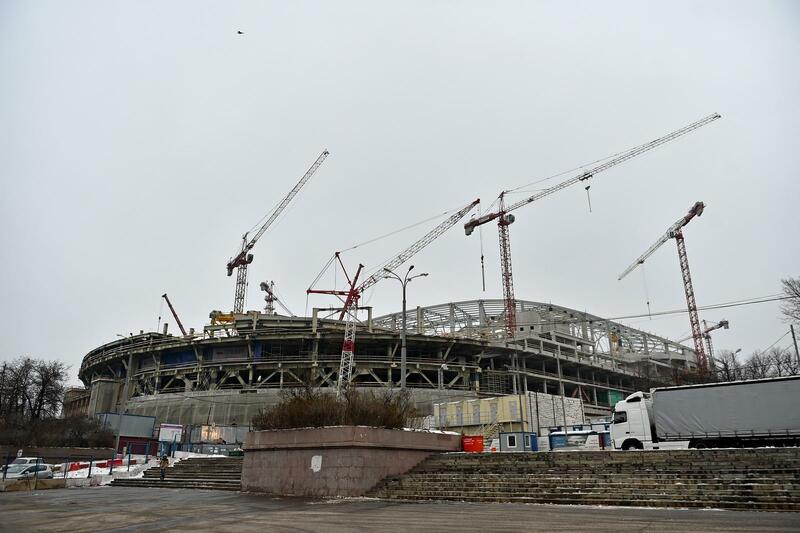 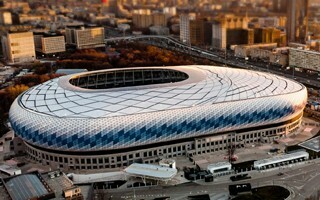 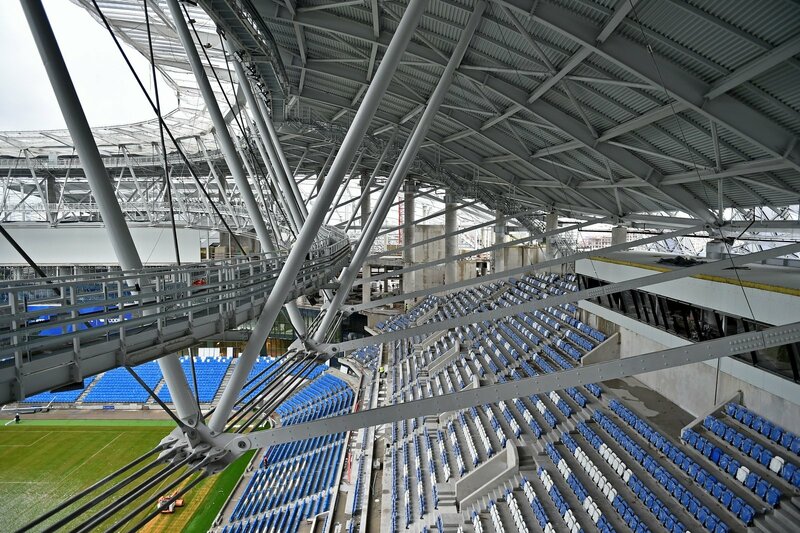 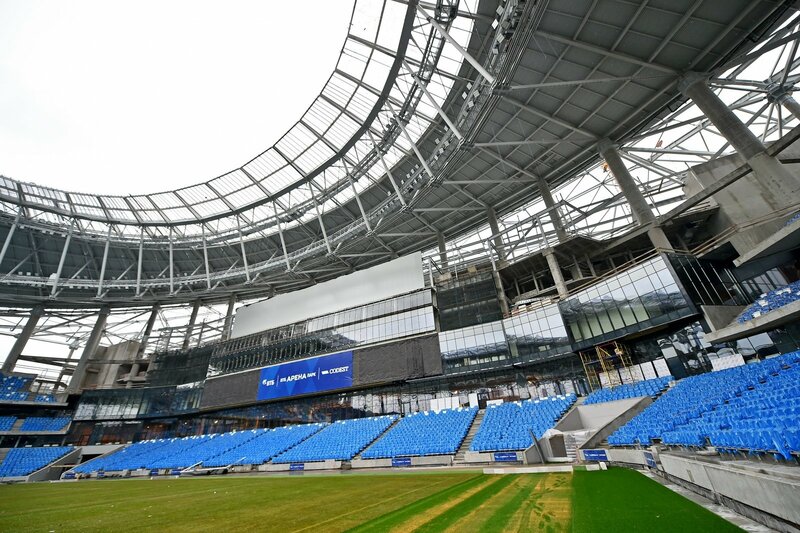 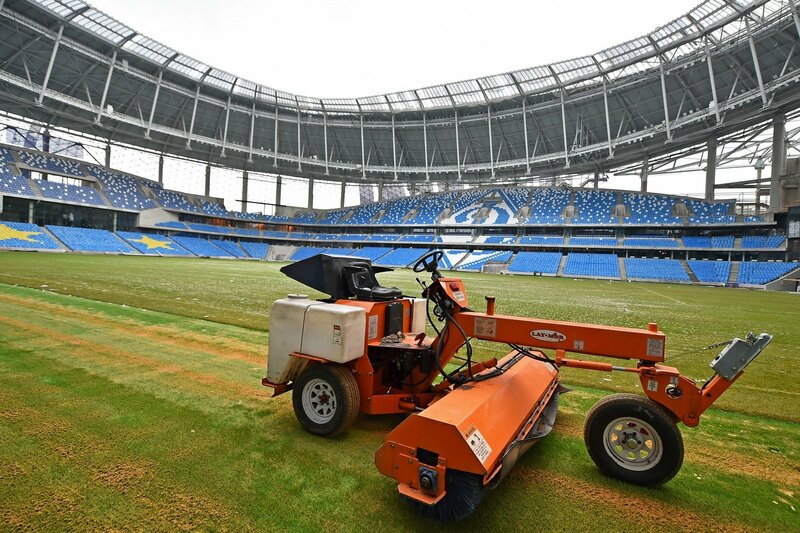 The stadium will become Moscow’s most expensive due to immense amount of other uses. 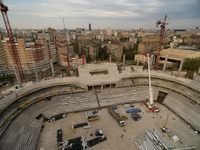 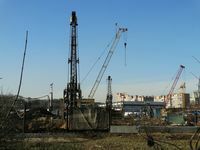 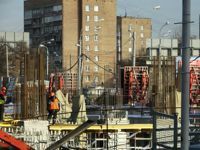 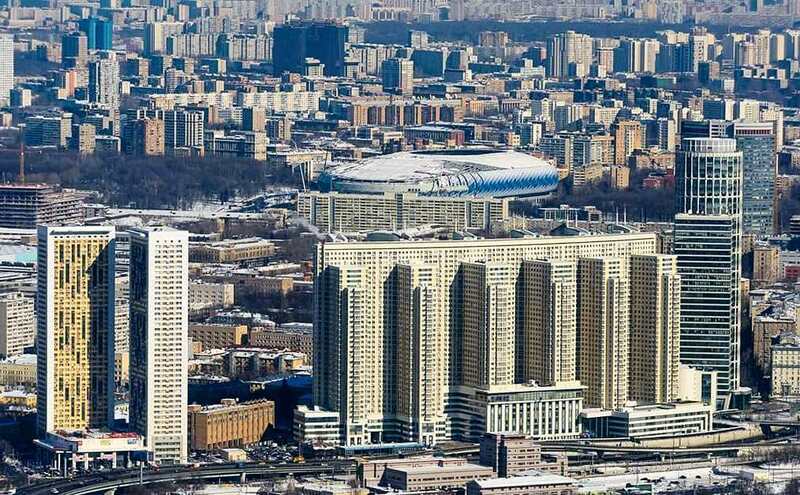 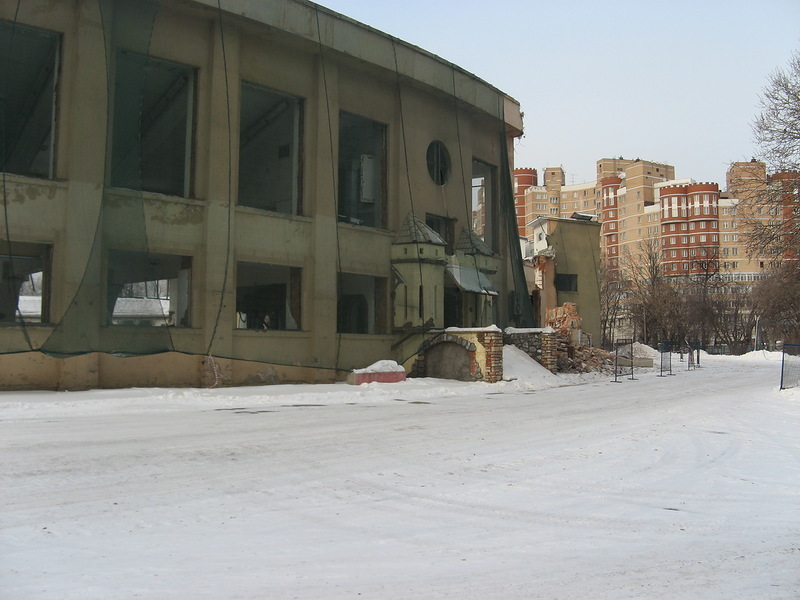 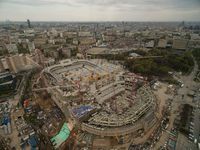 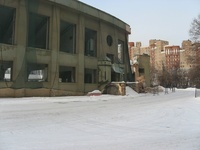 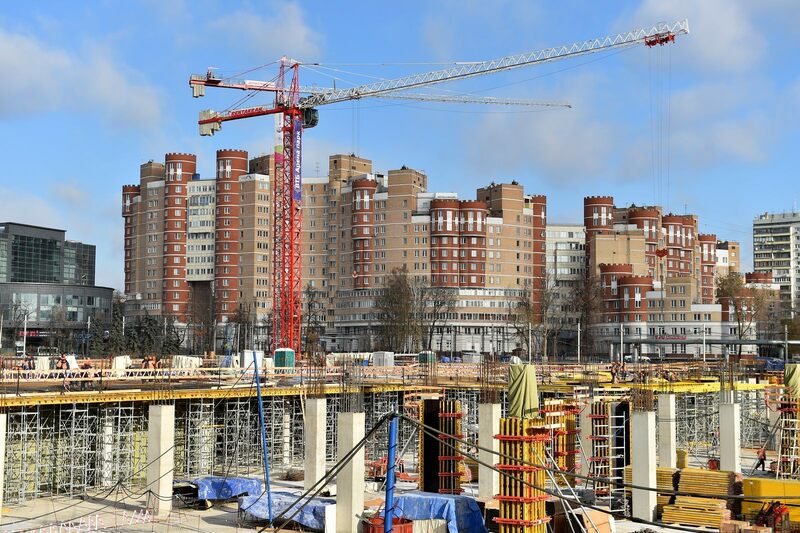 Moscow’s immense sporting-commercial complex is expected to recover its cost after just 9 years in operation. 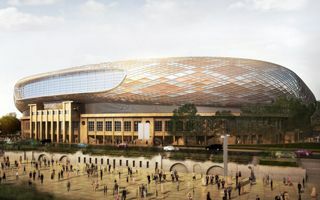 But it’s not the stadium that will bring biggest income. 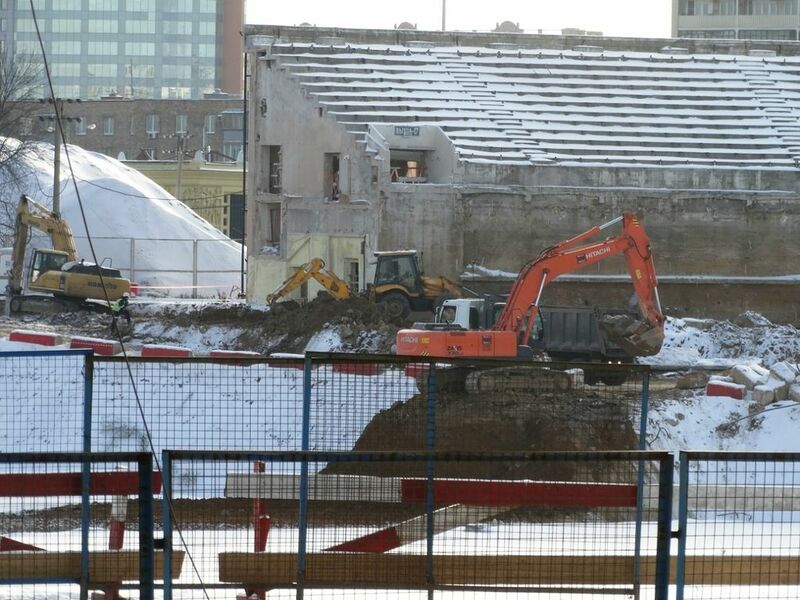 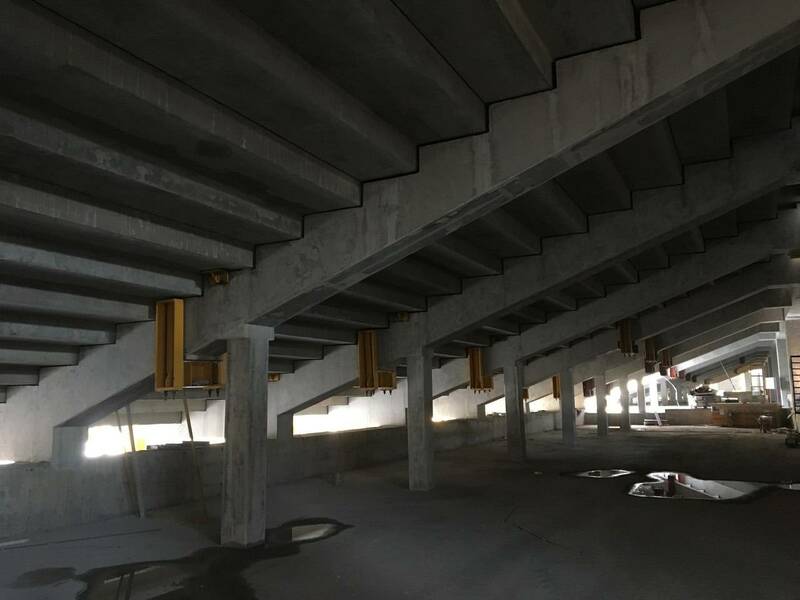 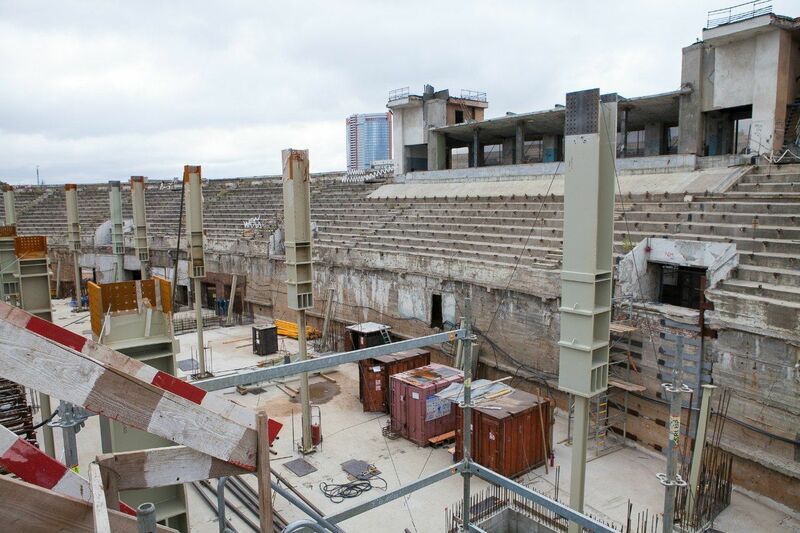 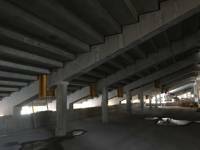 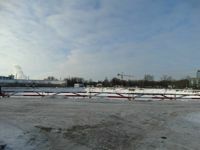 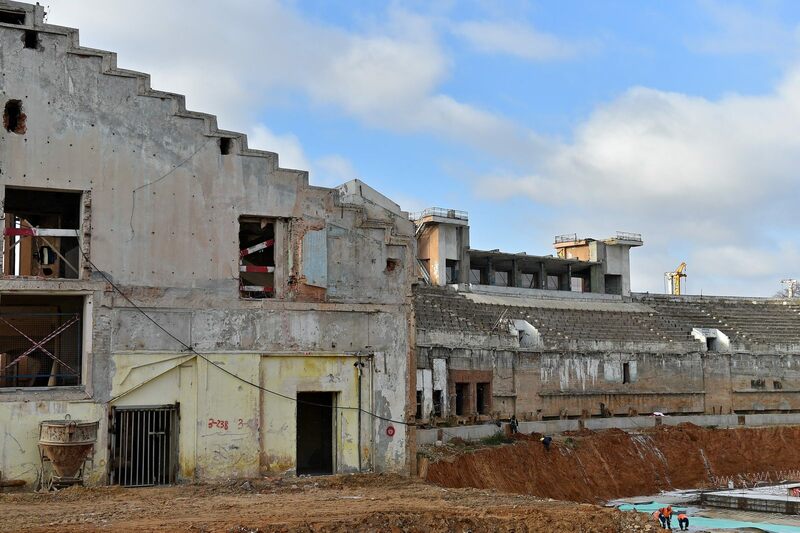 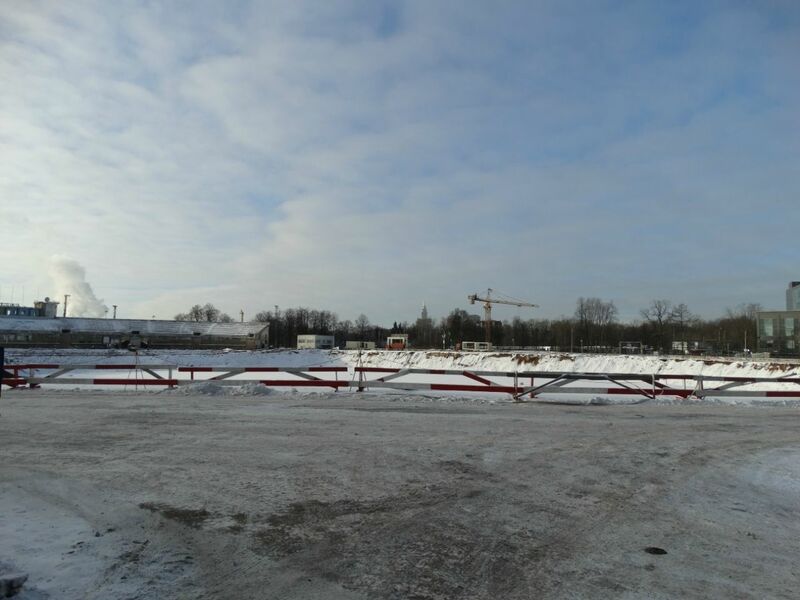 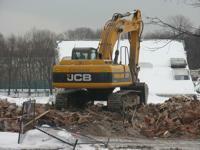 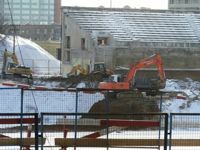 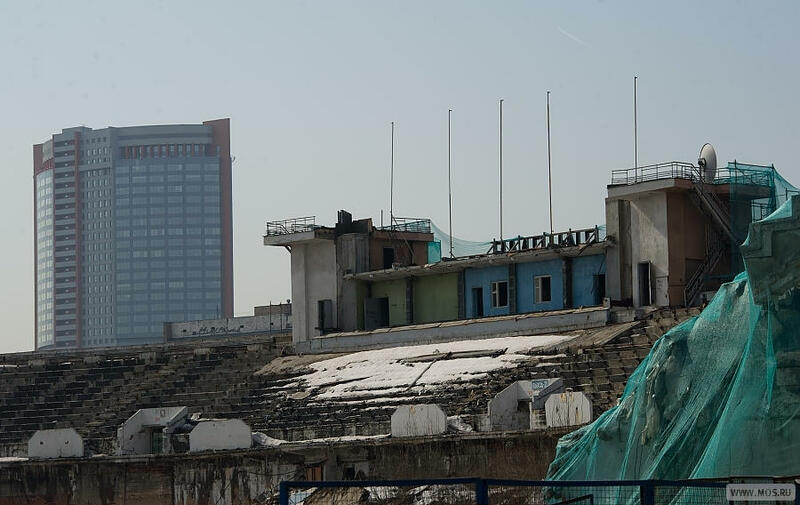 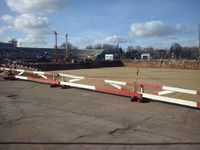 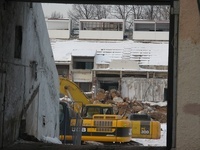 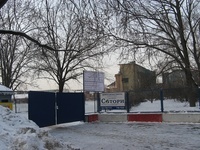 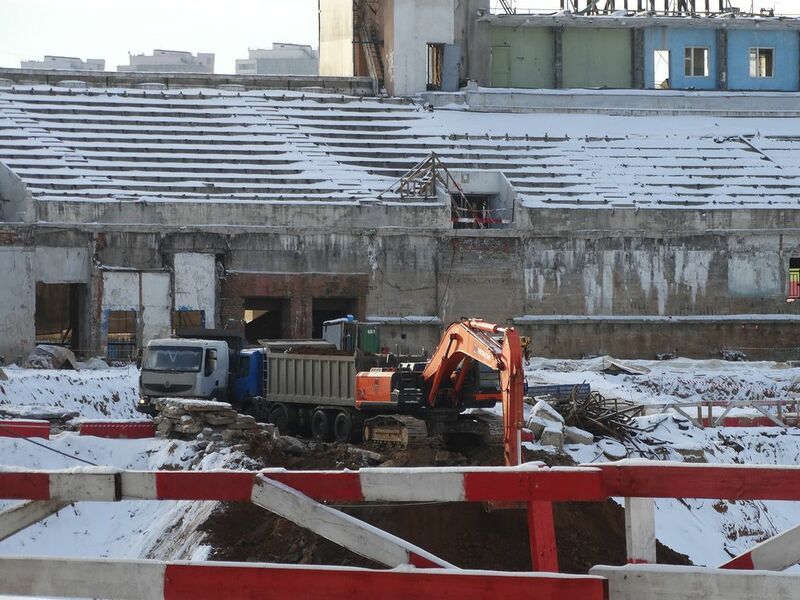 After demolition of most of the old stadium, works are set to begin on the new structure. 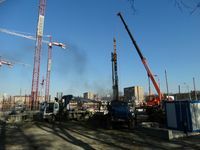 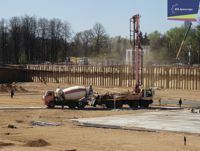 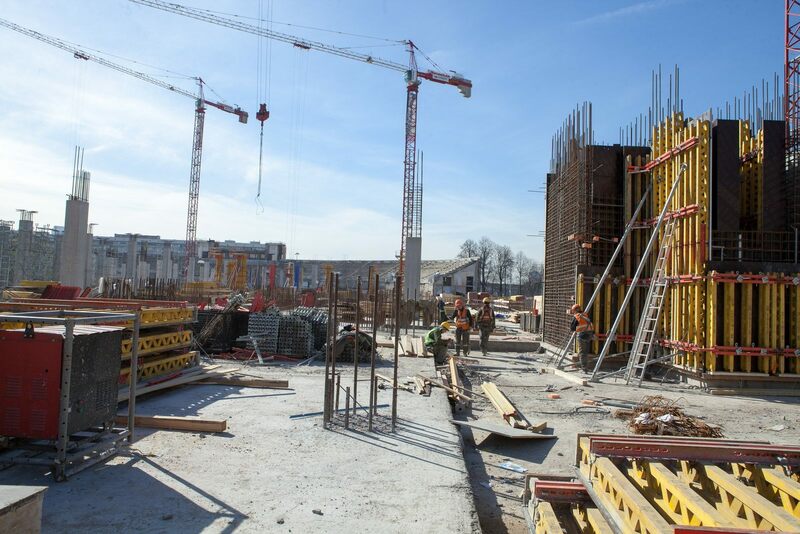 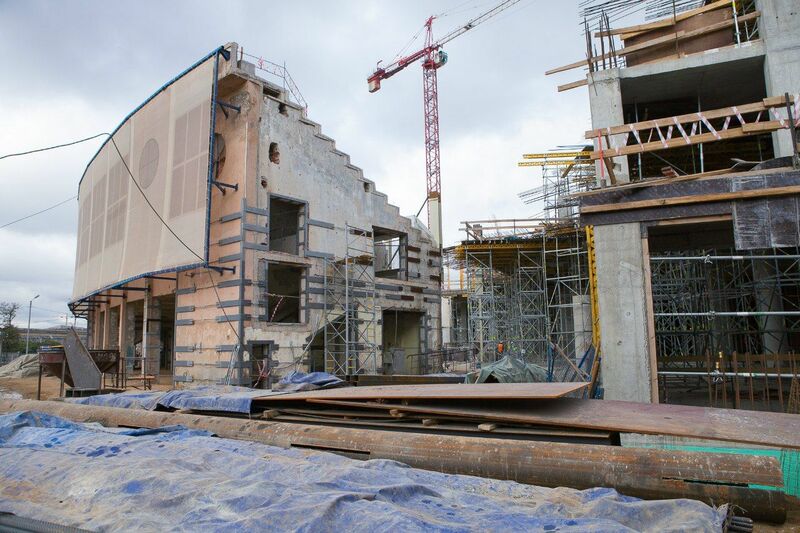 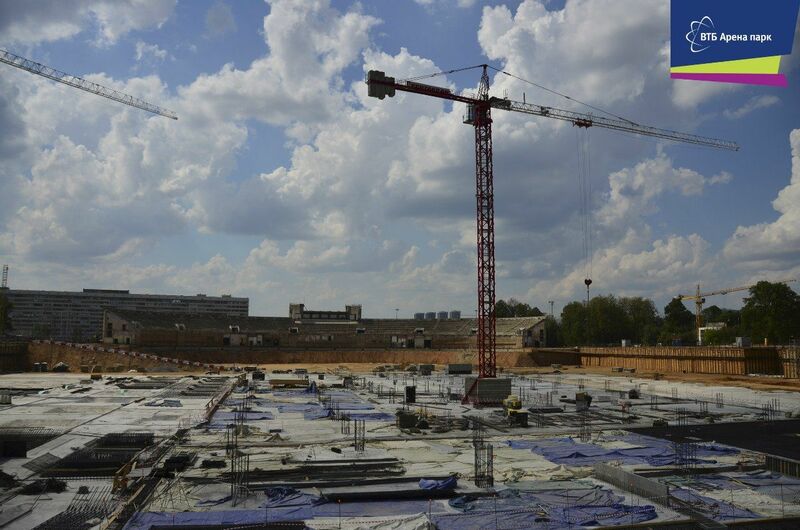 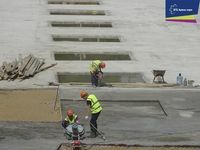 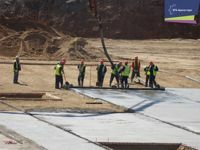 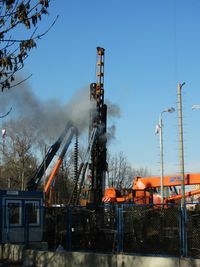 French construction giants Vinci will carry works worth some $750 million, TheMoscowTimes.com informs. 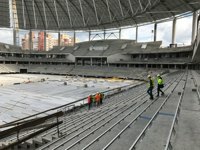 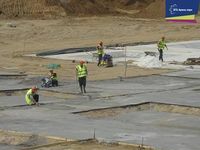 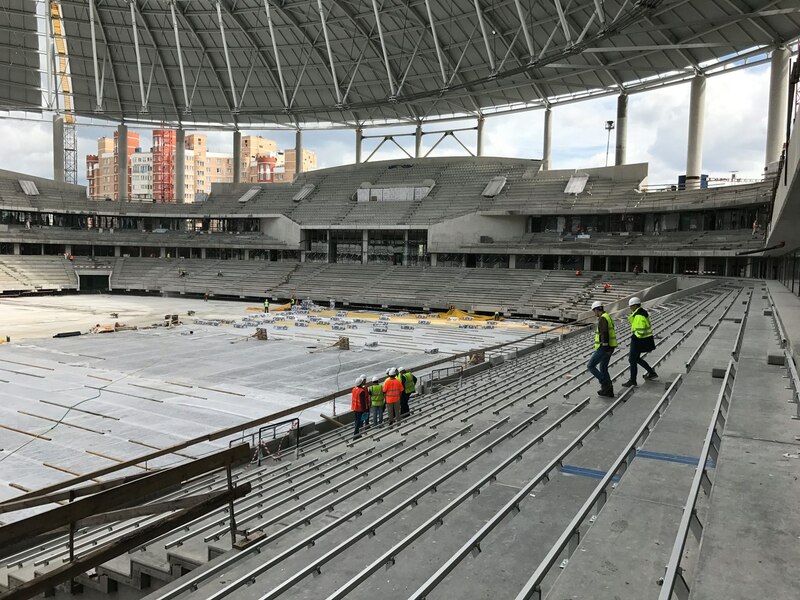 Since no World Cup games are to be held here, there's no rush, EuroSport.com claims. 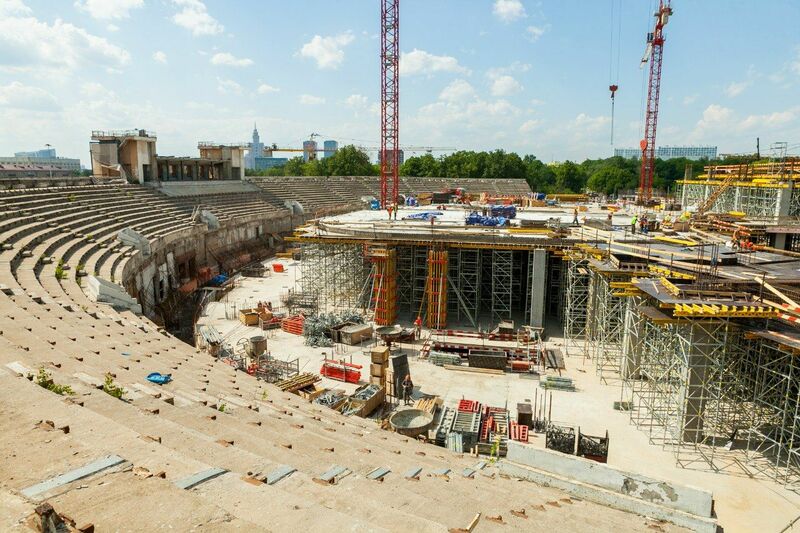 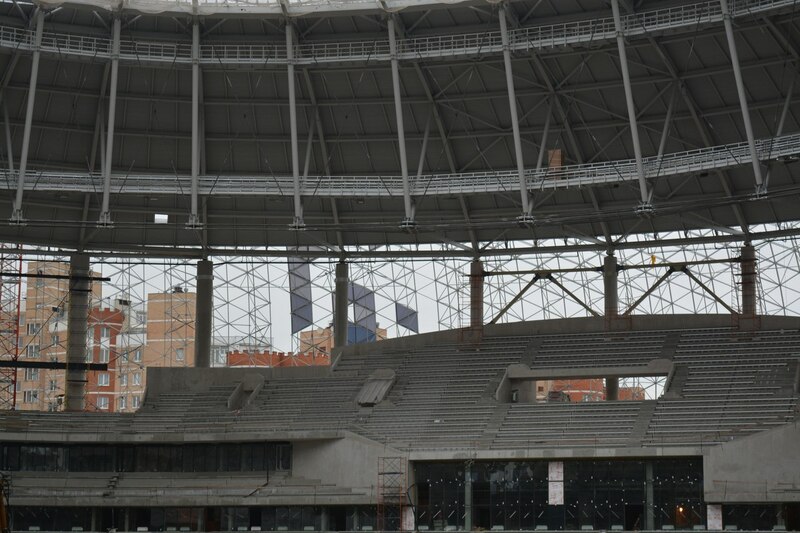 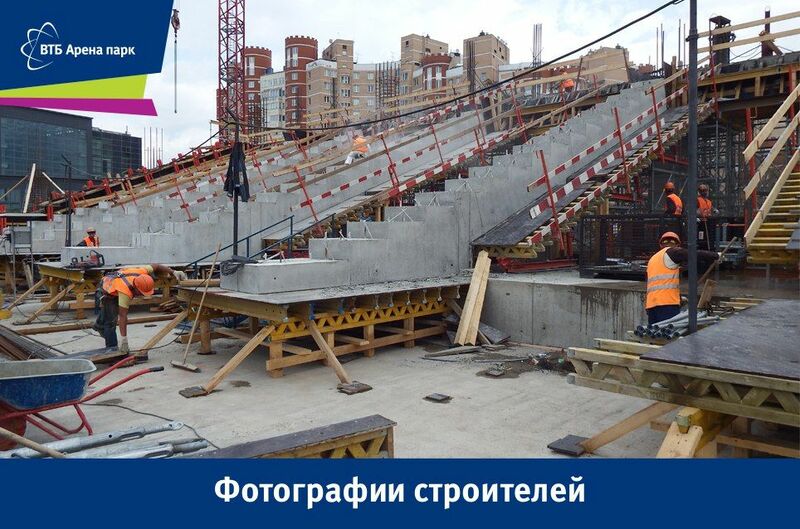 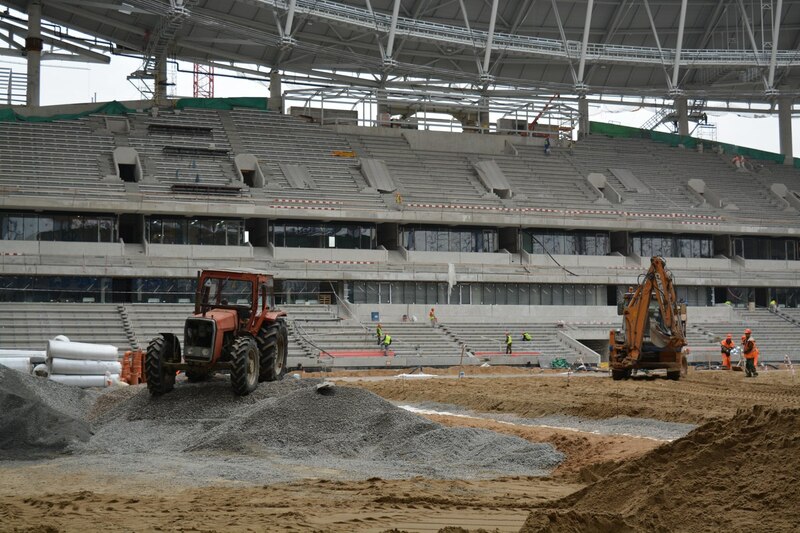 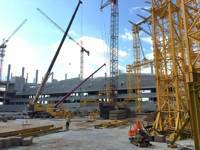 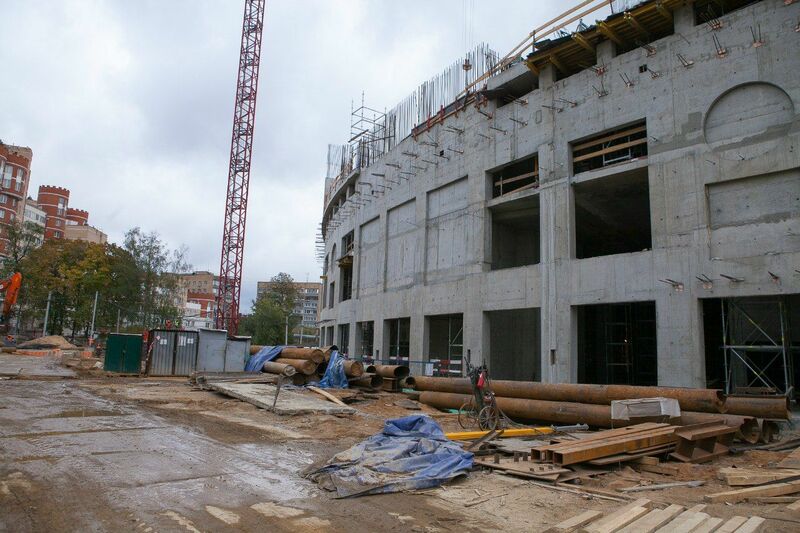 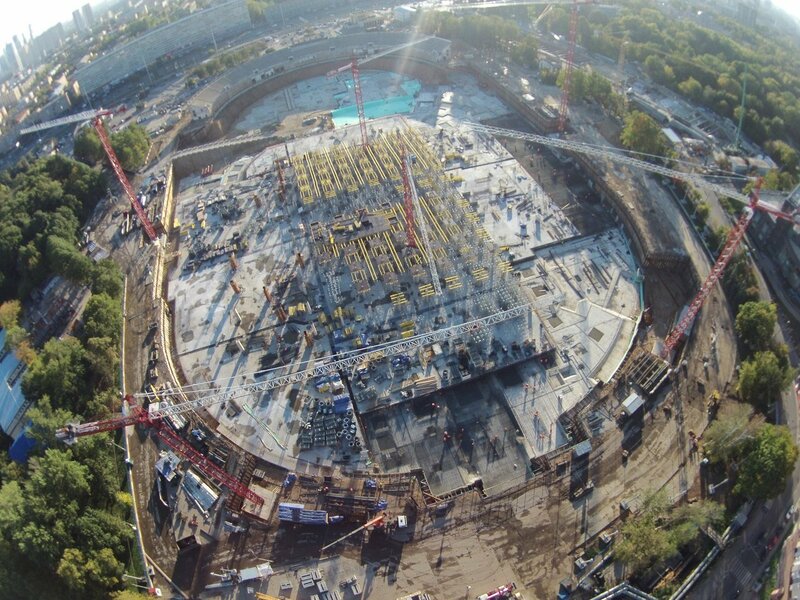 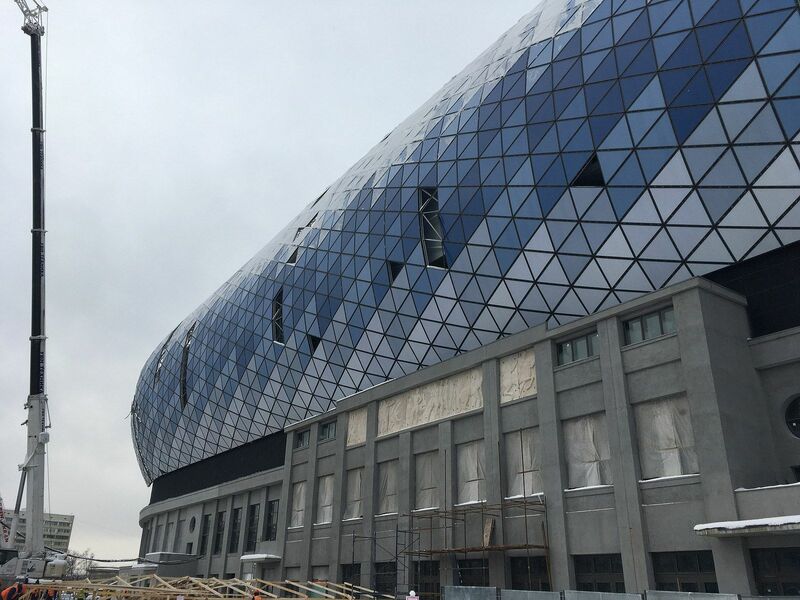 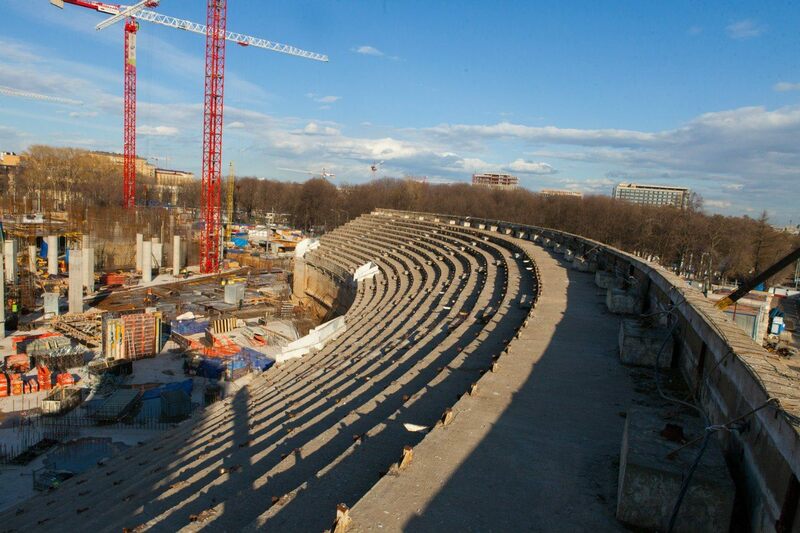 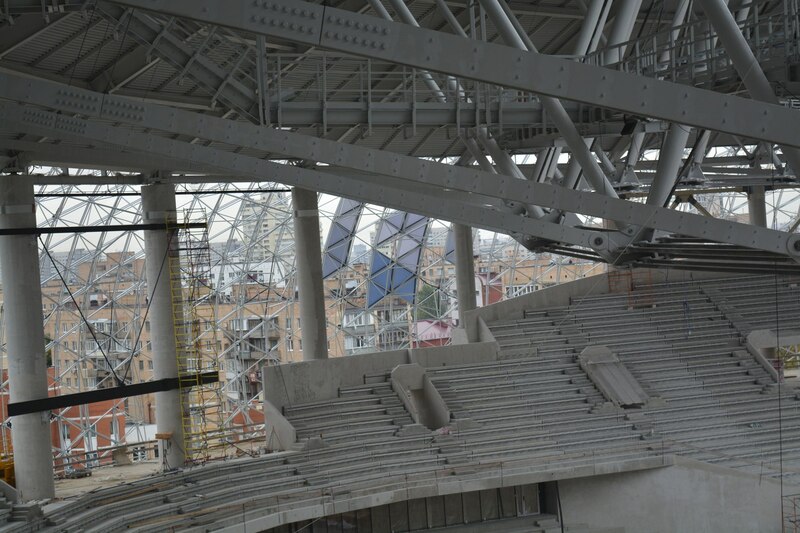 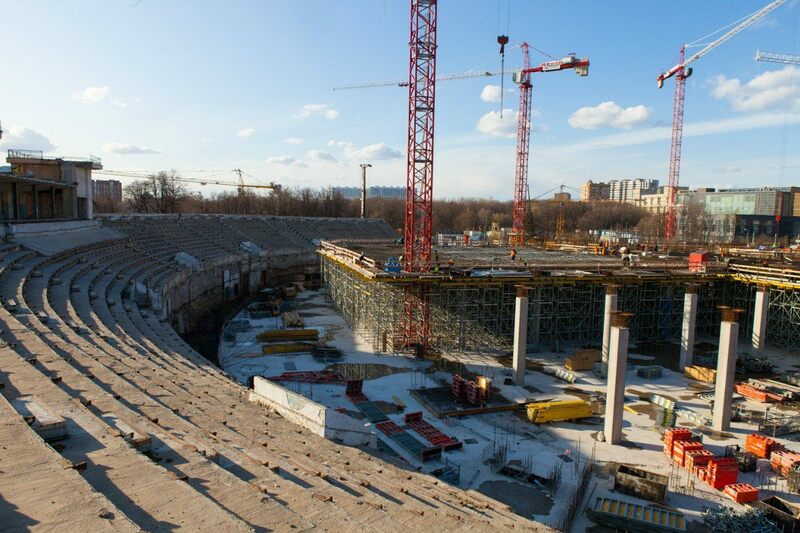 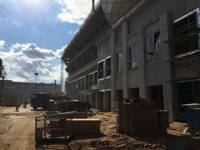 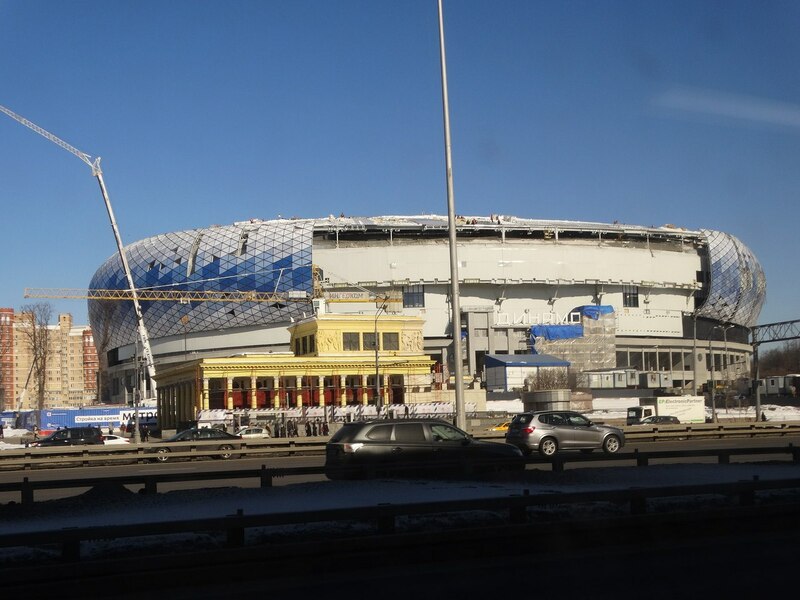 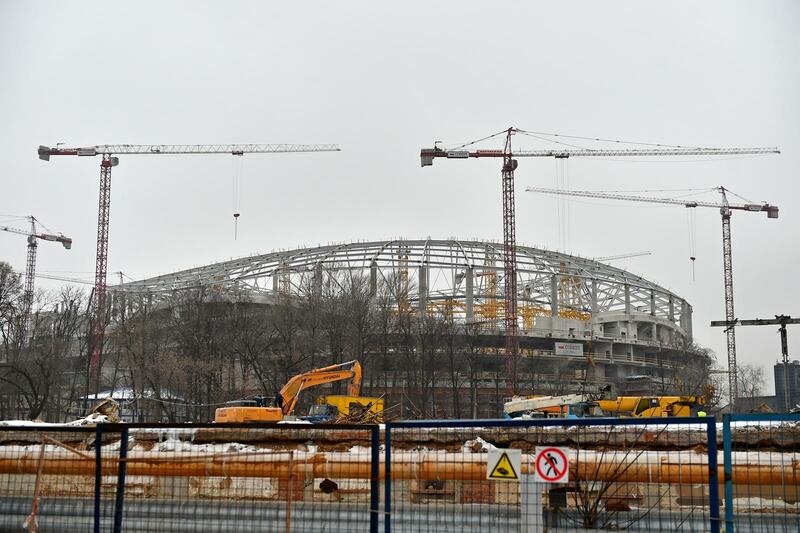 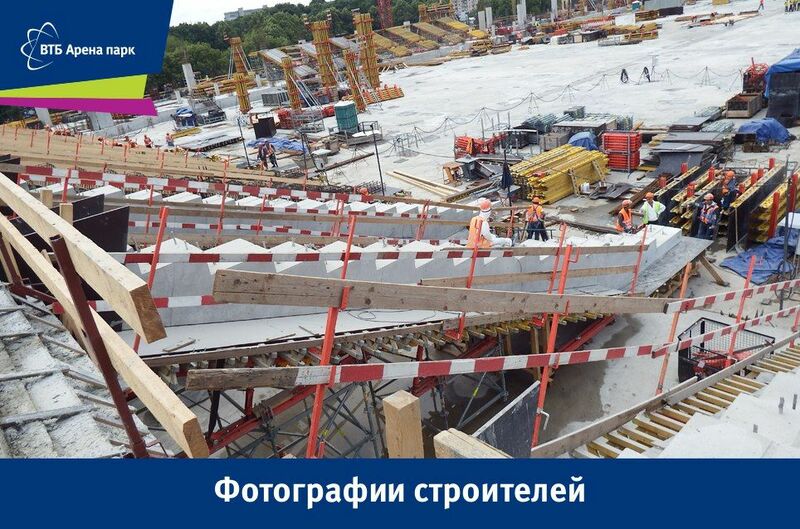 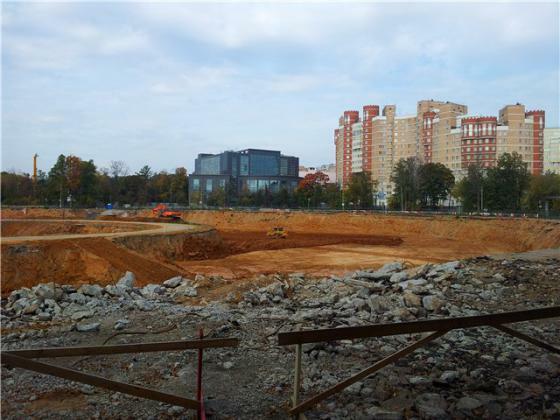 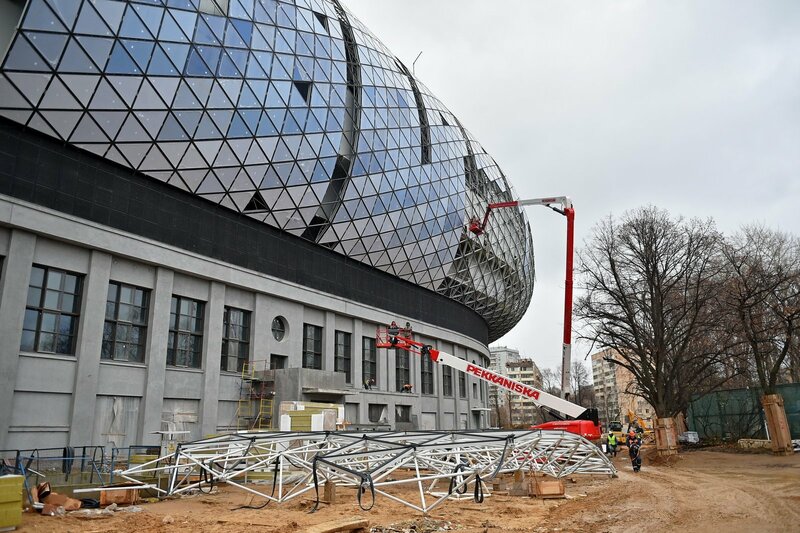 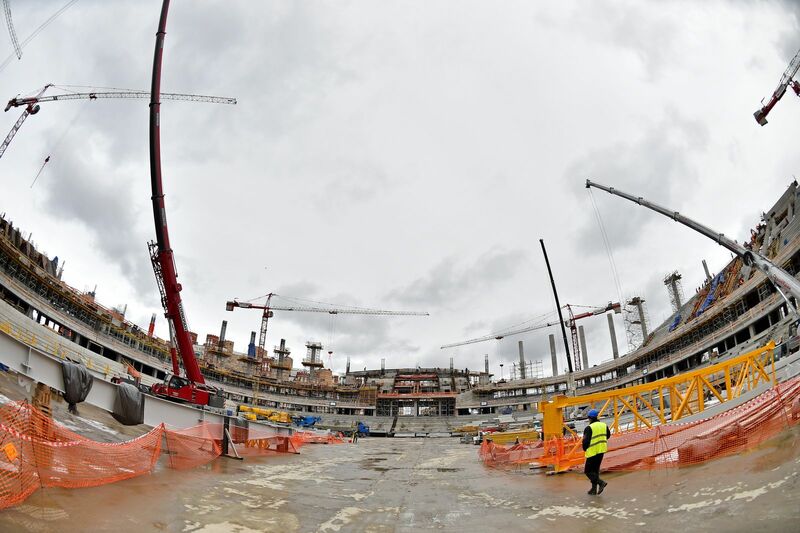 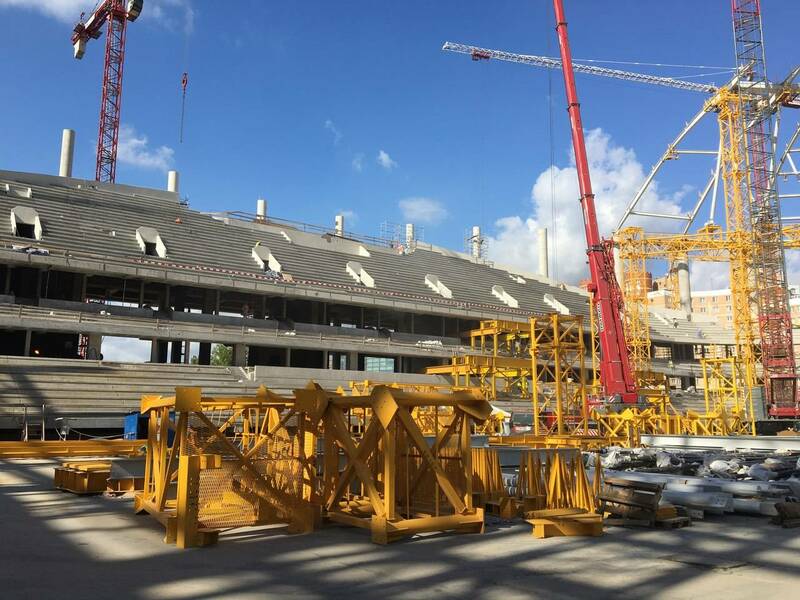 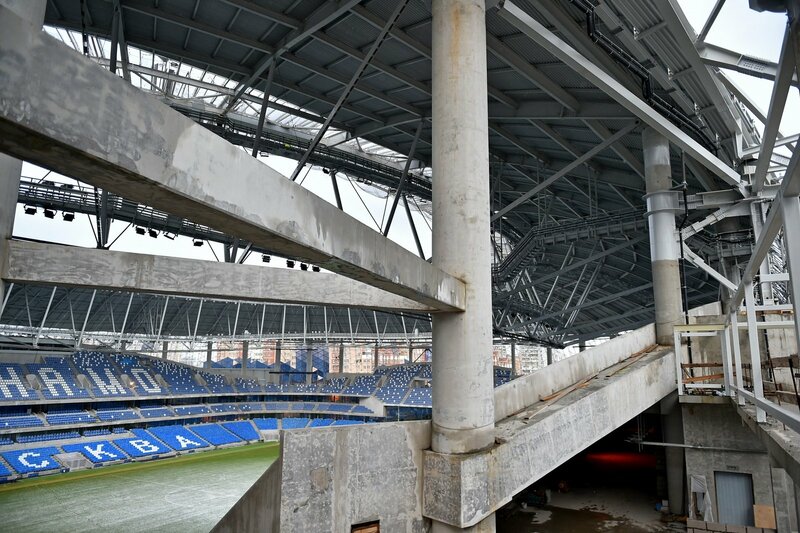 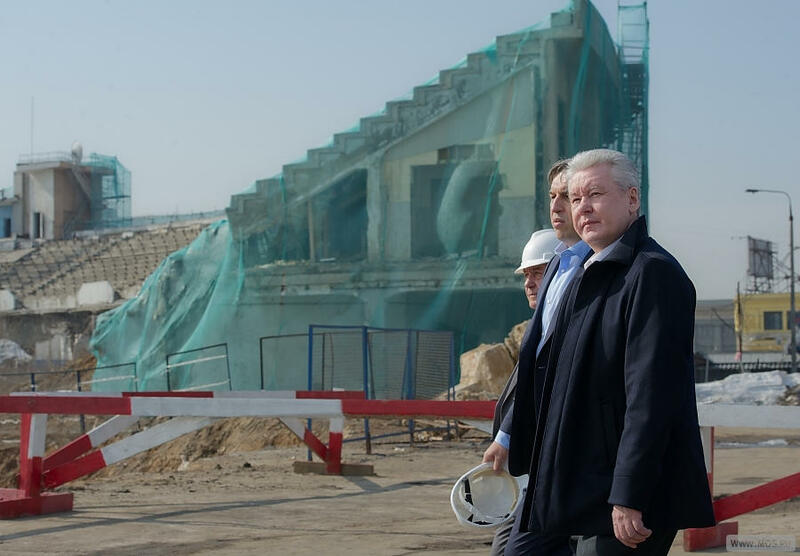 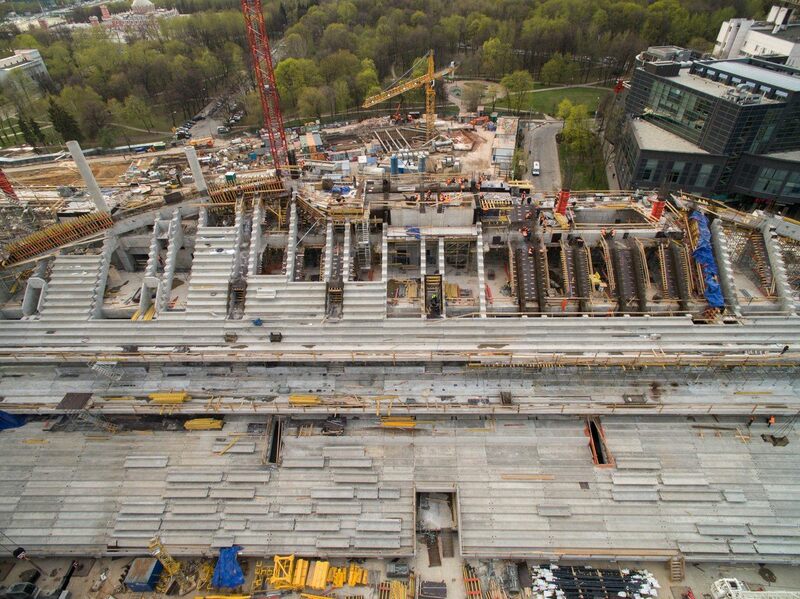 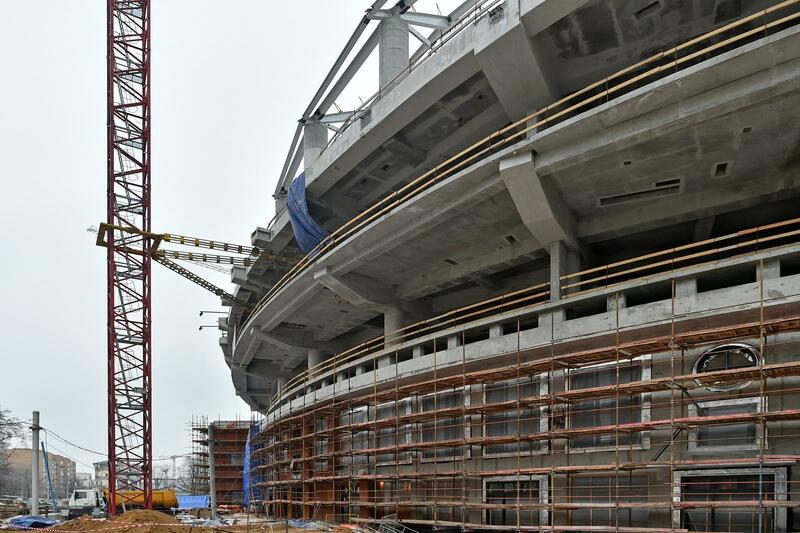 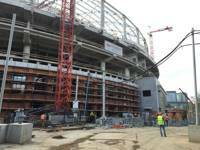 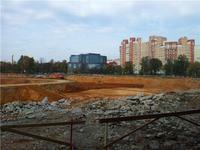 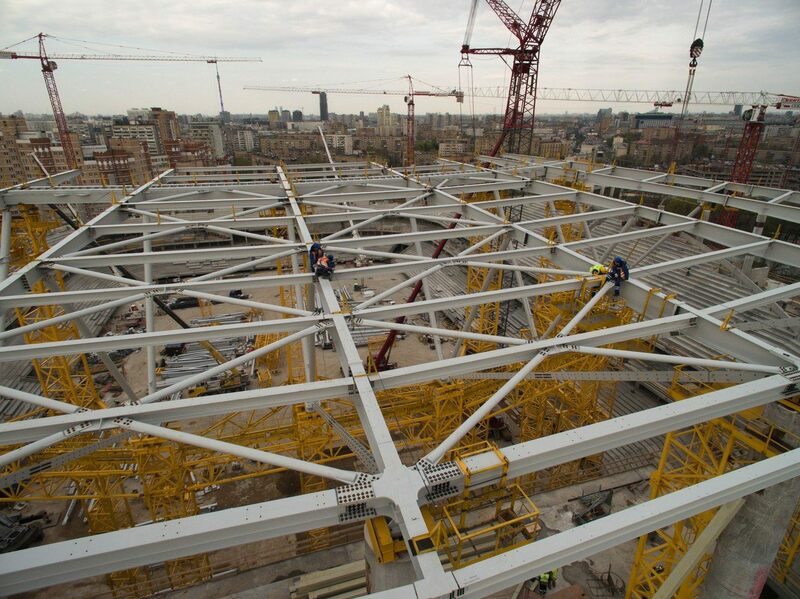 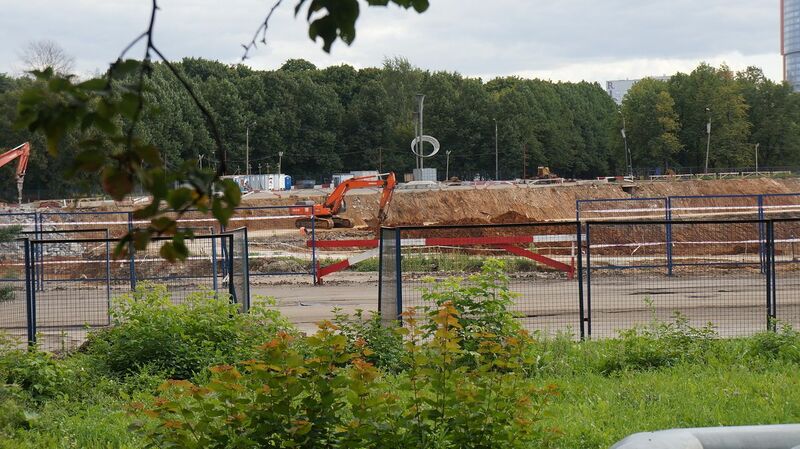 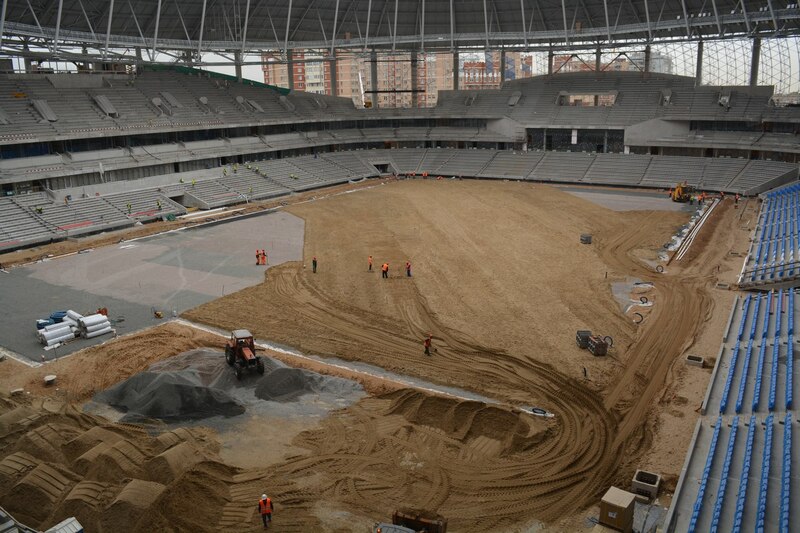 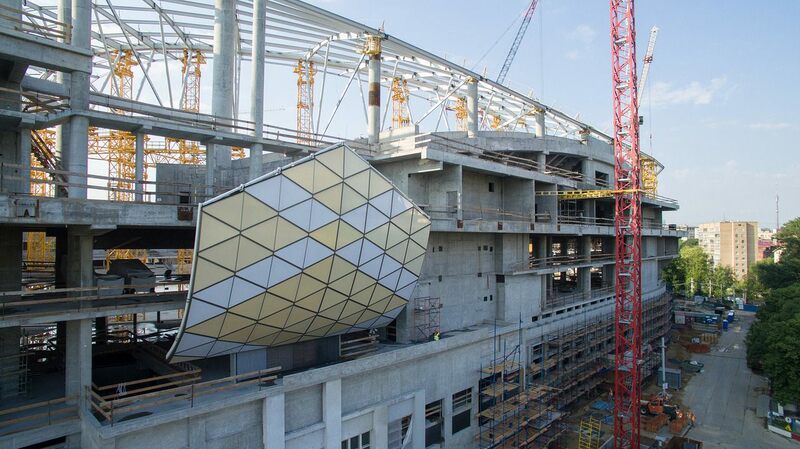 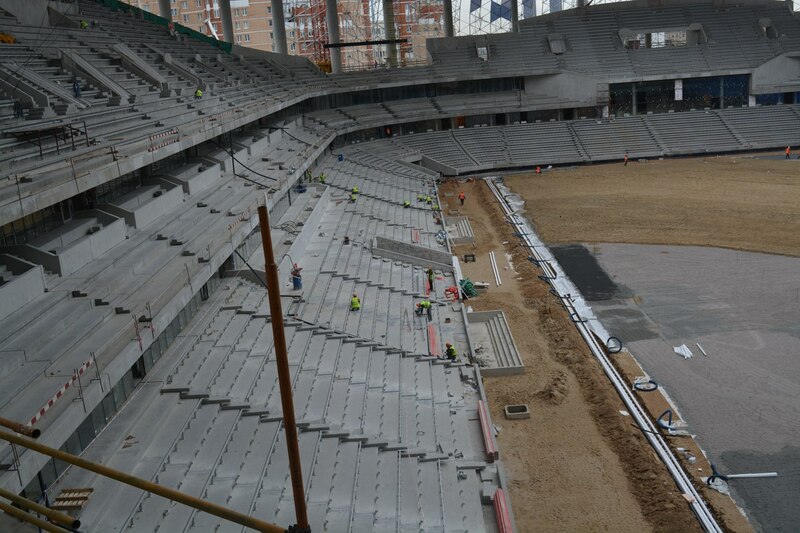 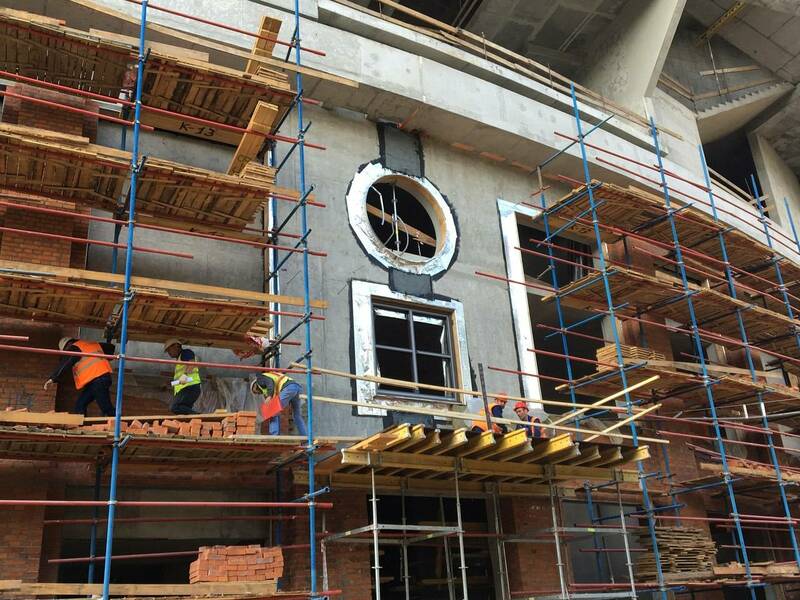 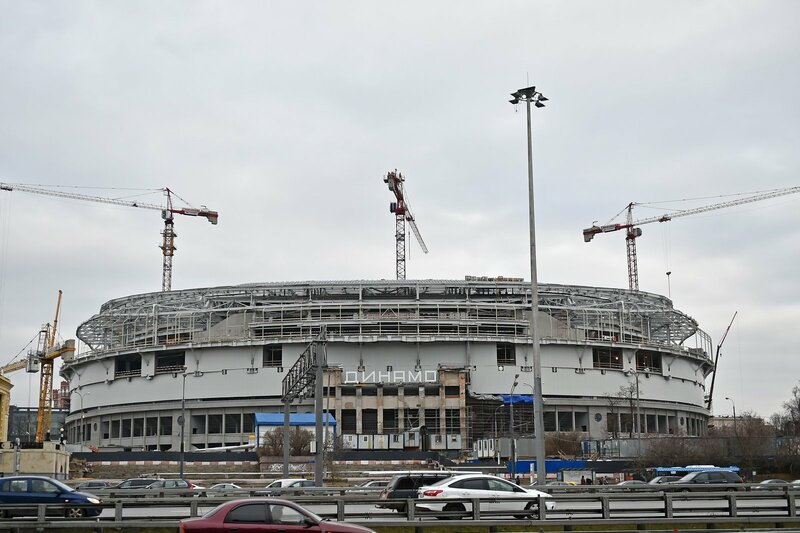 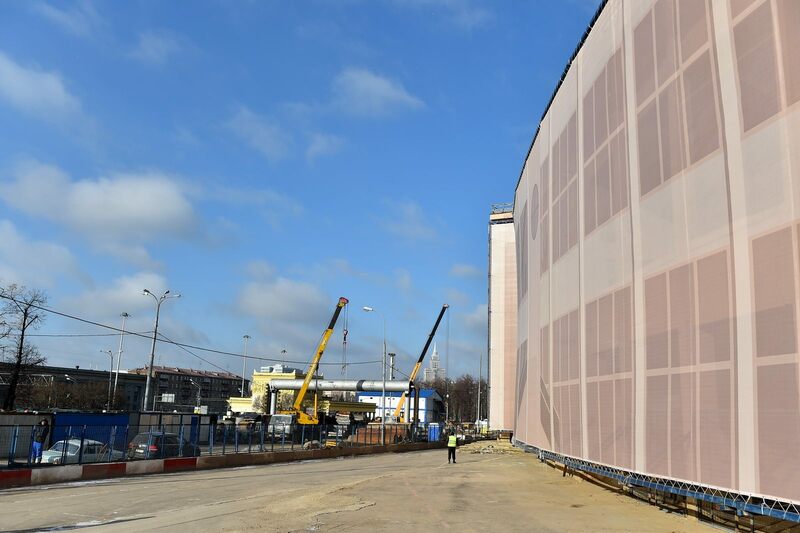 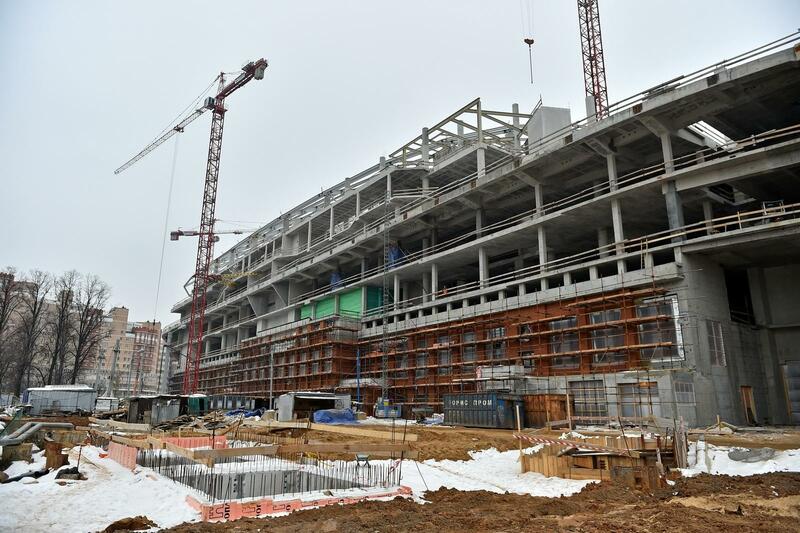 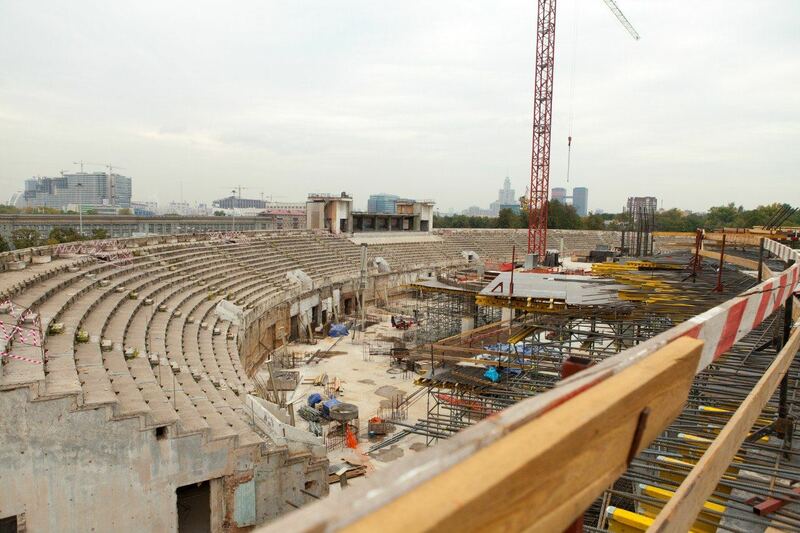 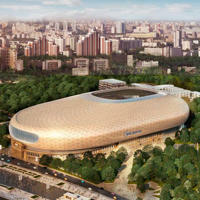 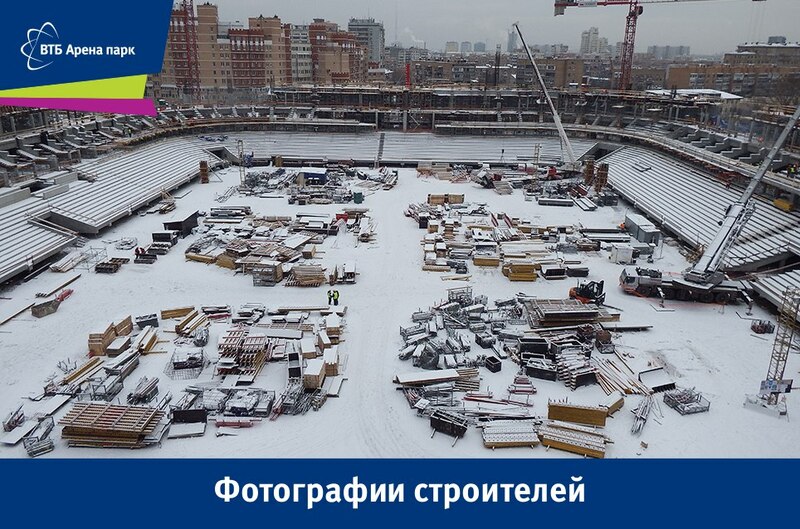 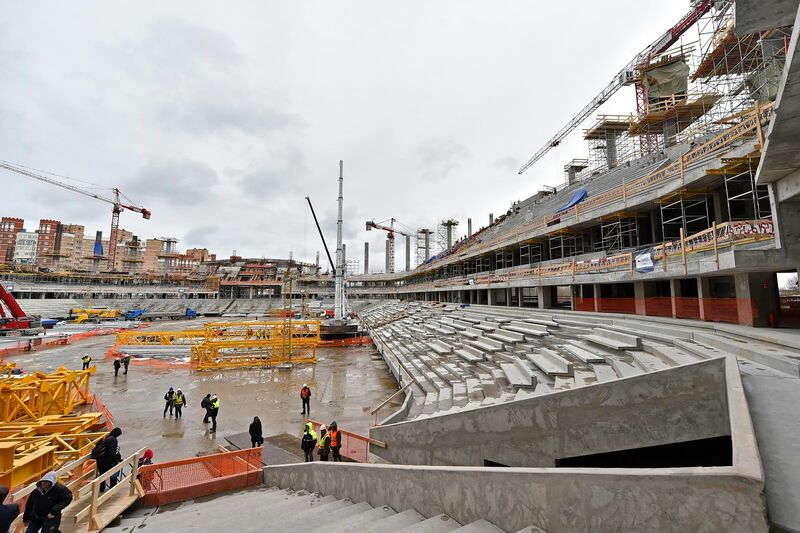 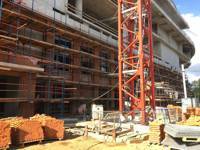 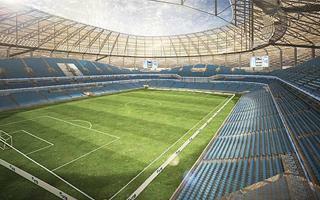 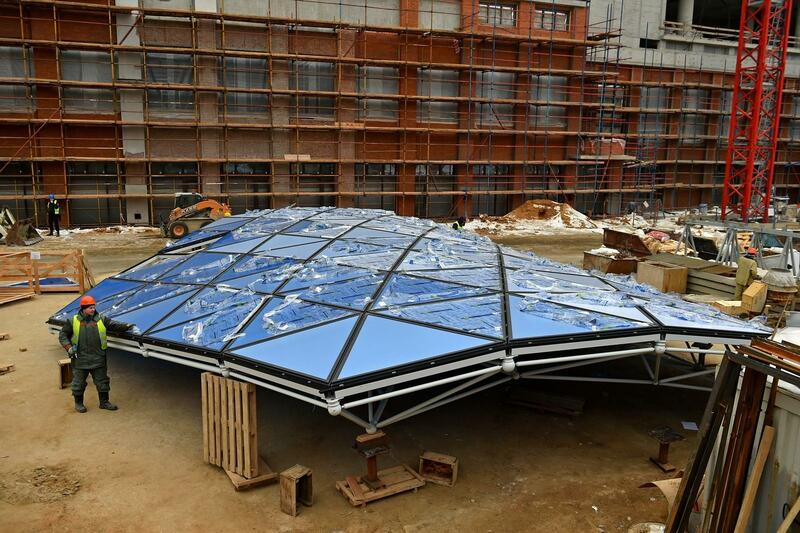 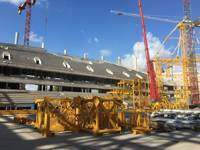 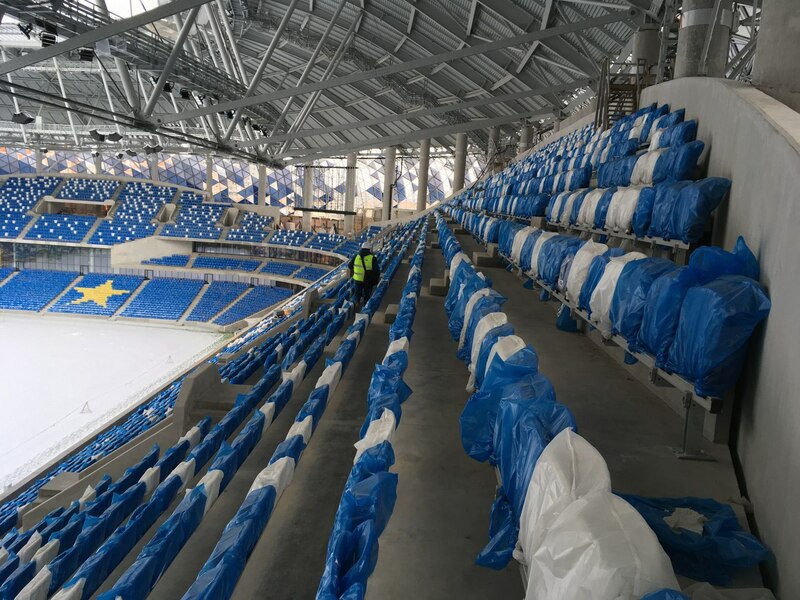 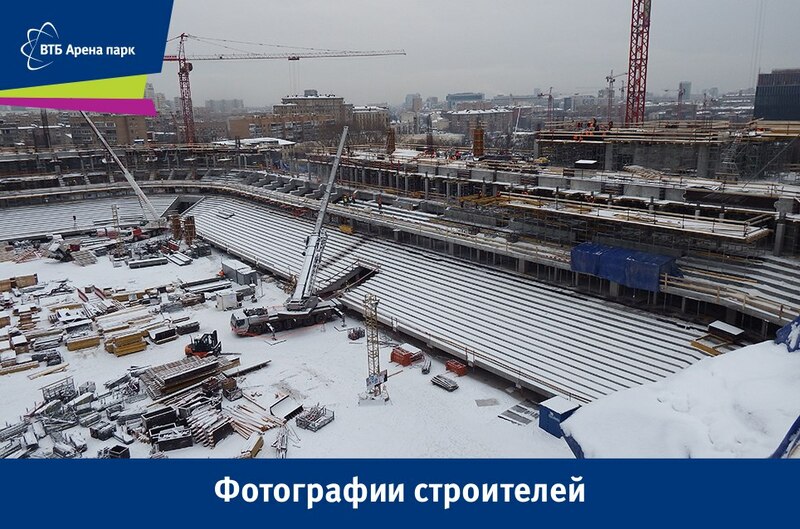 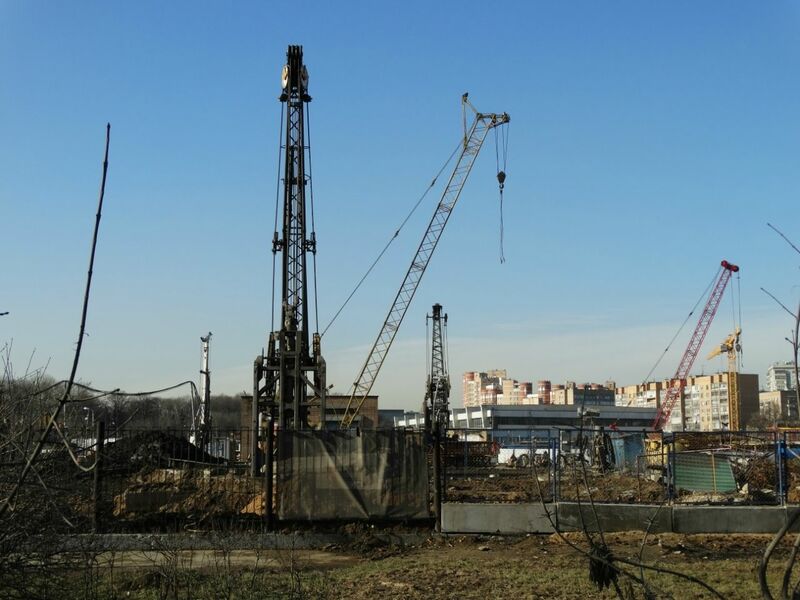 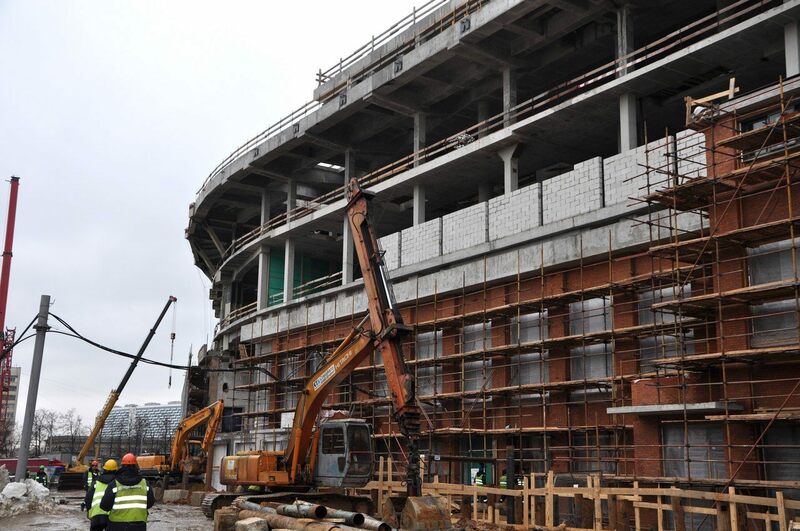 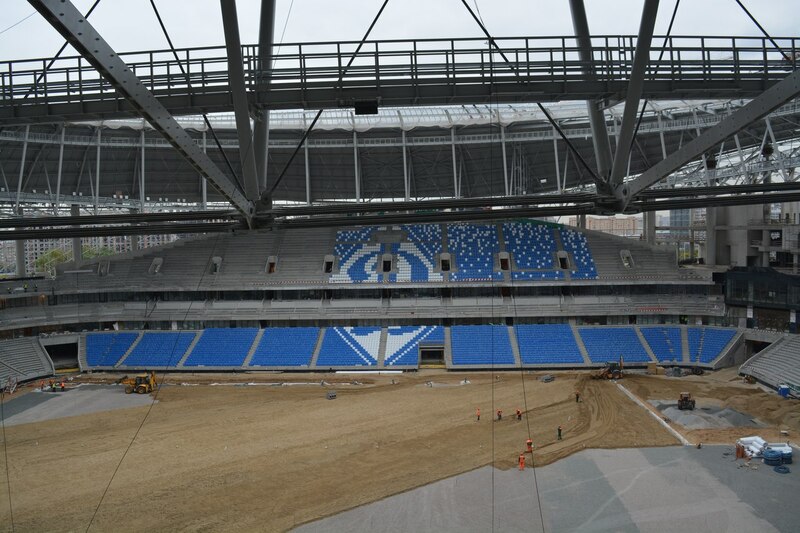 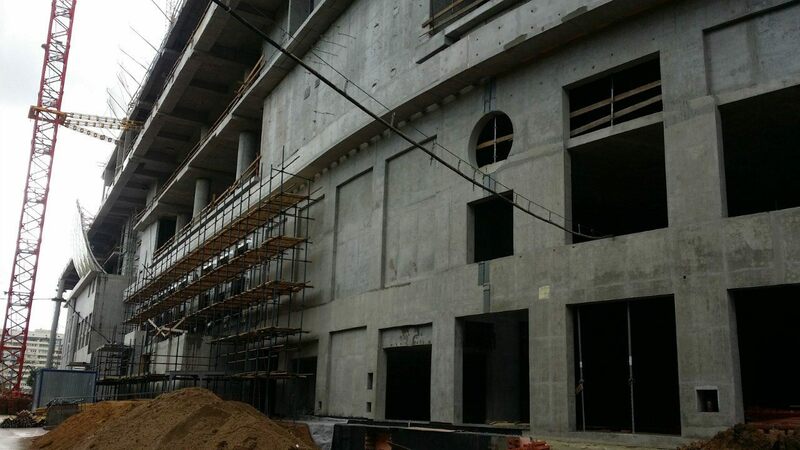 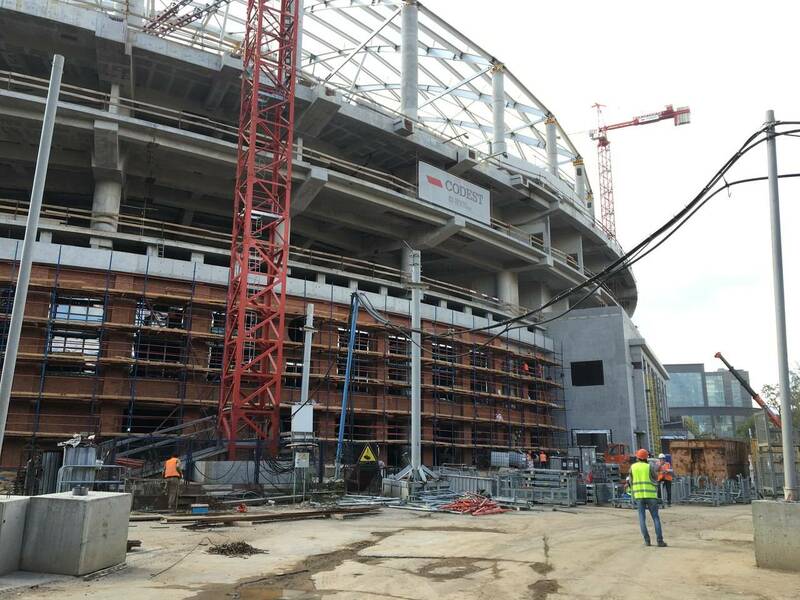 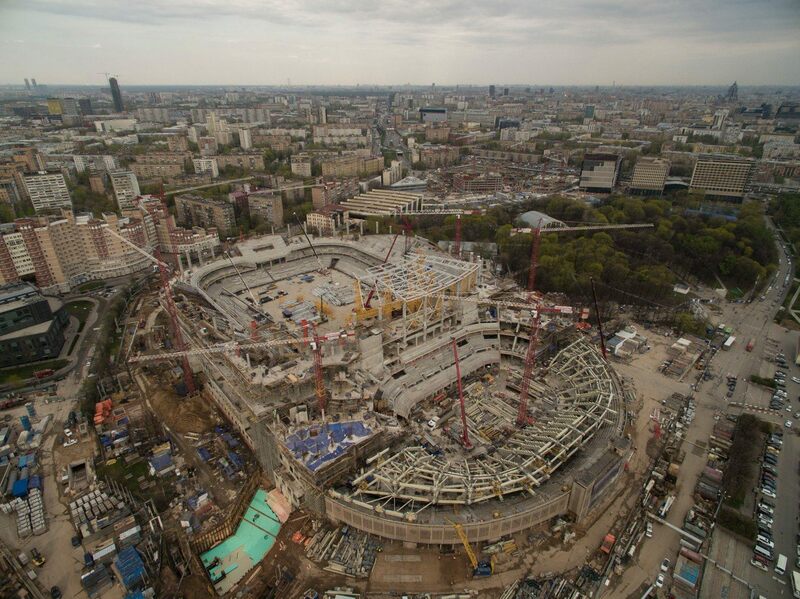 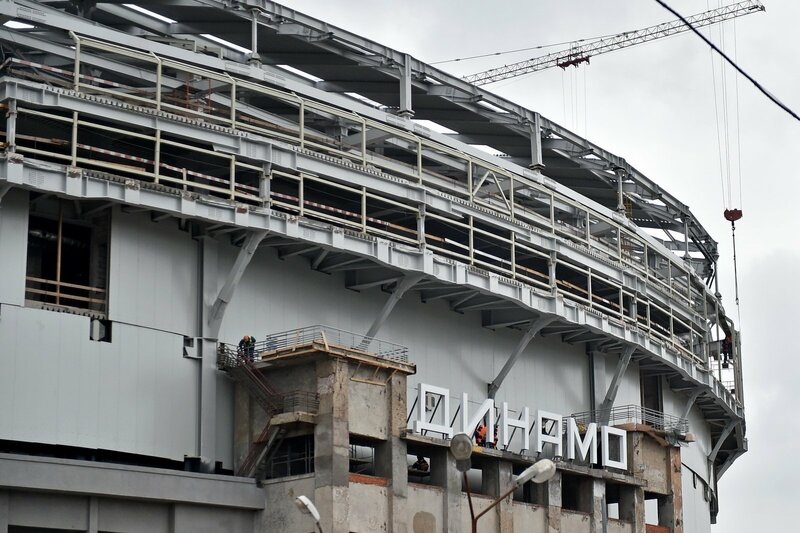 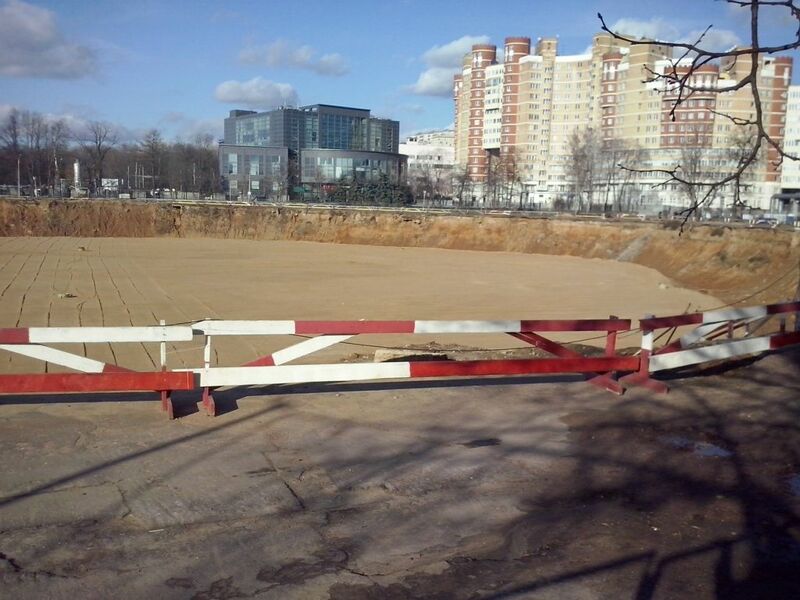 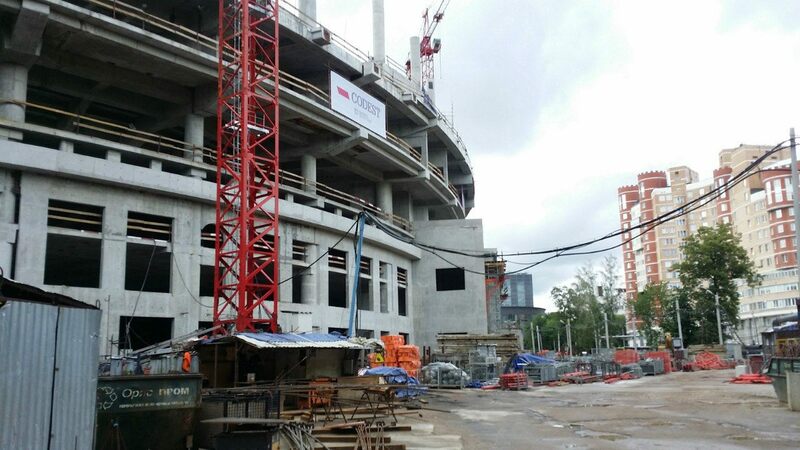 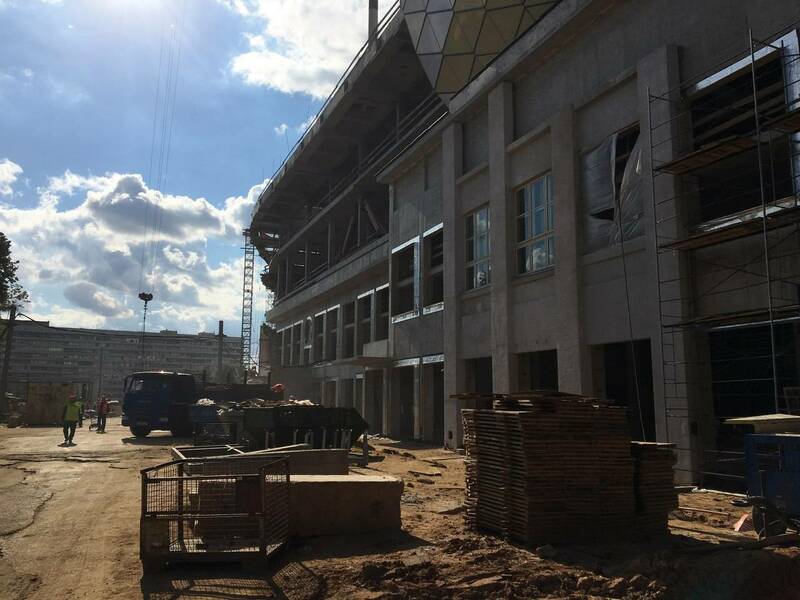 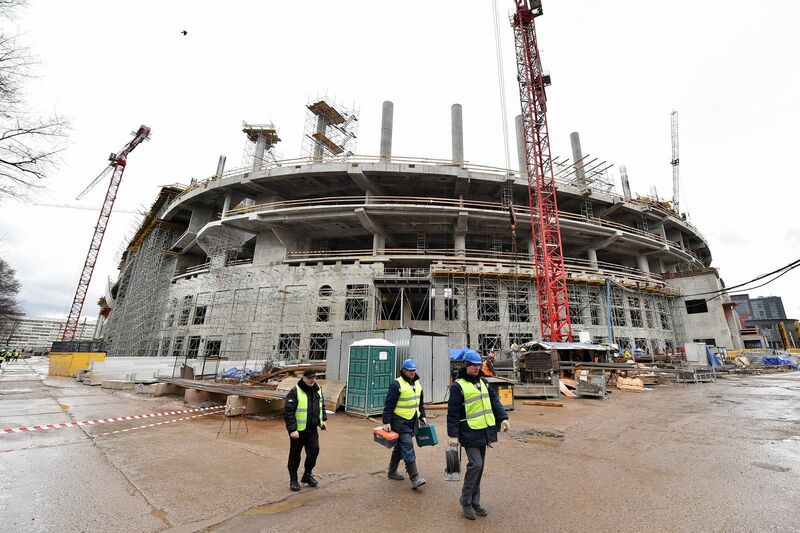 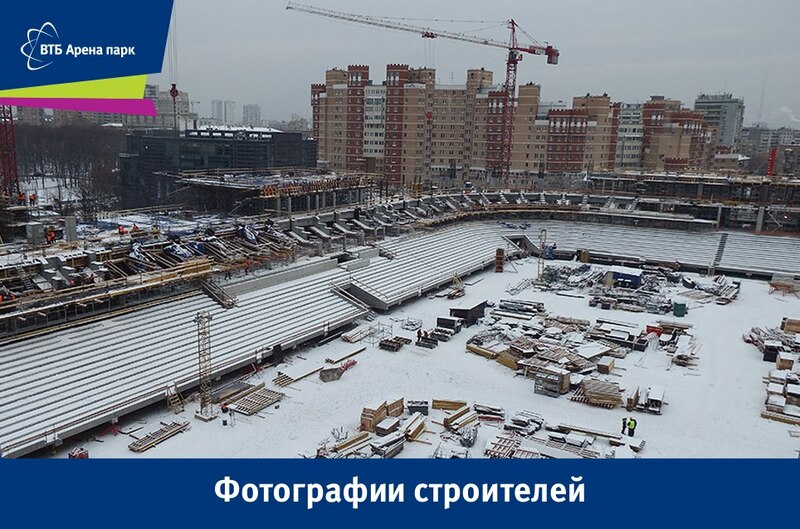 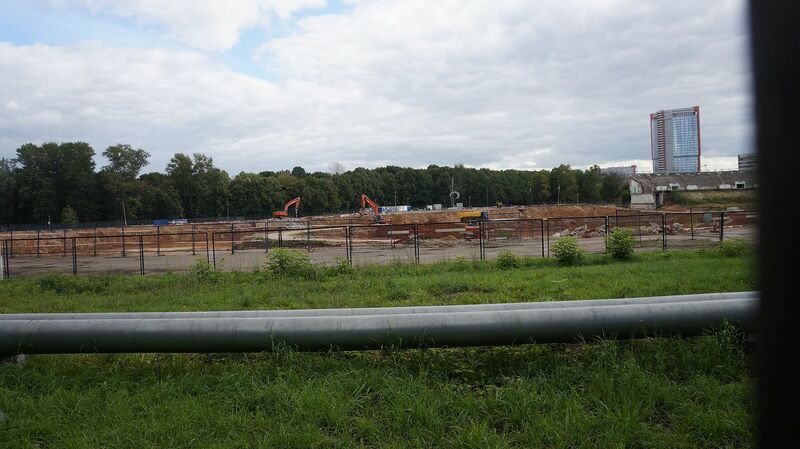 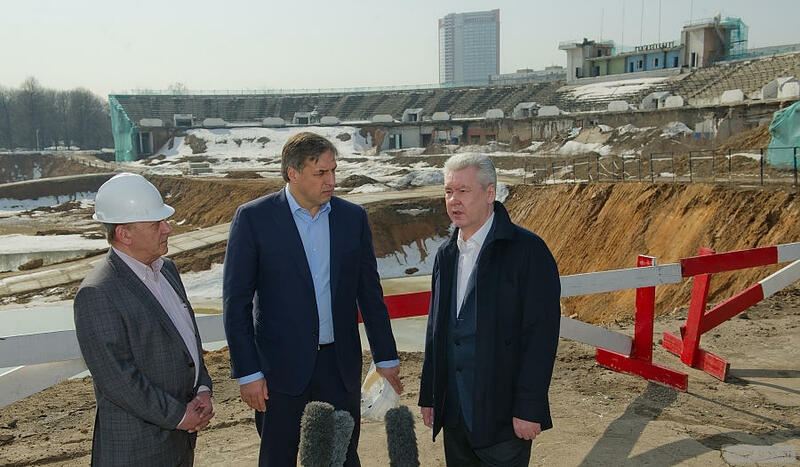 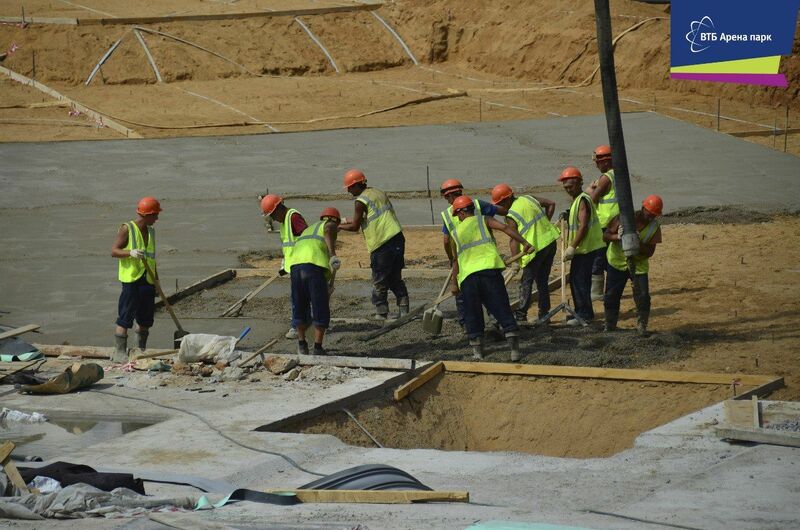 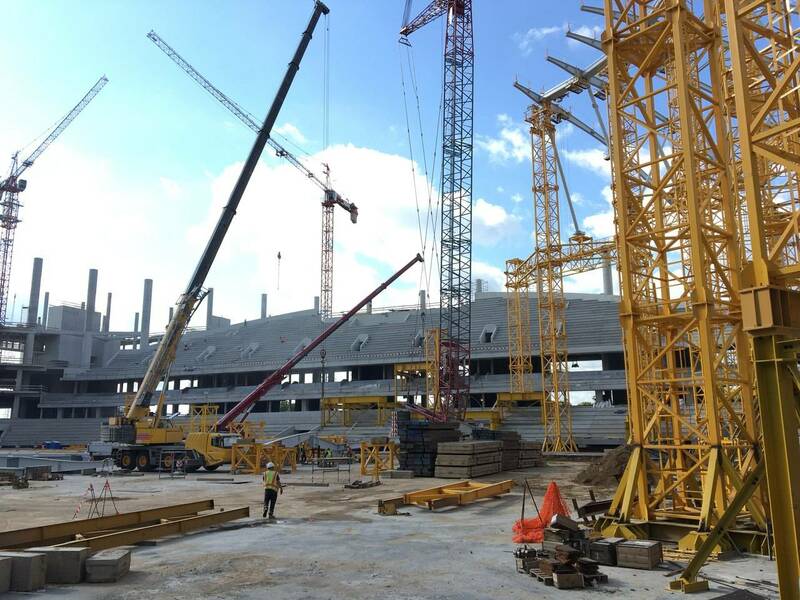 New stadium for Dinamo Moscow won't be ready until 2017 after redesigning works were done. 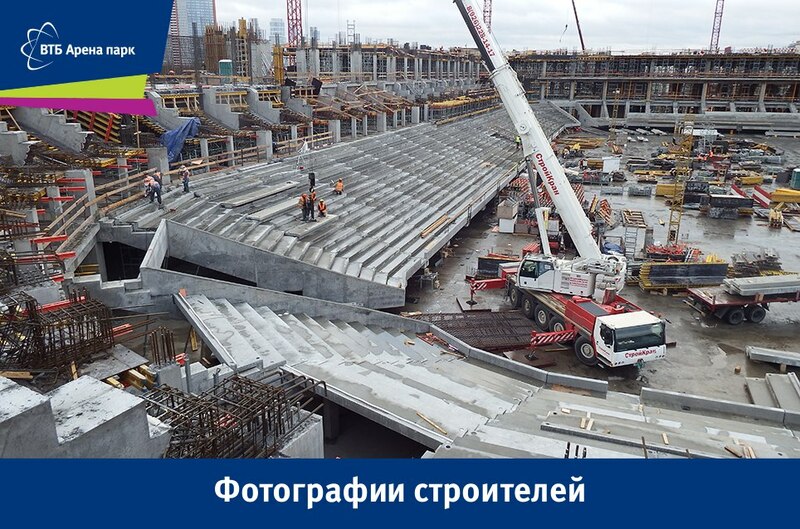 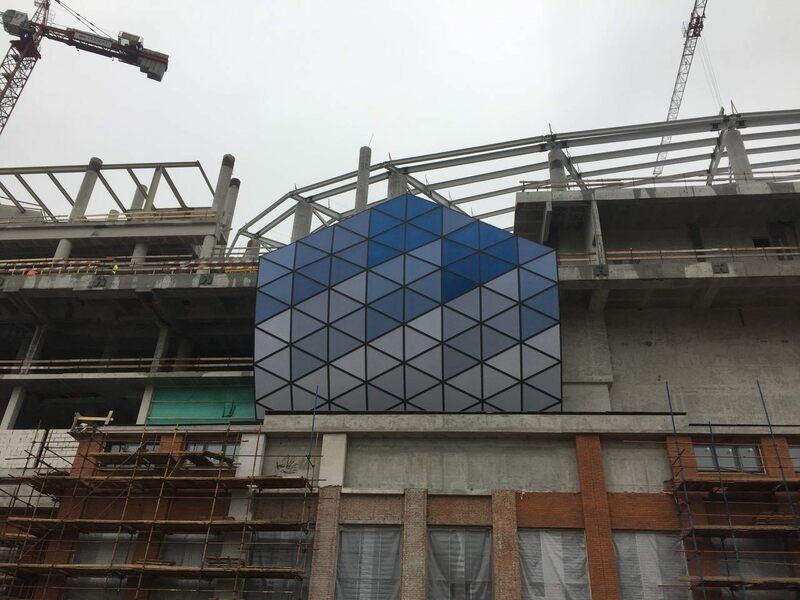 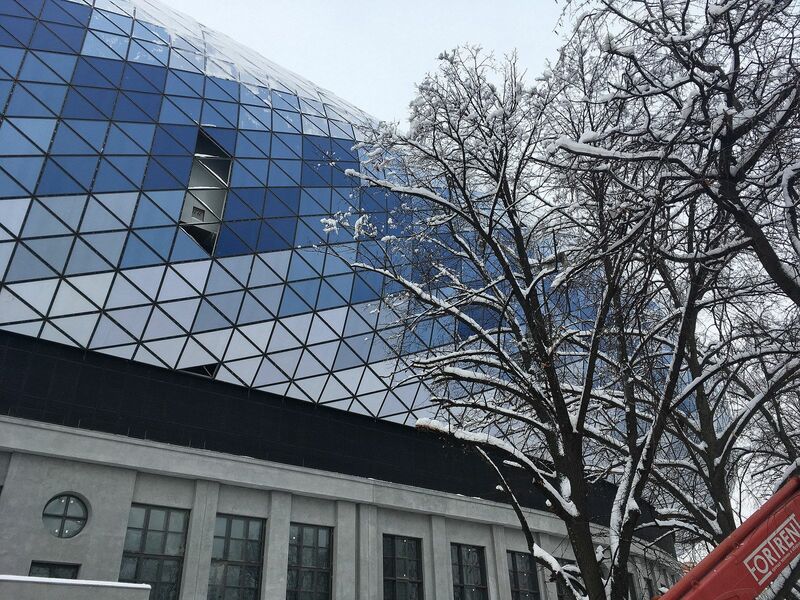 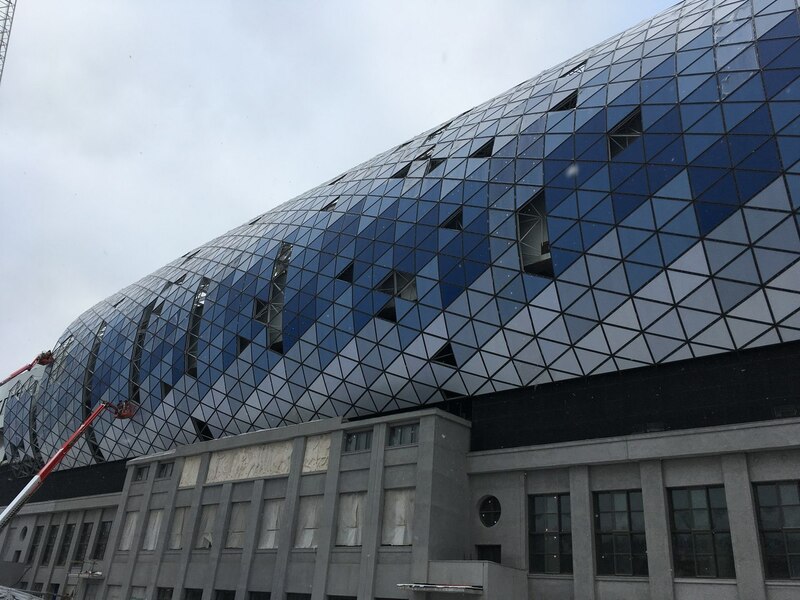 Soon we should know the planned look of VTB Arena after design amendments. 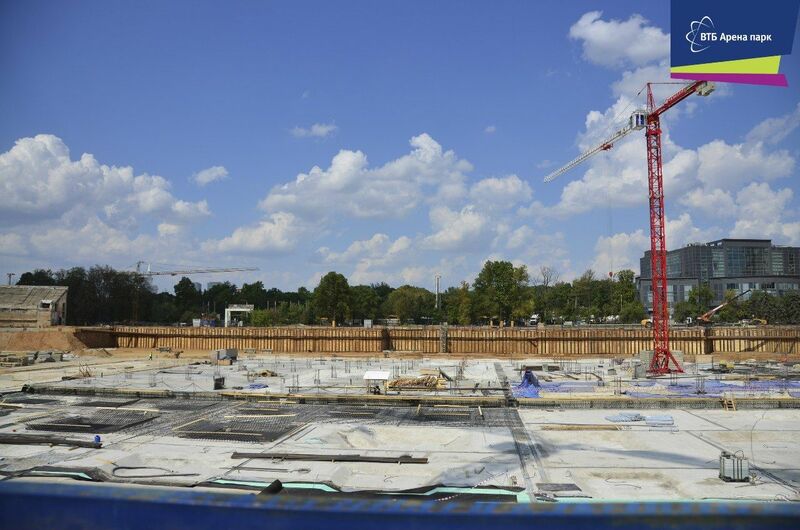 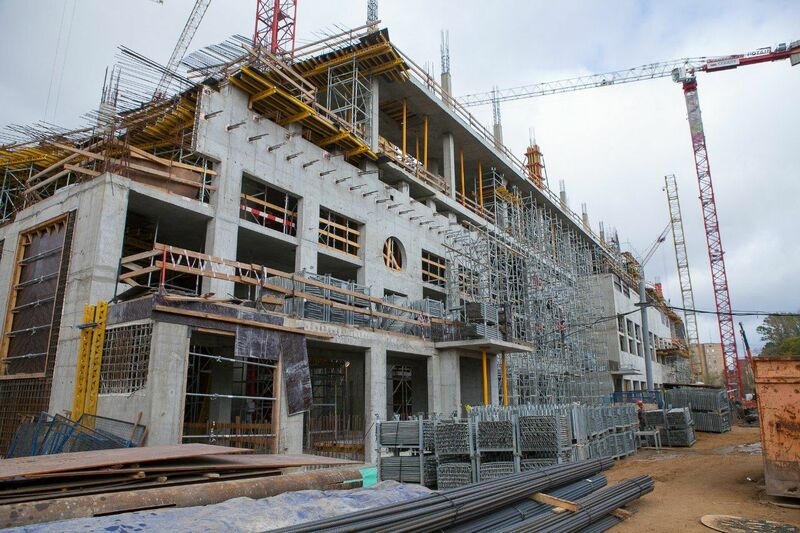 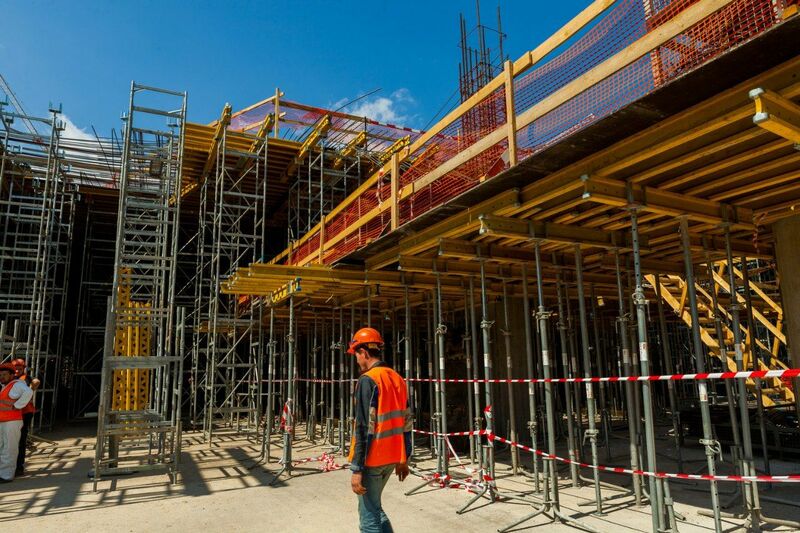 The ground will be smaller than anticipated and entire complex's cost is to fall by 50%. 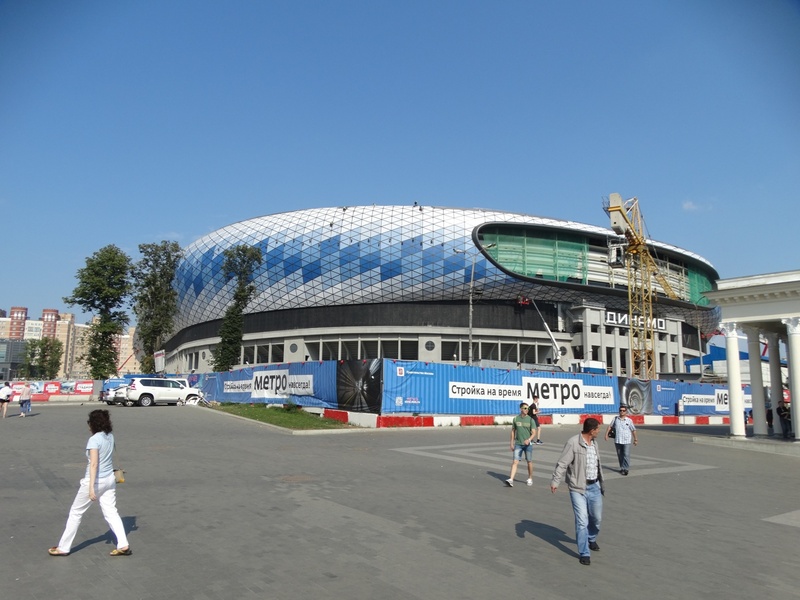 As it didn’t get on the final list of host venues announced by FIFA, VTB Arena no longer needs the 45,000 capacity. 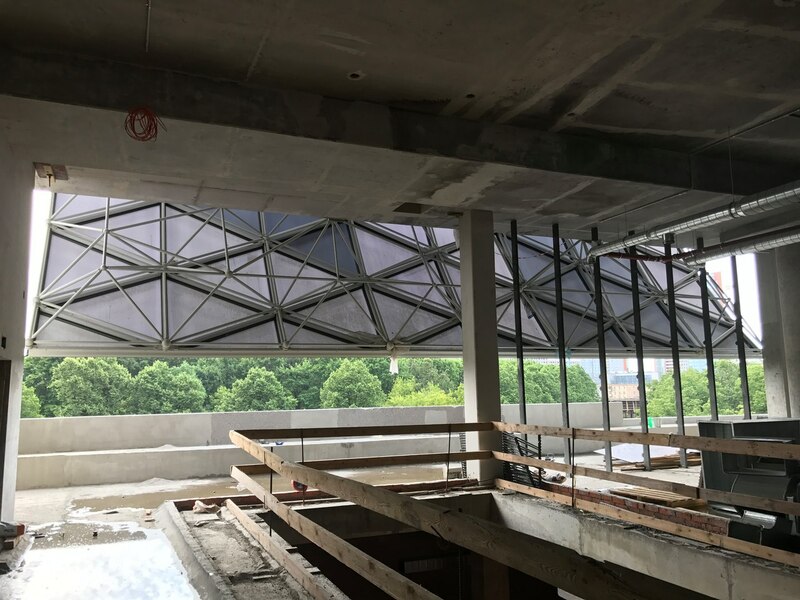 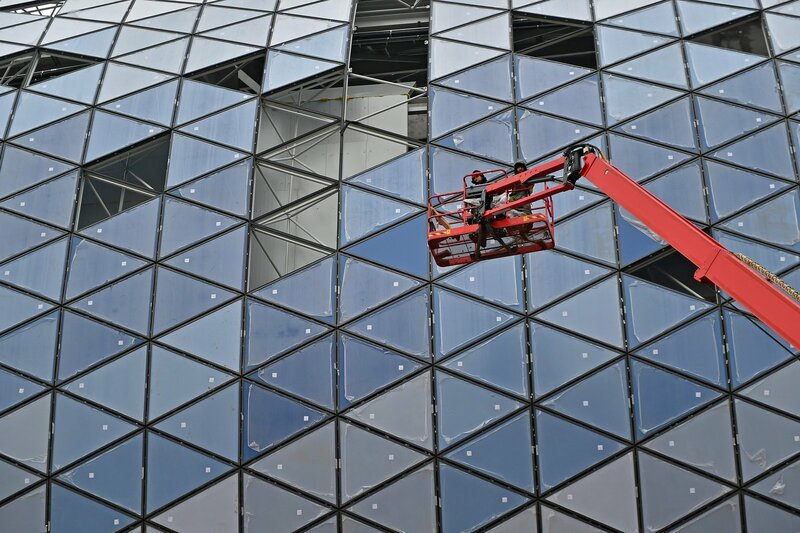 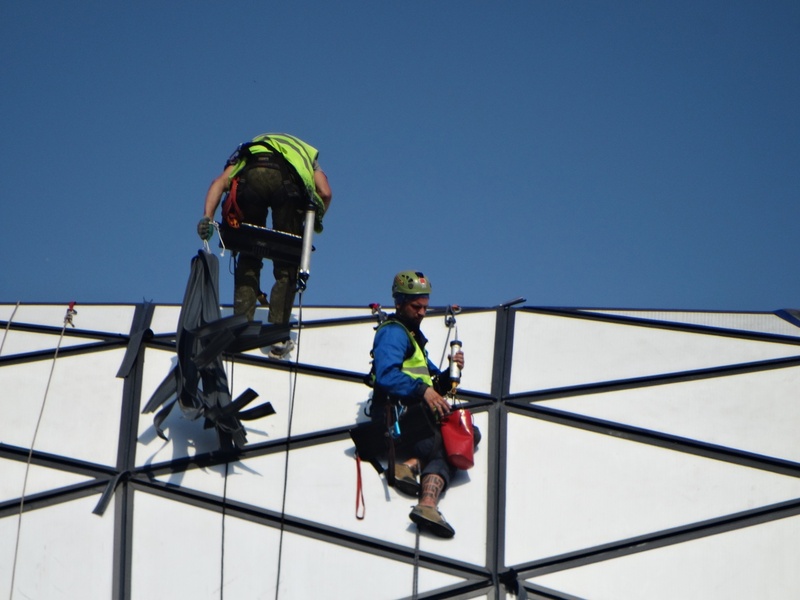 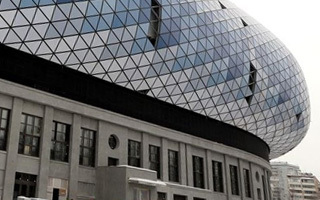 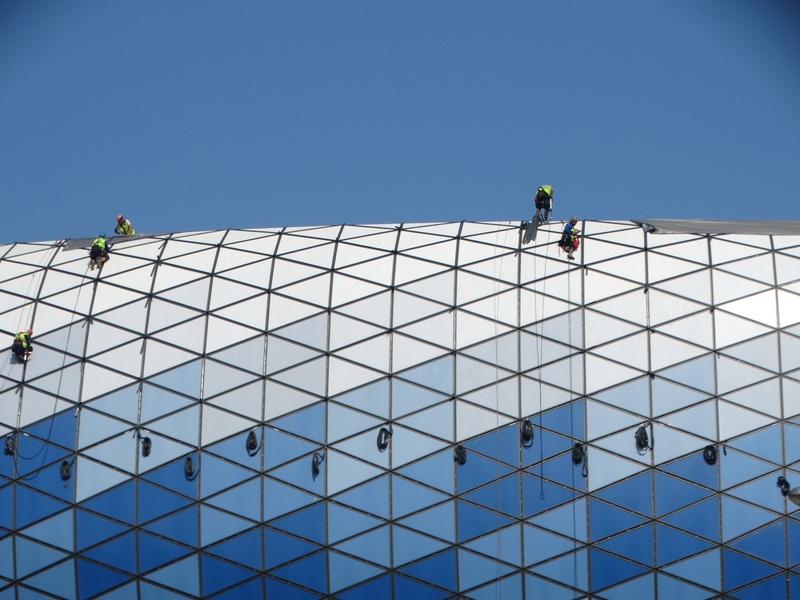 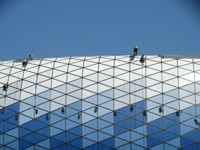 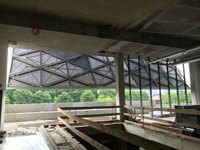 Architects are now scaling it down to save cost and improve comfort of remaining 33,000 seats.